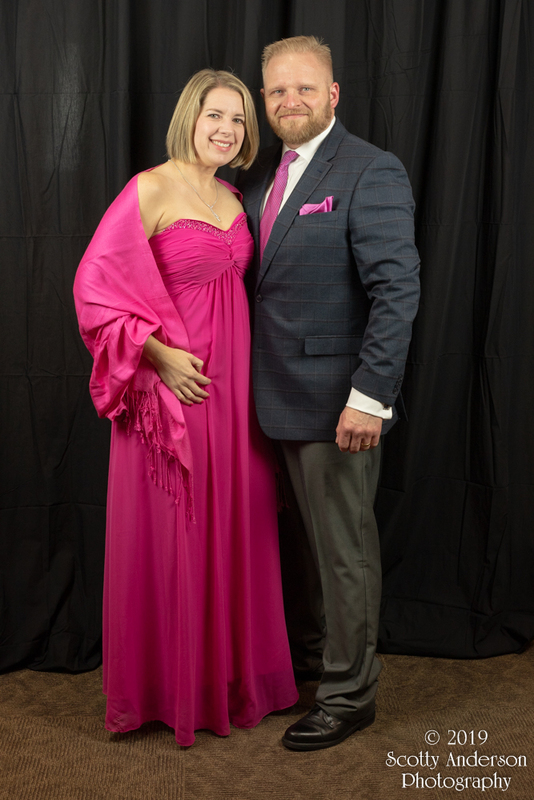 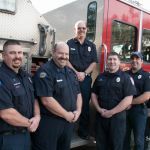 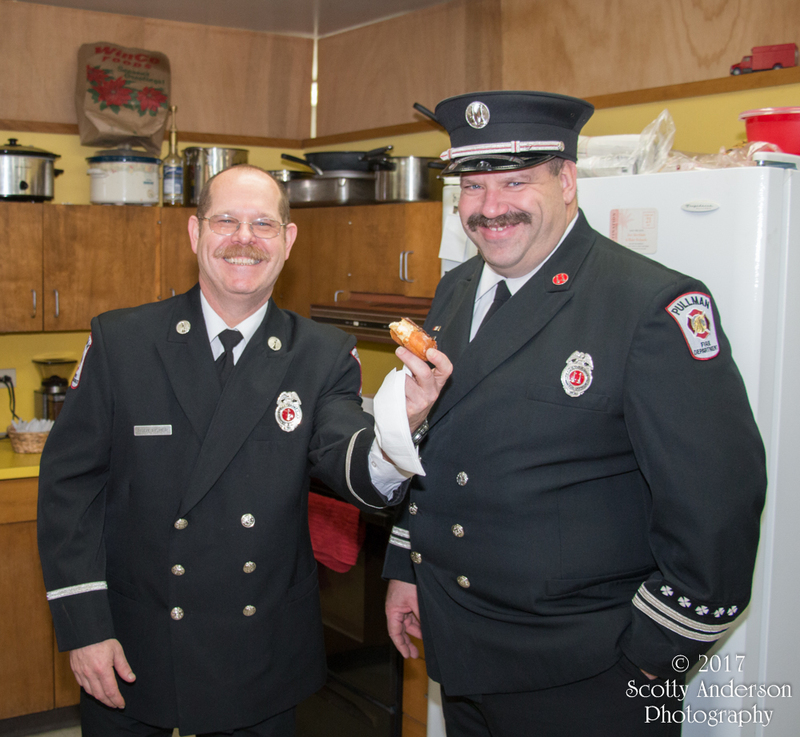 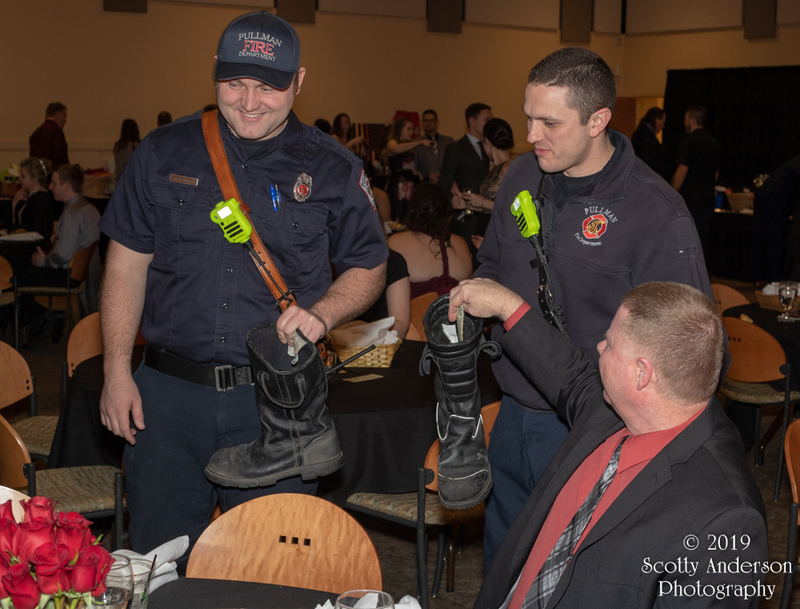 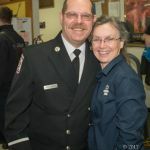 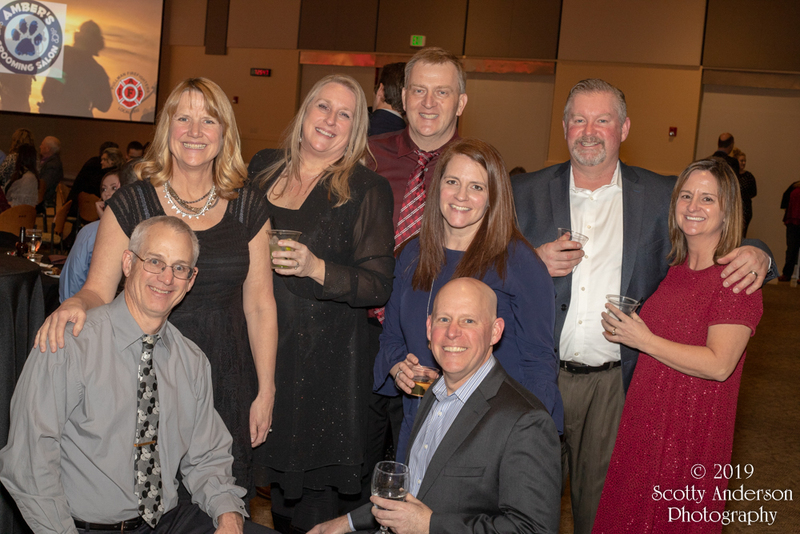 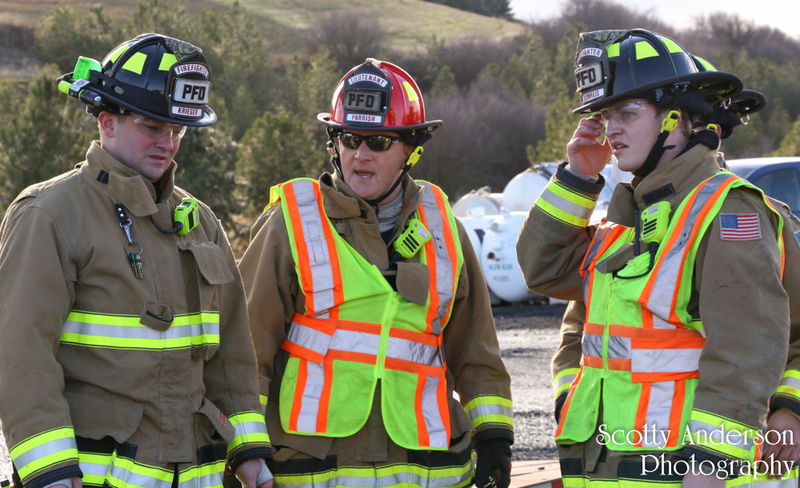 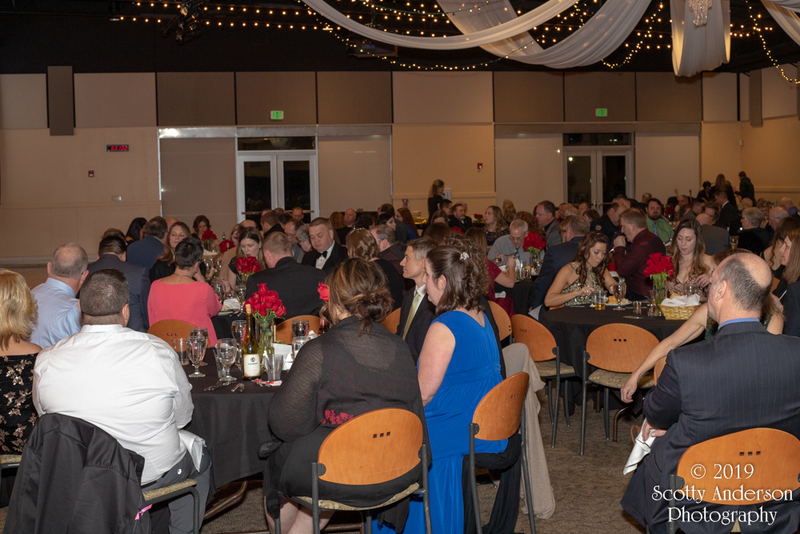 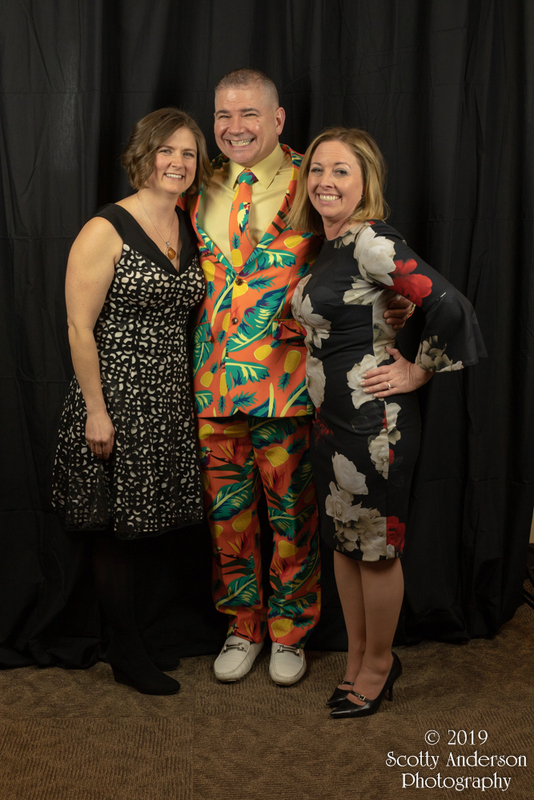 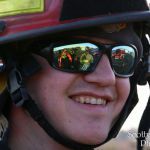 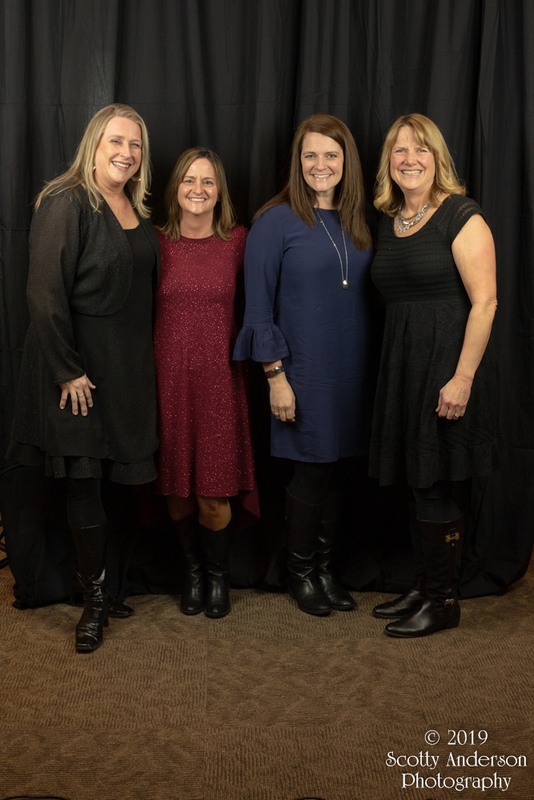 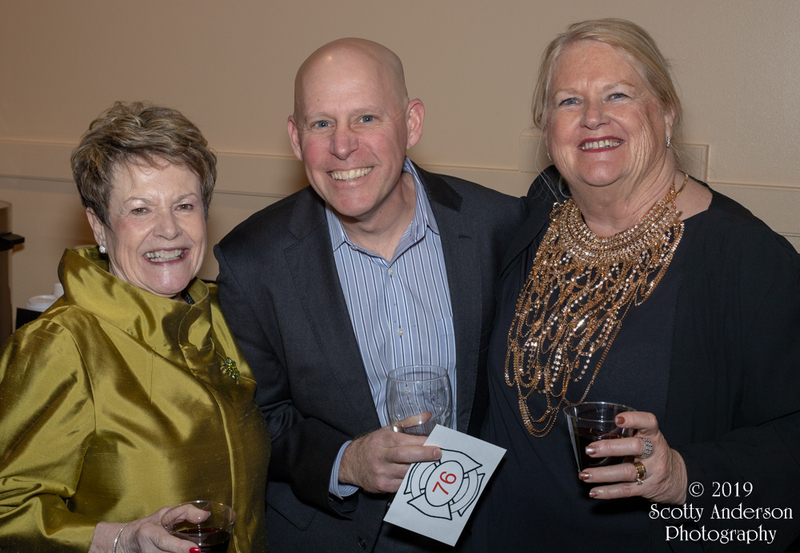 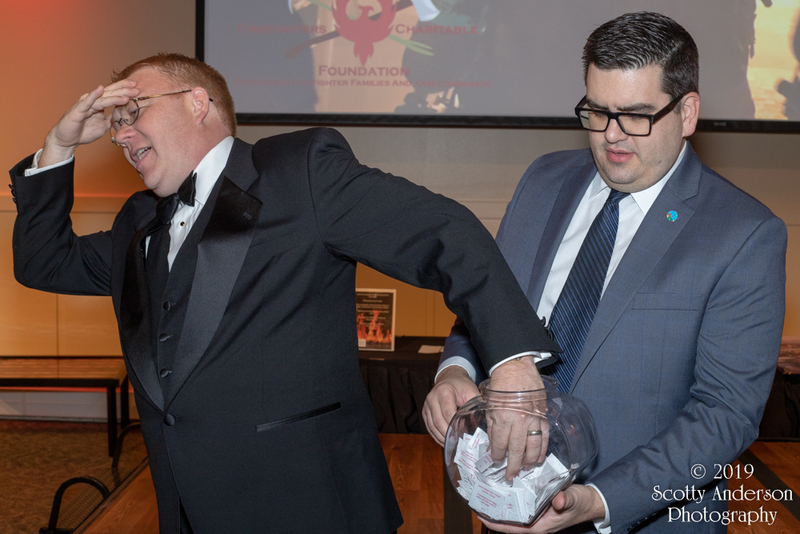 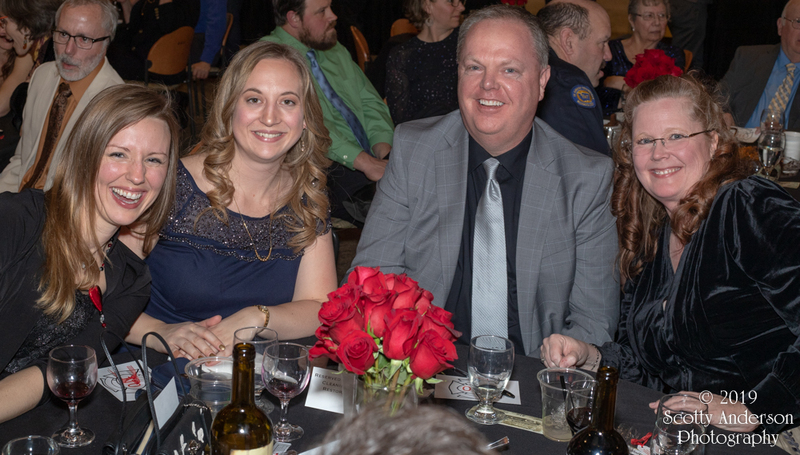 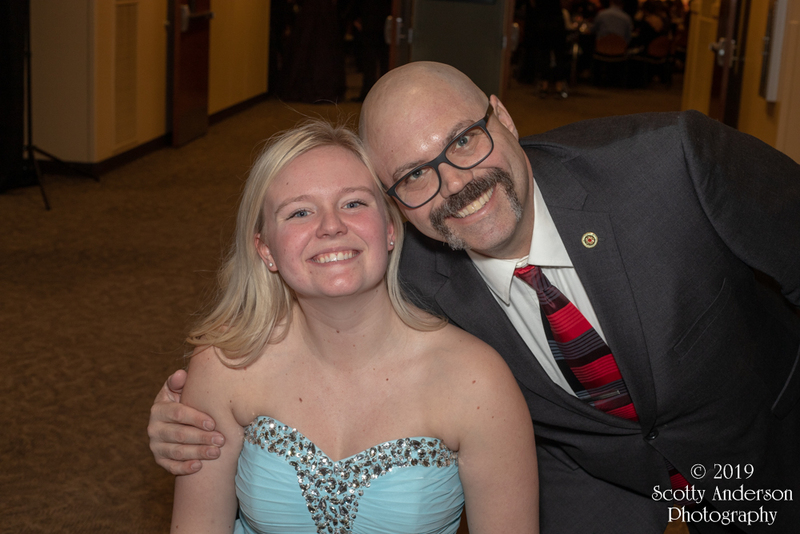 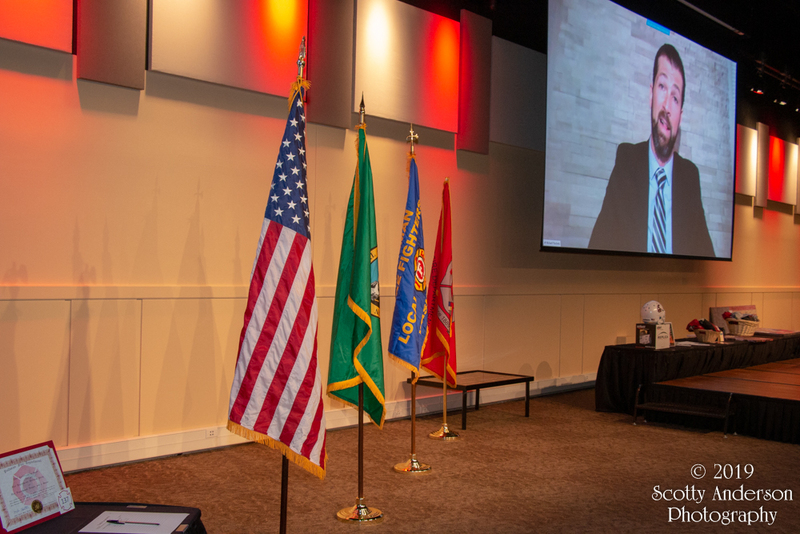 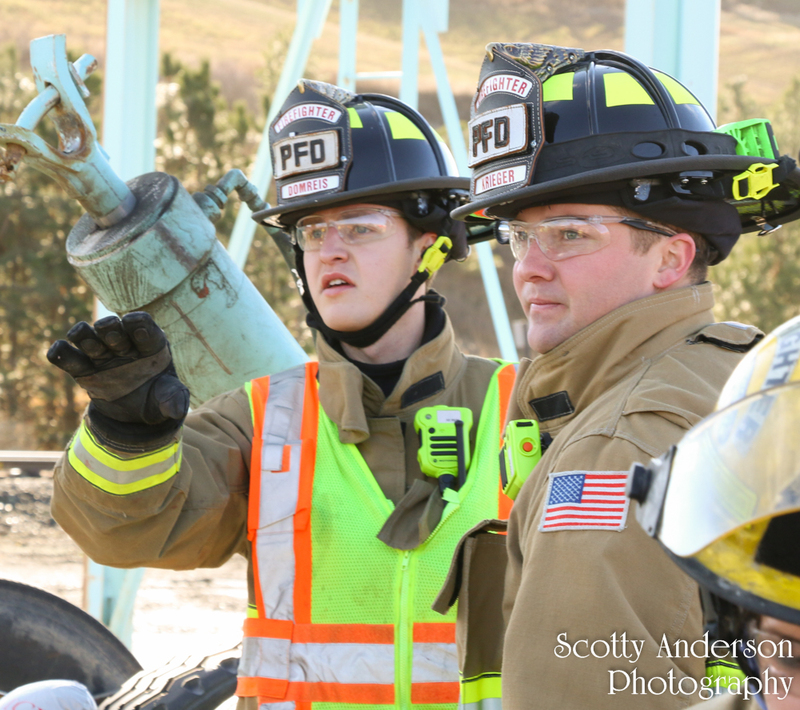 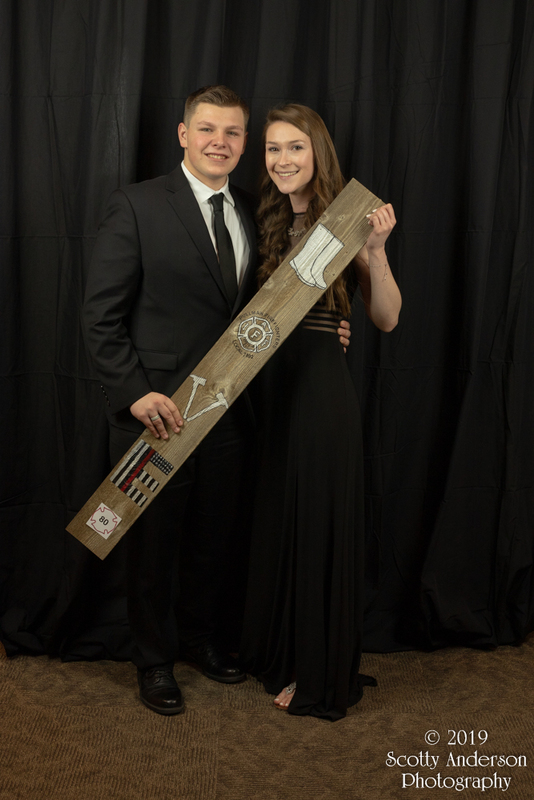 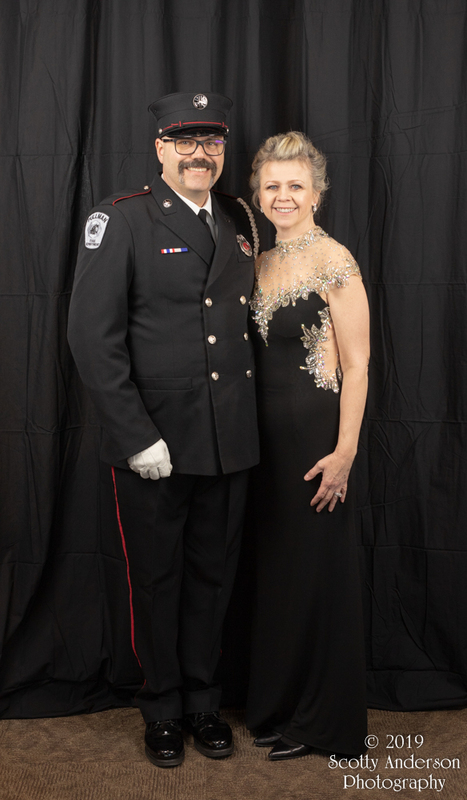 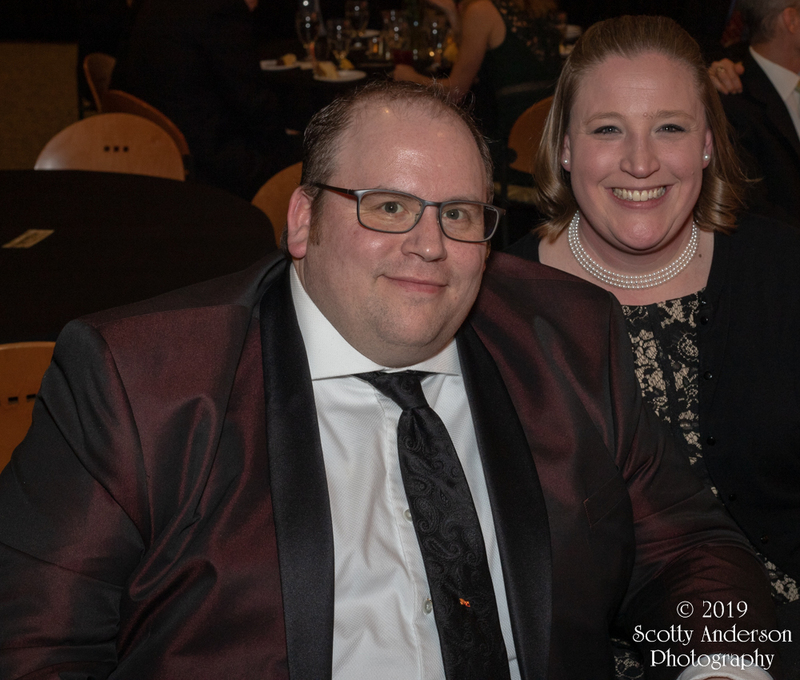 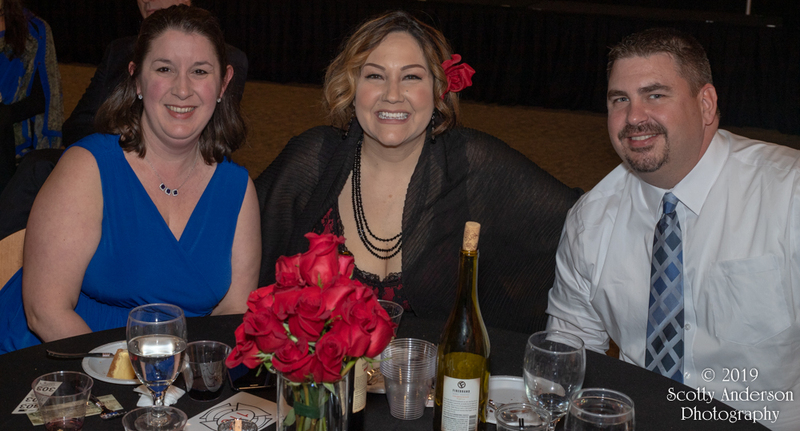 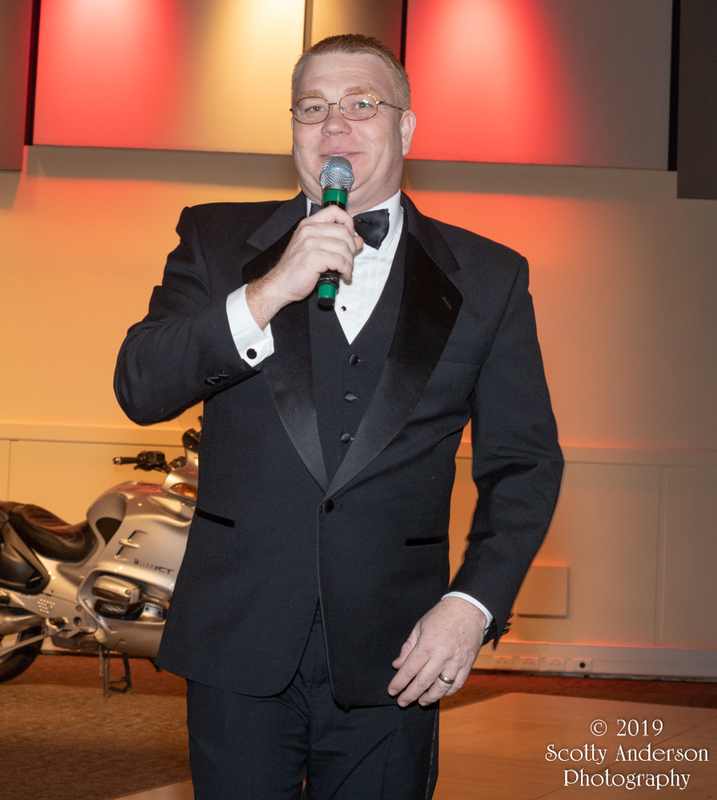 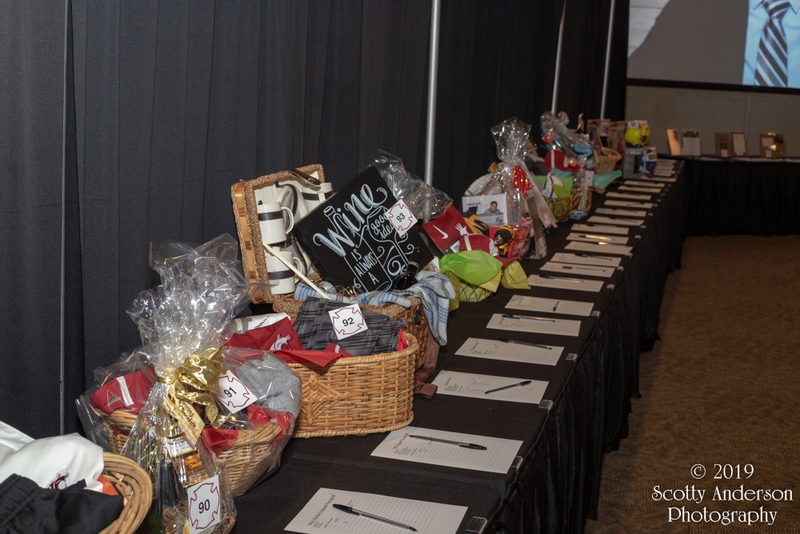 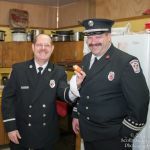 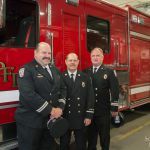 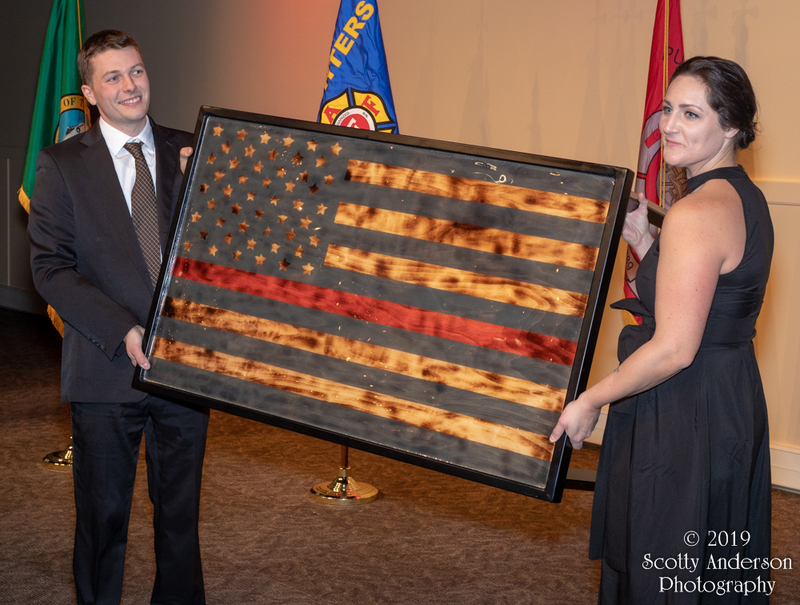 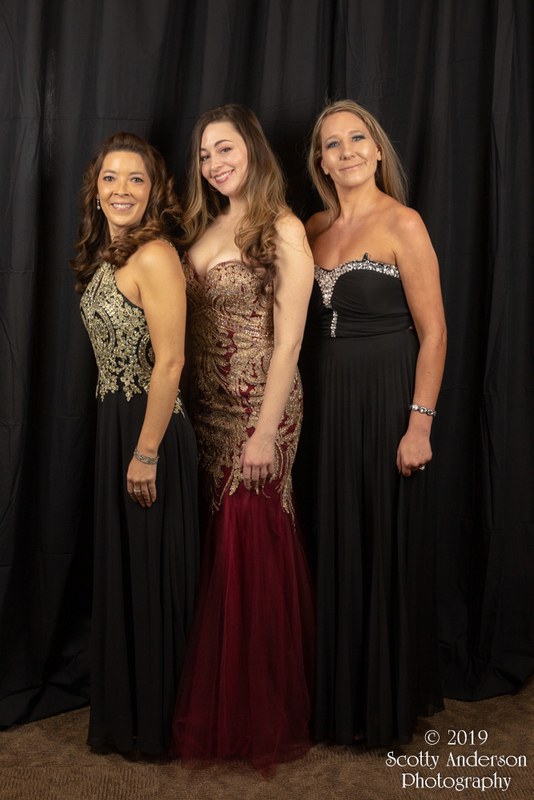 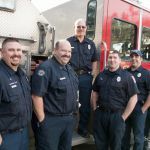 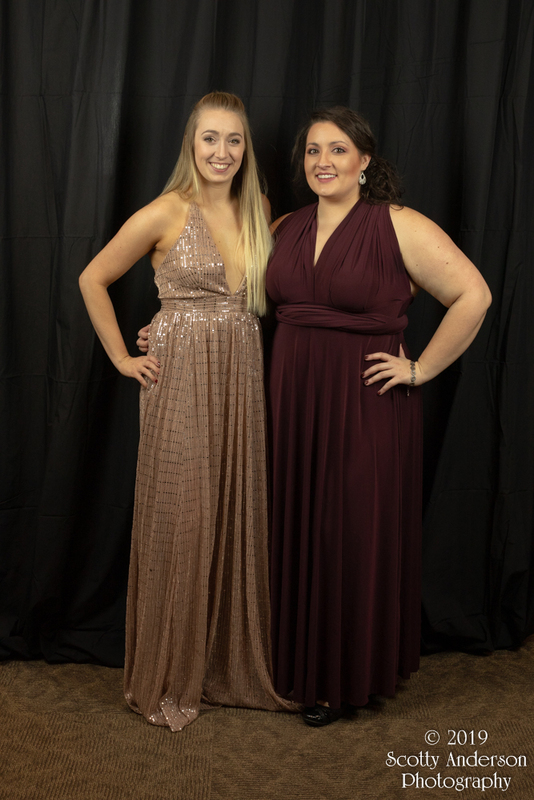 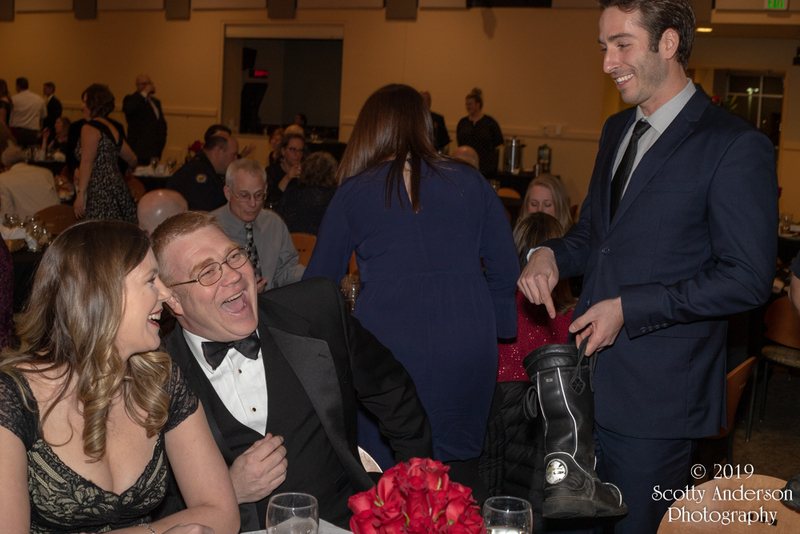 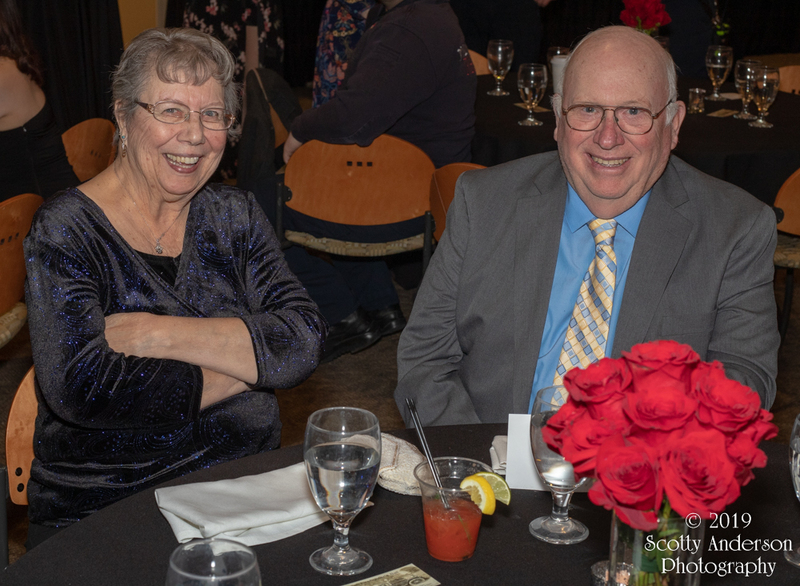 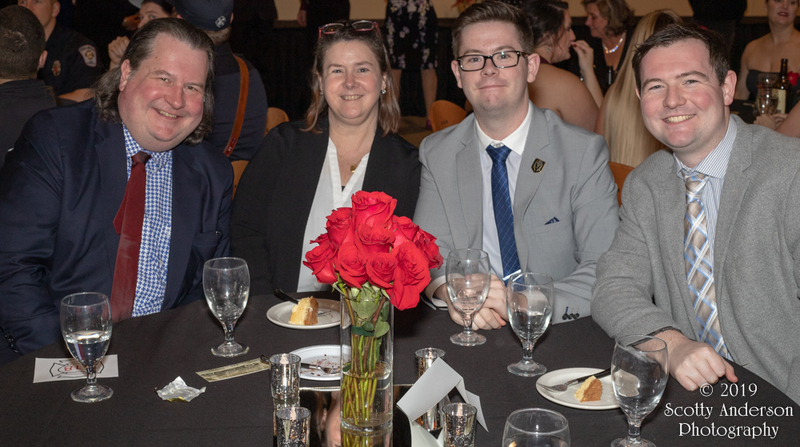 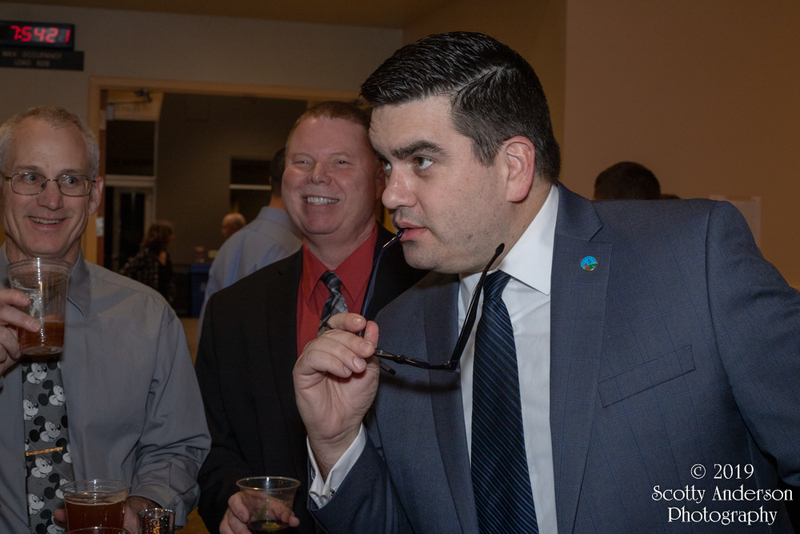 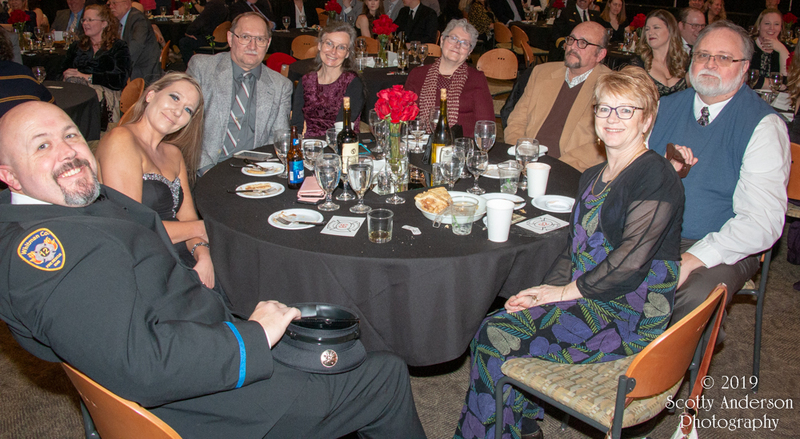 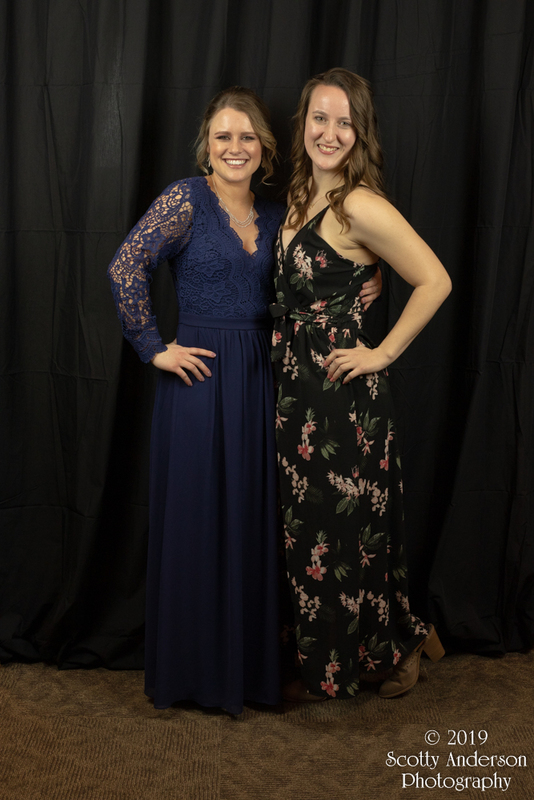 On Saturday, February 9th, 2019 the 3rd Annual Fireman’s Ball was held at the SEL Event Center in Pullman, Washington. 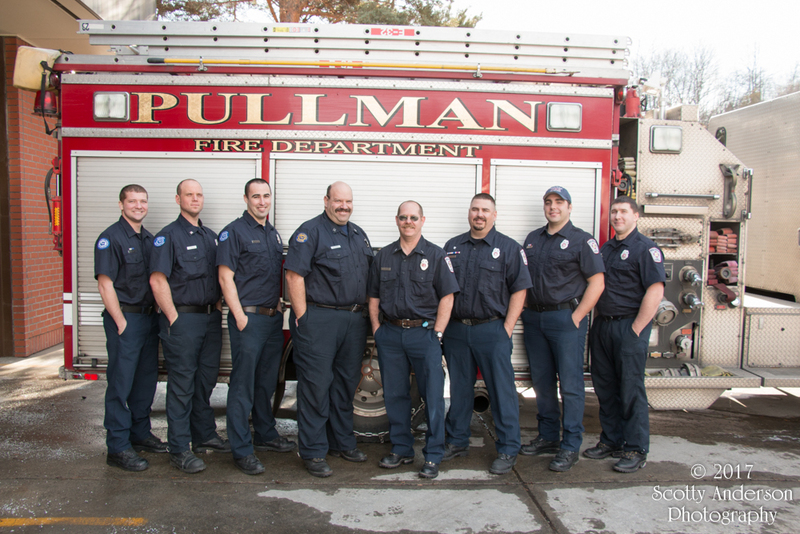 This event is put on by the Pullman Firefighters to raise funds to help individuals who are affected by emergencies. 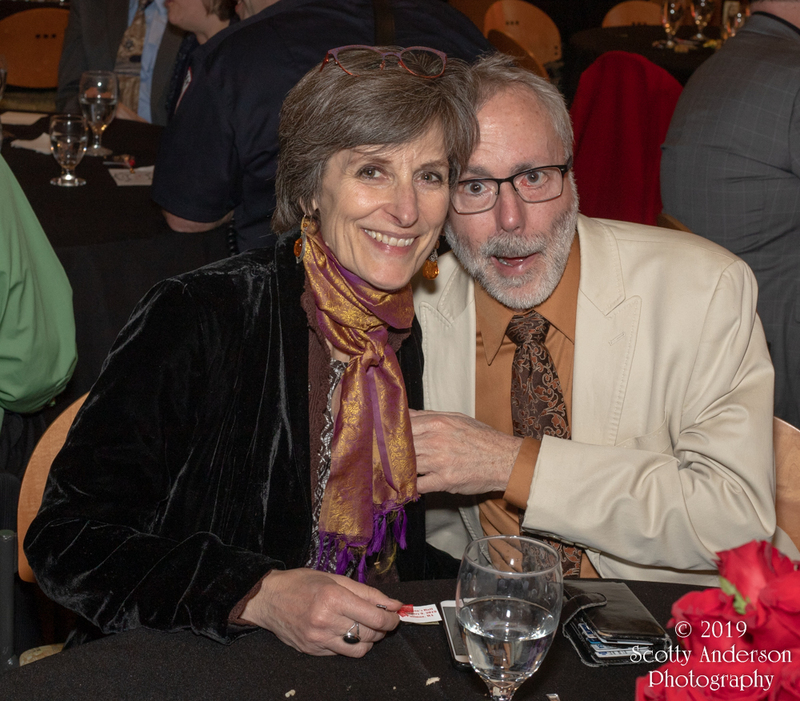 I was asked to take photographs for the event. 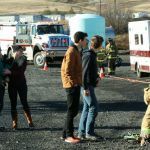 It was set up in two areas. 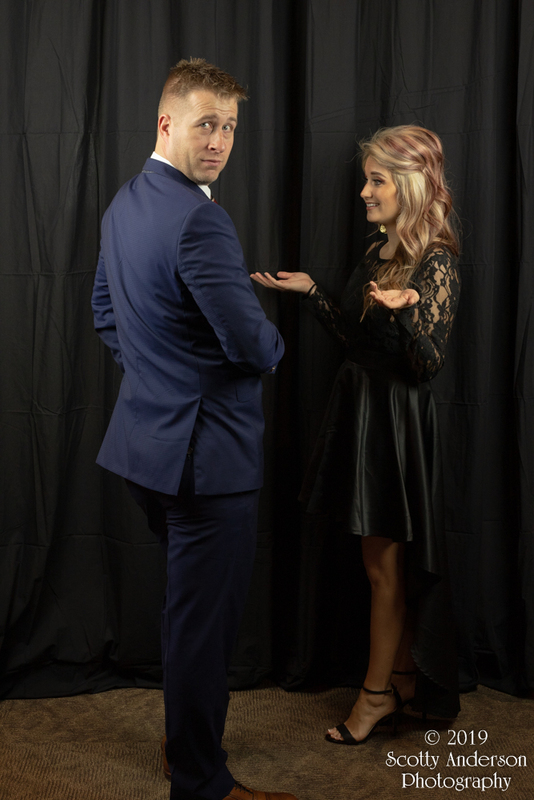 One was to do “couples” photos and the other was just candid shots from the event. 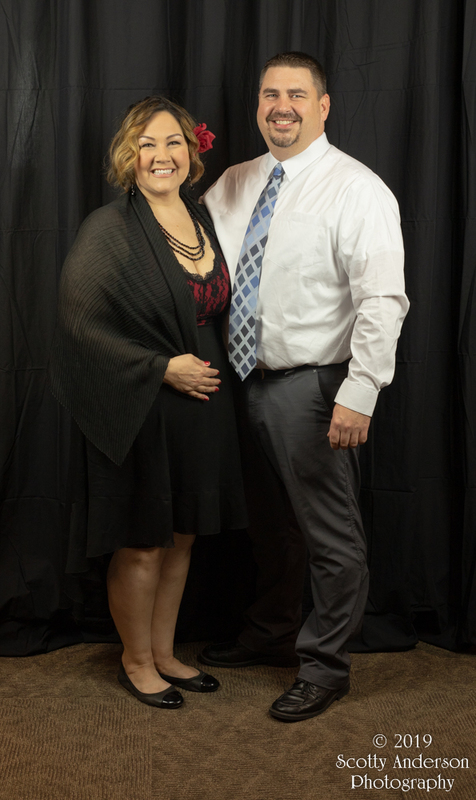 My setup was the solid black background hanging free. 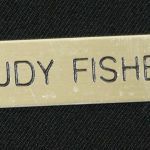 It was illuminated with two light boxes. 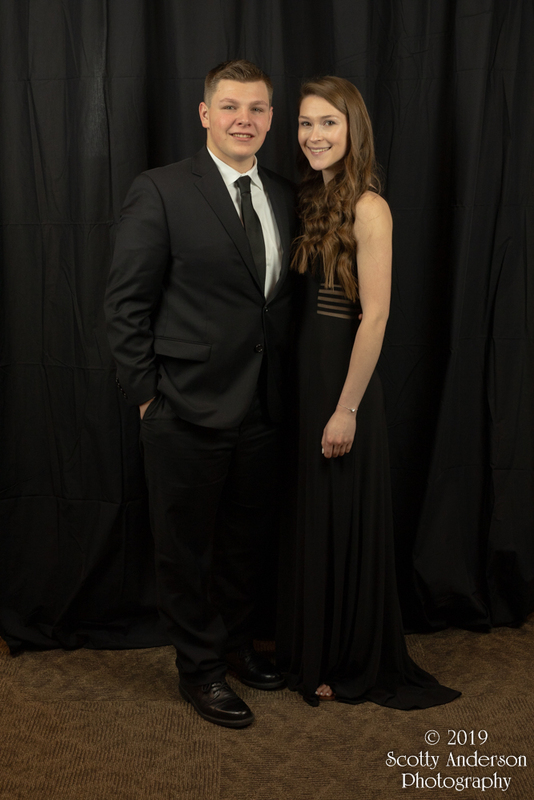 I didn’t have as much light as I would have liked. 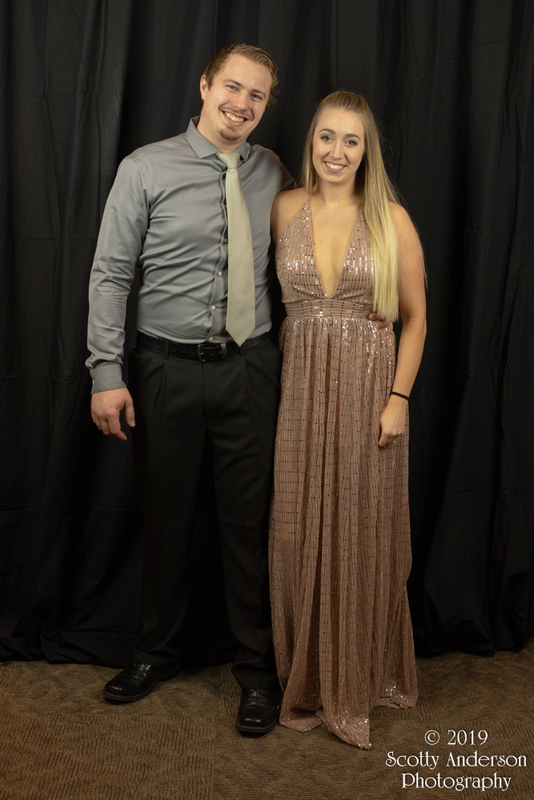 I didn’t use a flash just the light boxes. 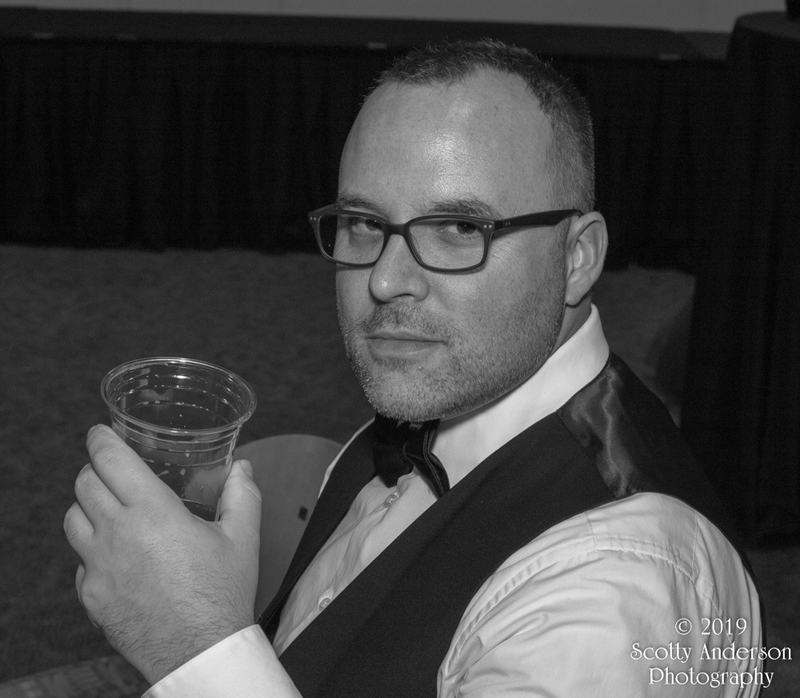 I used my Canon 6D with a 50mm prime f/1.2 lens. 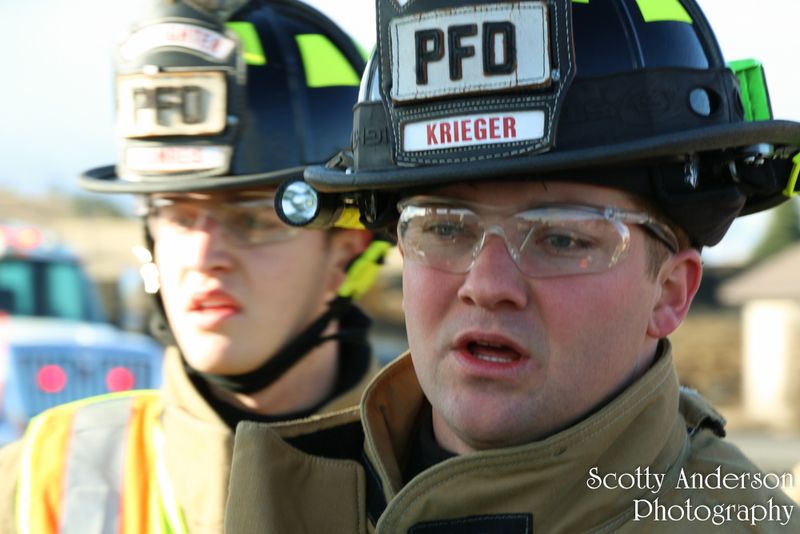 I wanted to ensure I had a good depth of field so I used f/8. 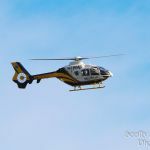 Even with a speed of 1/60th of a second for the shutter I was forced to increase the ISO setting to 1000. 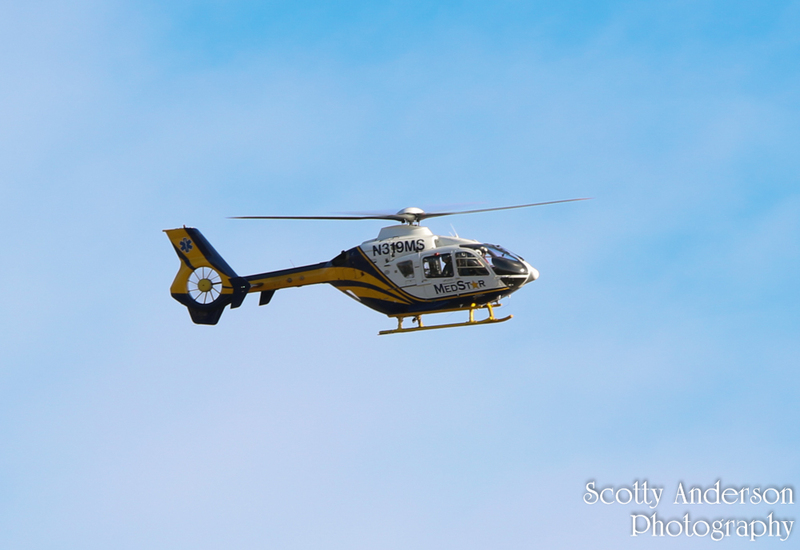 Way higher than I would have liked but the best I could do with the other settings and the lack of lighting. 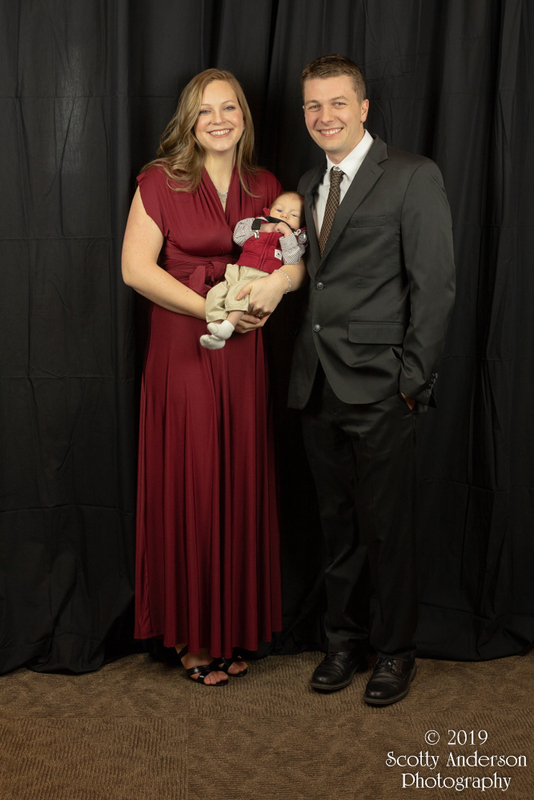 I just need more light boxes or other lighting without the flash. 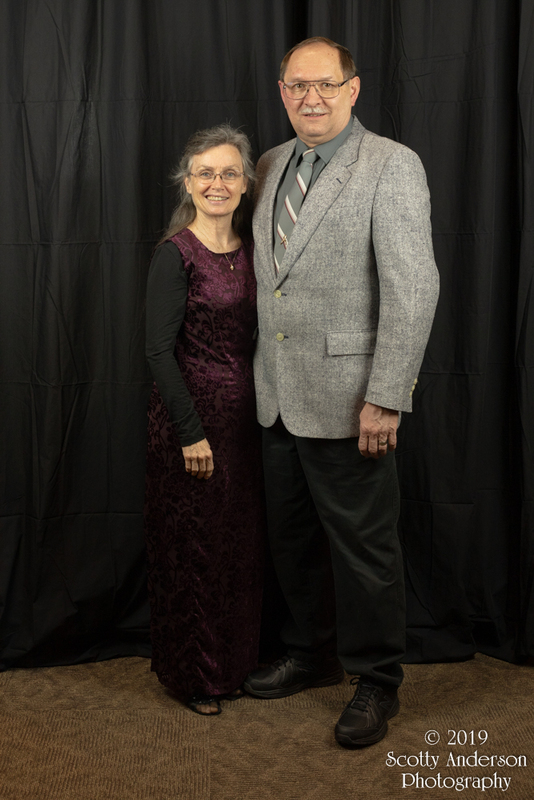 I have been unhappy with the flash near the camera due to the shadowing I get on my backgrounds. 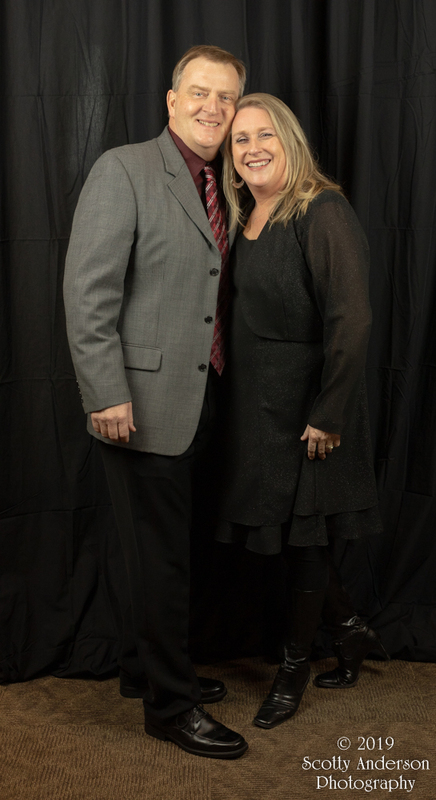 Maybe I just need the umbrella flash system. 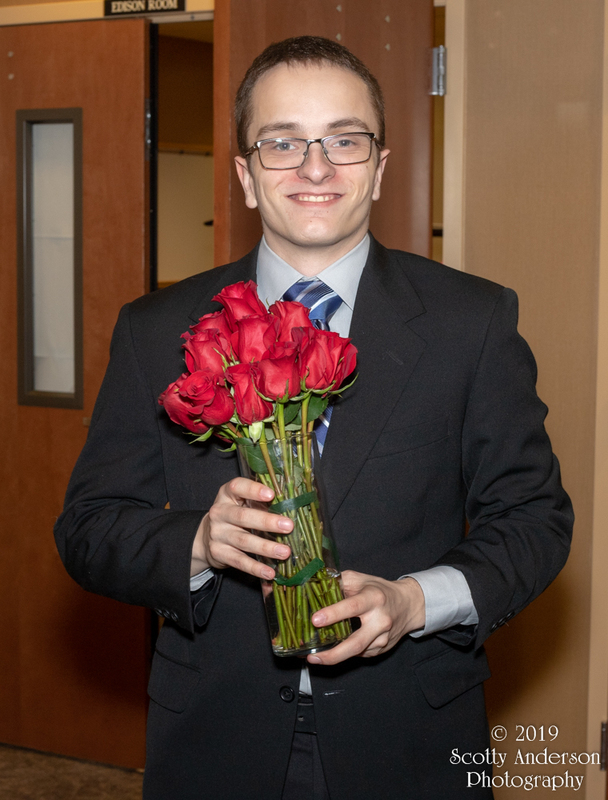 Nonetheless they are not terrible but they are not as sharp as I would have liked. 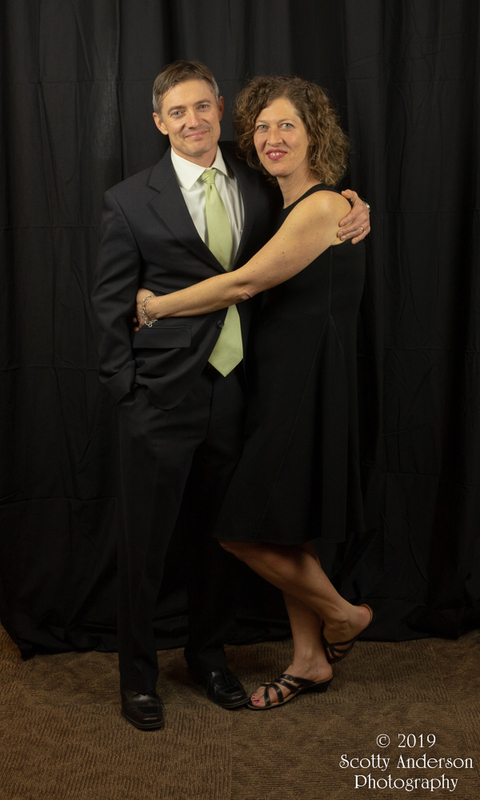 This was also the first time to do real “couples” photos. 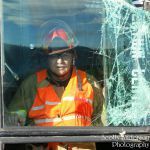 So I see some things I would do differently next time. 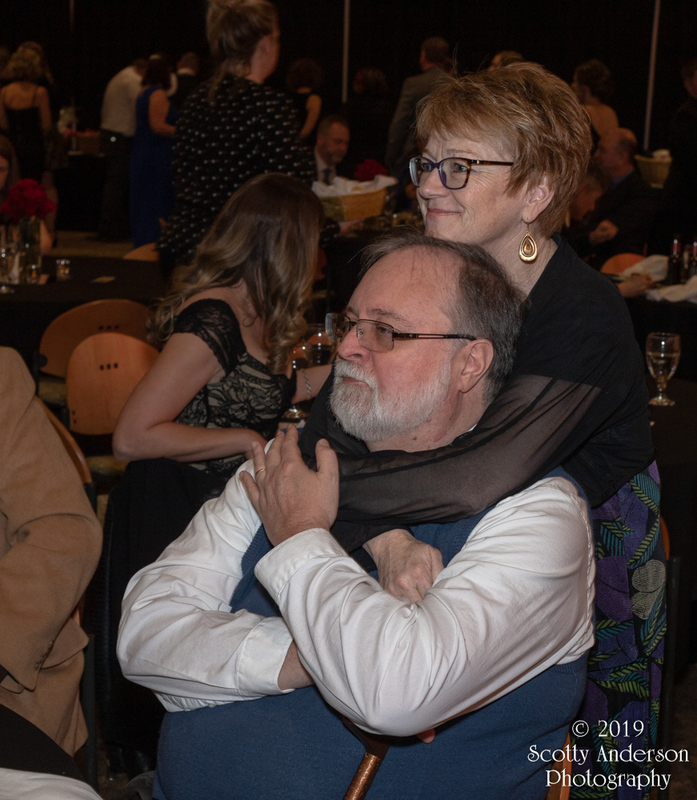 I allows people to get into their own poses. 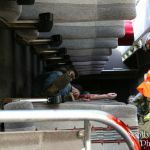 I didn’t scrutinize anything but I think I will give some helpful tips for the next time around and stage people better. 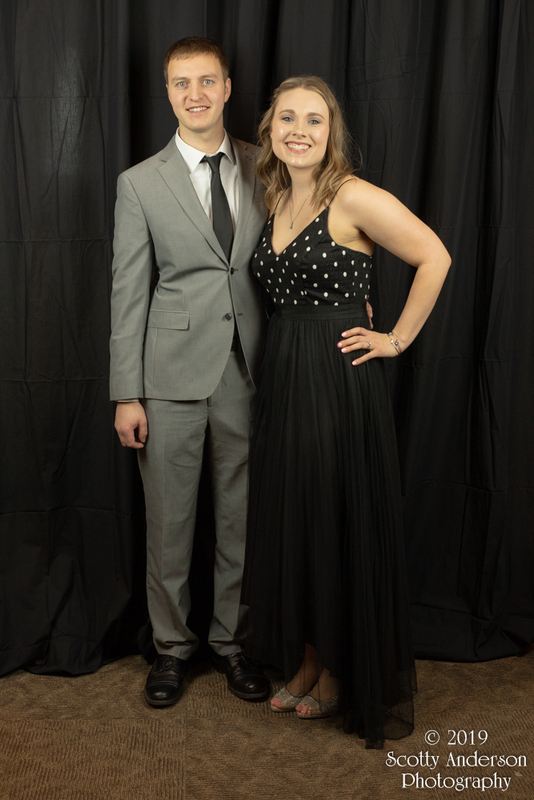 For the candid shots I was in a darker room. 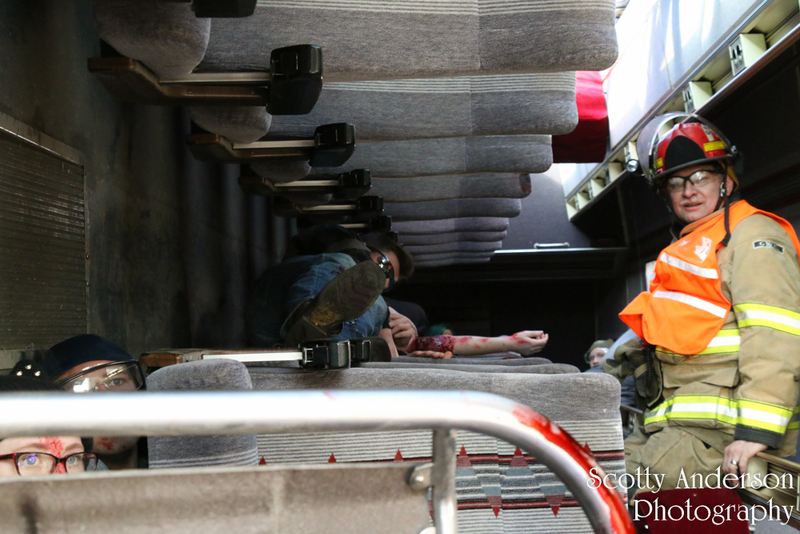 I used both the Canon 70D and 6D camera. 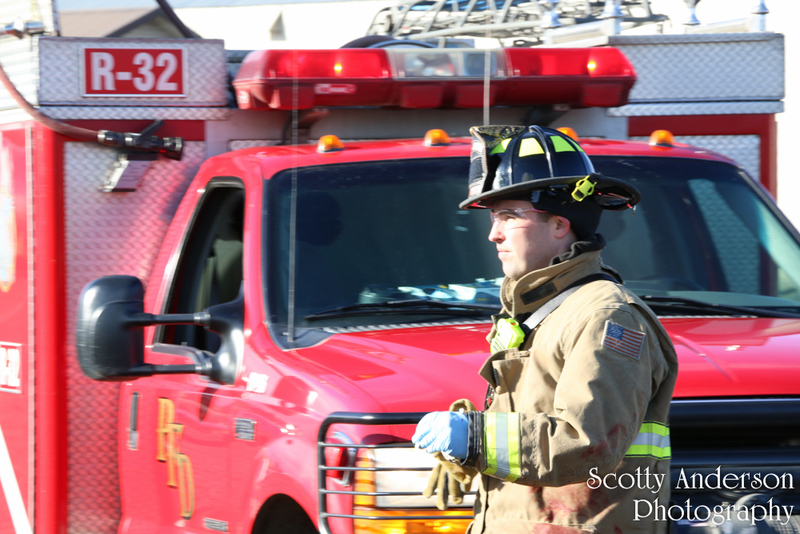 The 70D had a 18-135mm zoom. 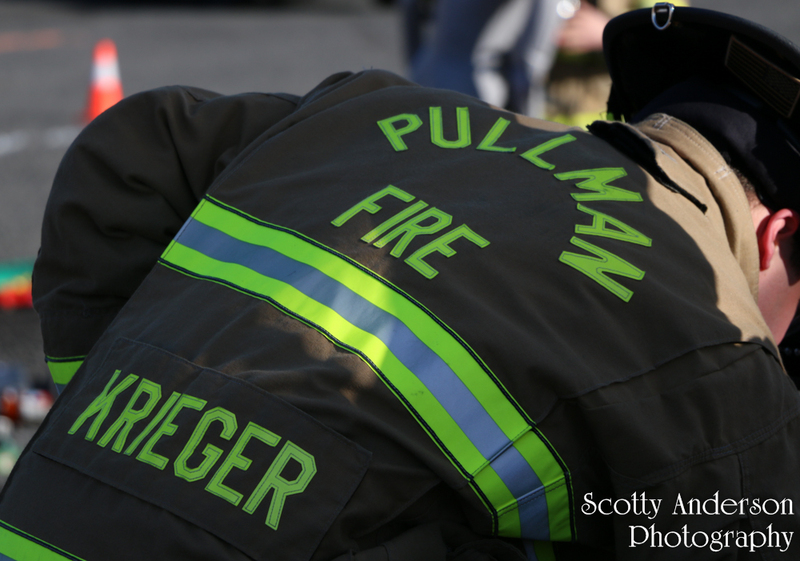 The 6D had the 50mm prime lens. 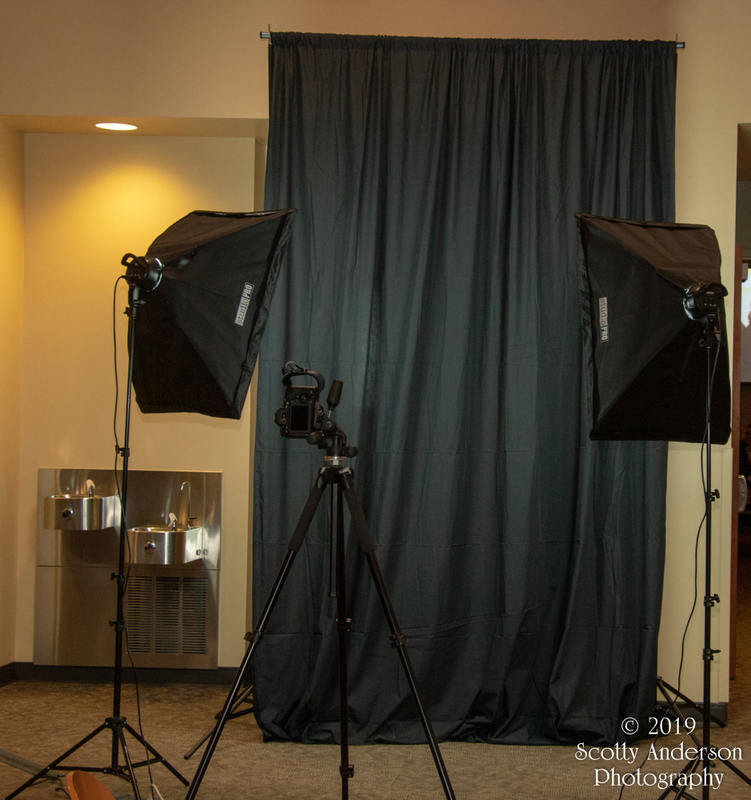 Both cameras had external flashes with a light diffuser. 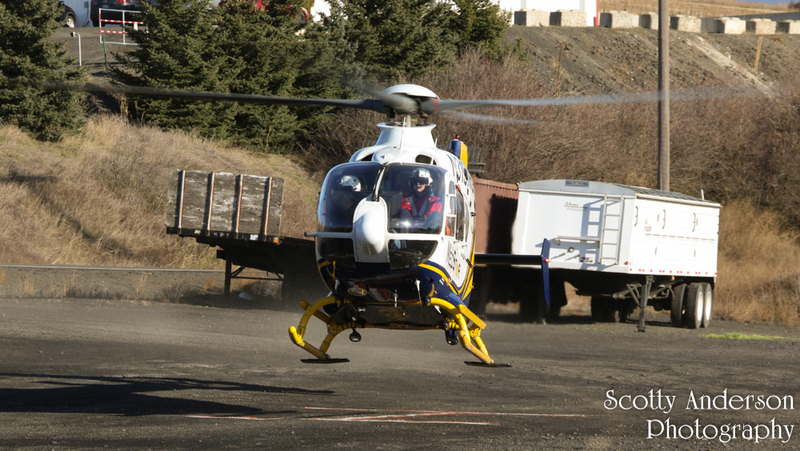 Both had ISO settings into the 1000-1600 range. 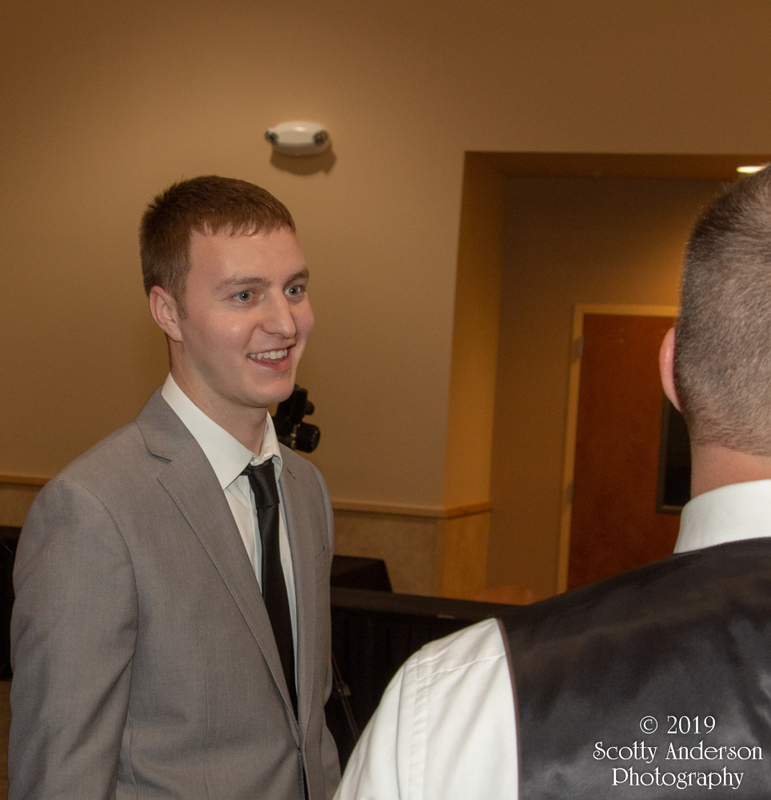 I think overall the candid shots turned out as good as I was going to get them with the lighting at hand. 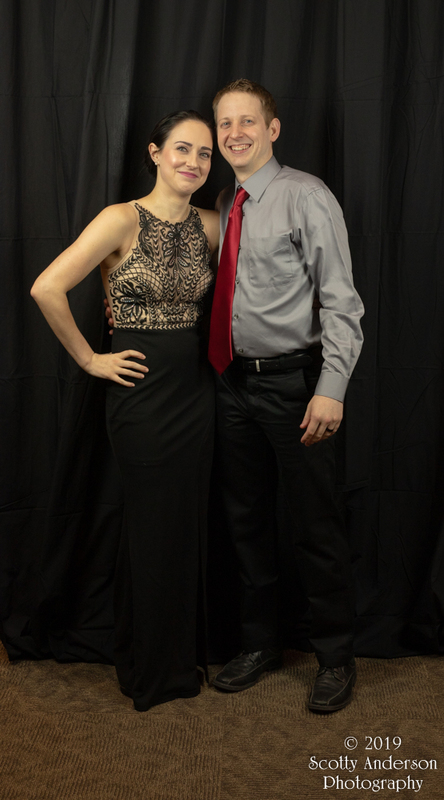 Again I think I could have done better with my flash usage and I will work on that in the future. 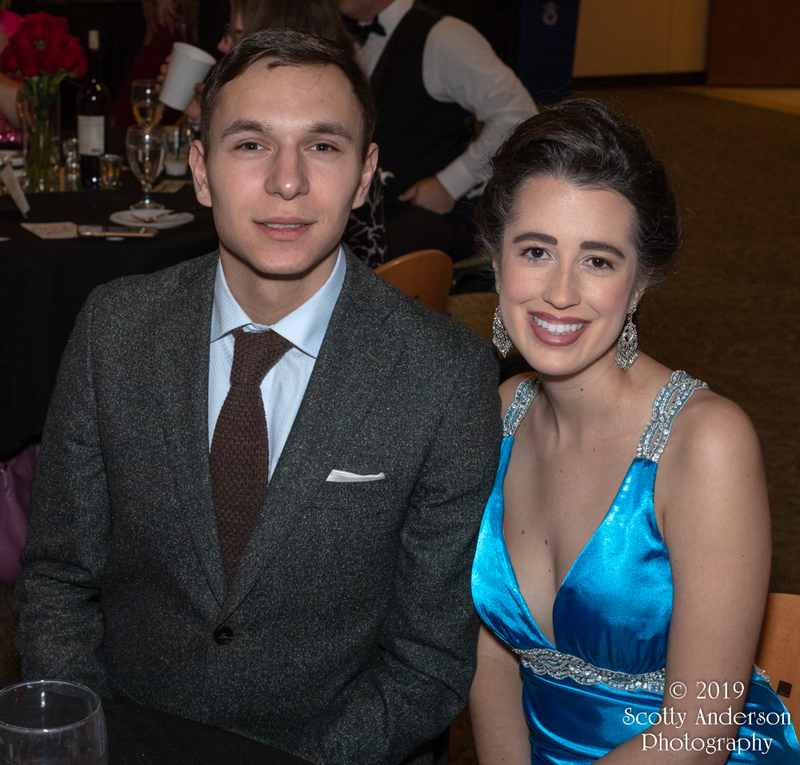 I tried to make my way around to the tables and get some candid couples shots there too. 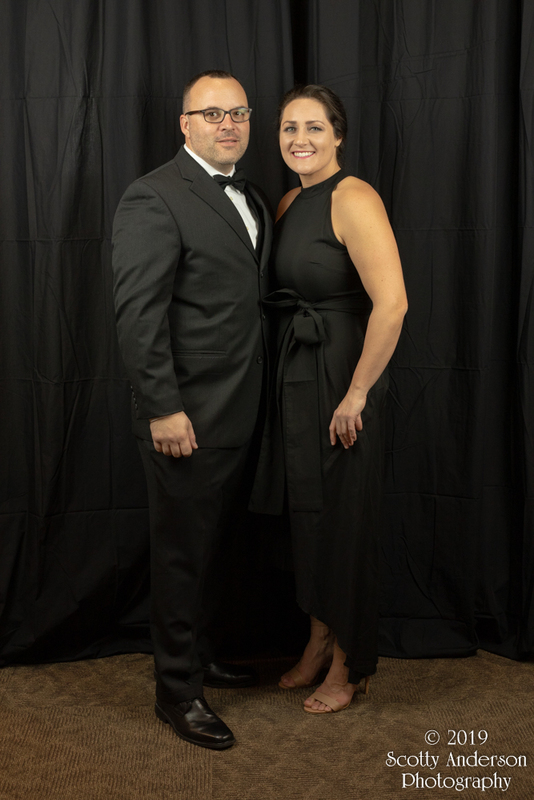 The event went very well. 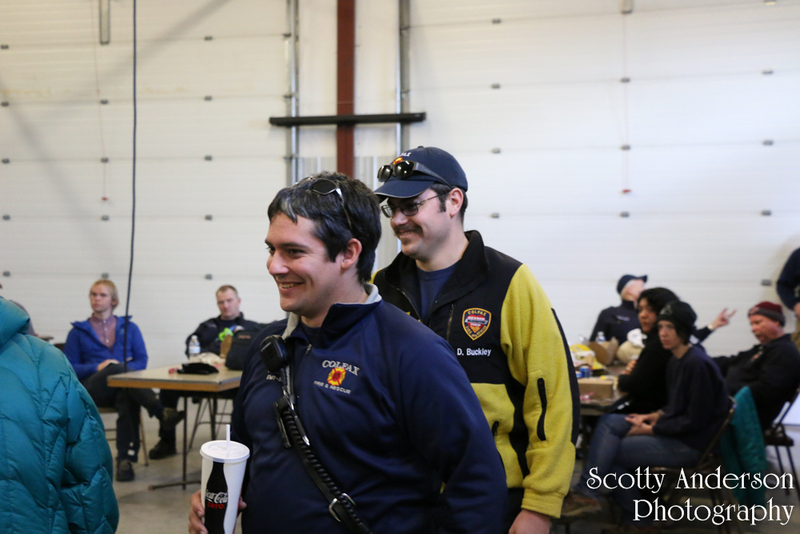 Lots of people showed up and they raised money for the cause. 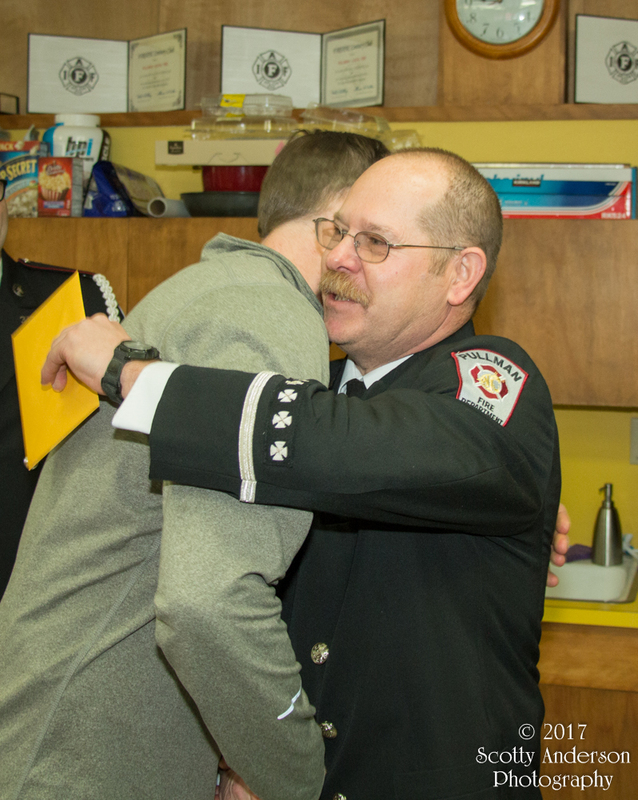 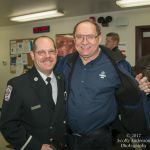 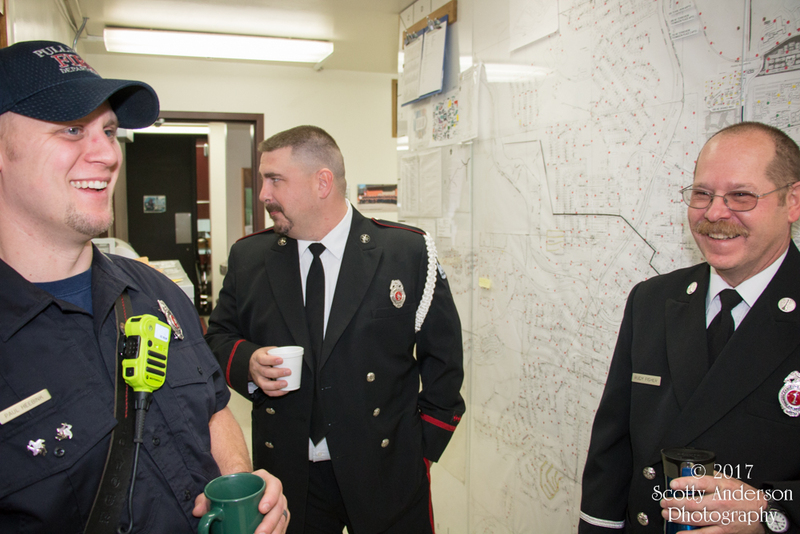 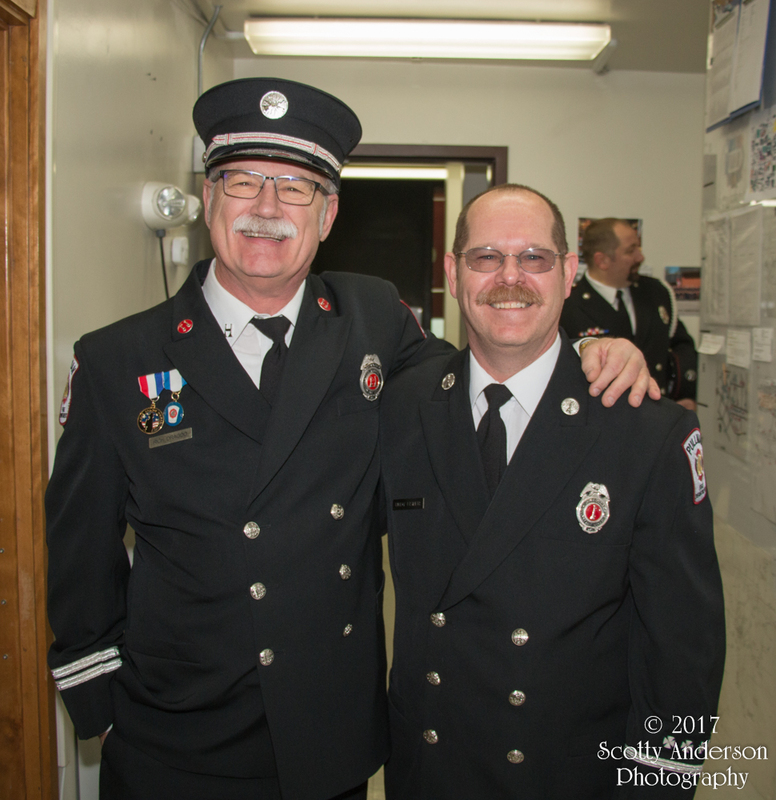 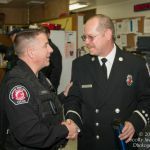 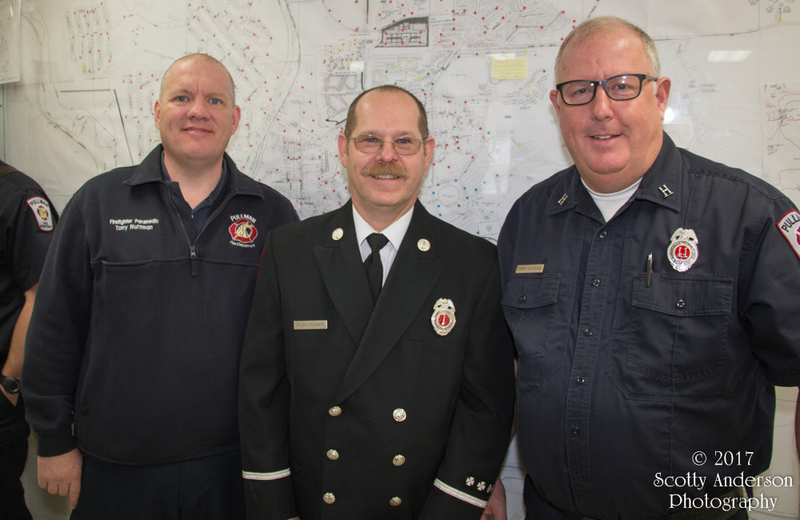 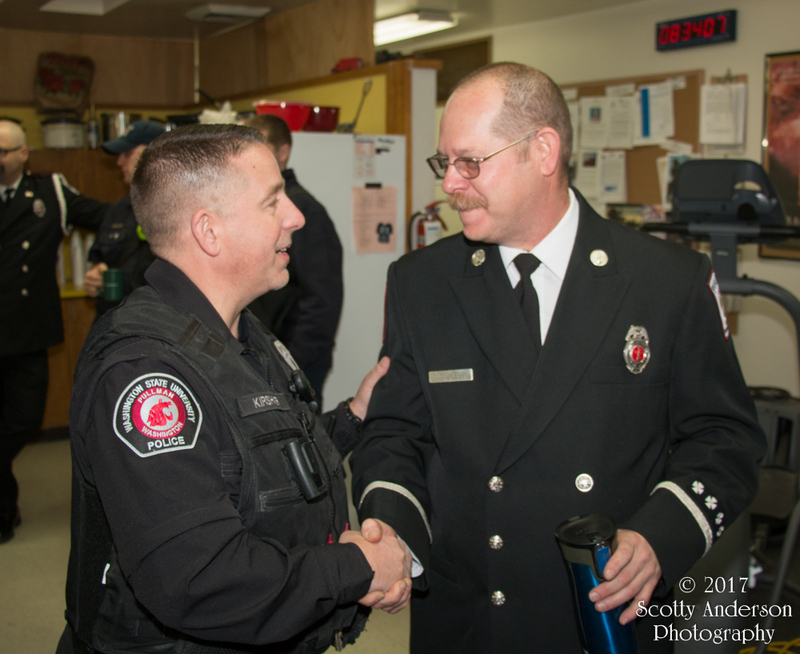 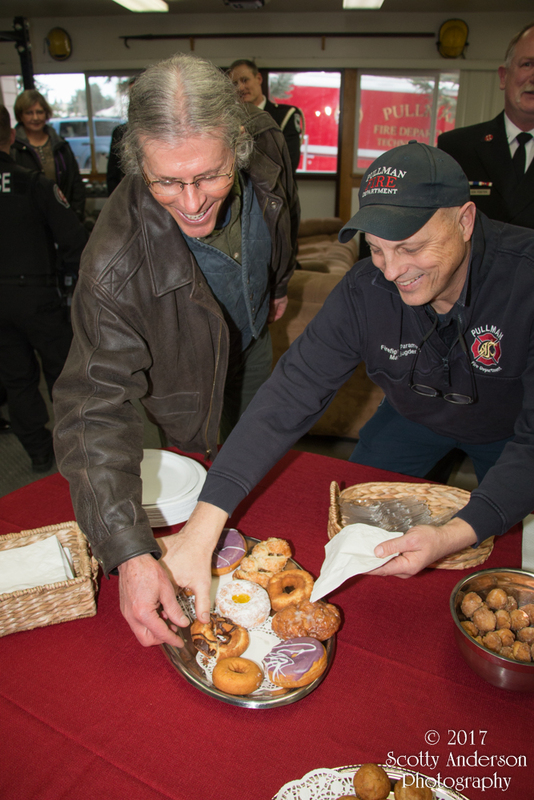 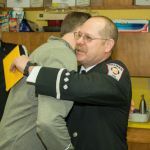 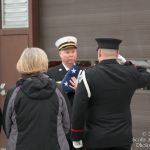 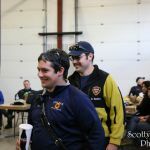 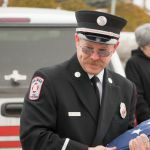 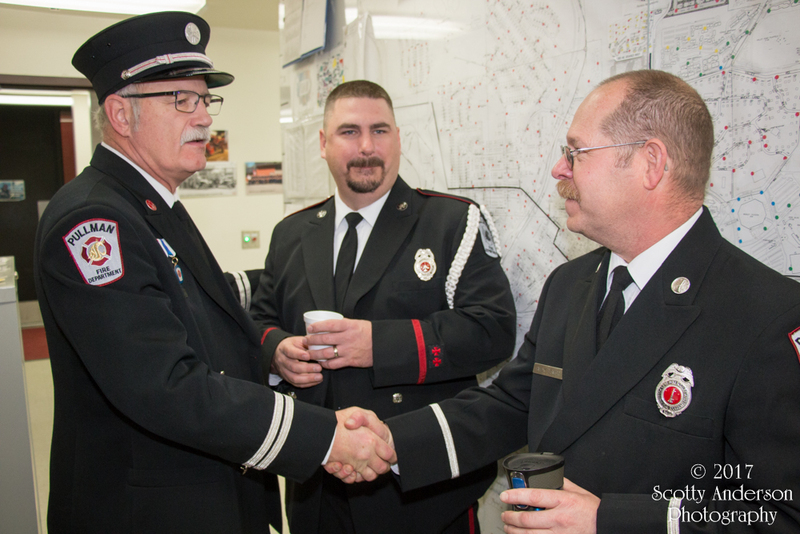 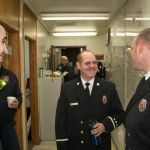 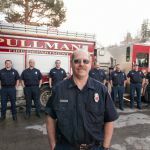 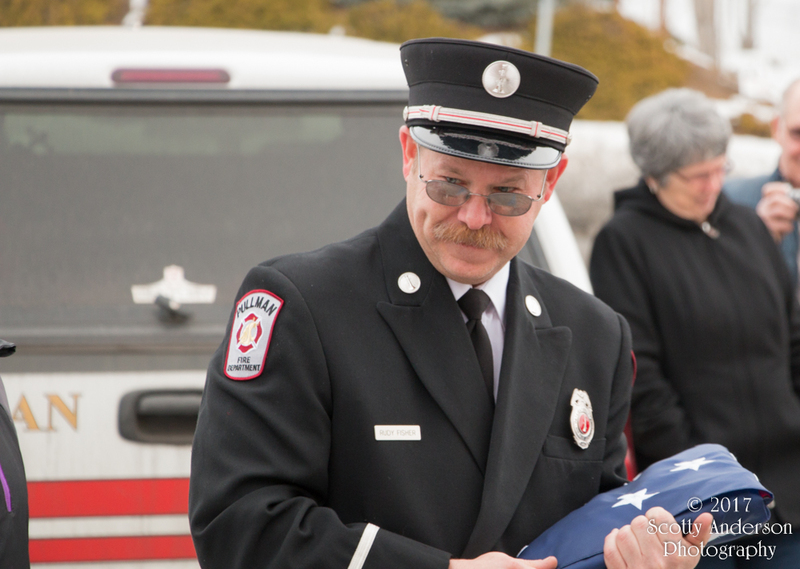 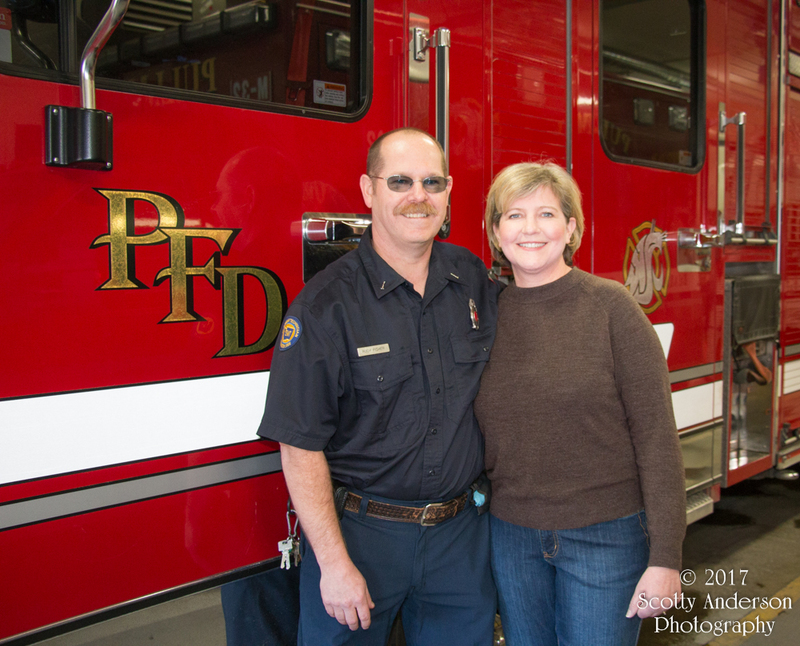 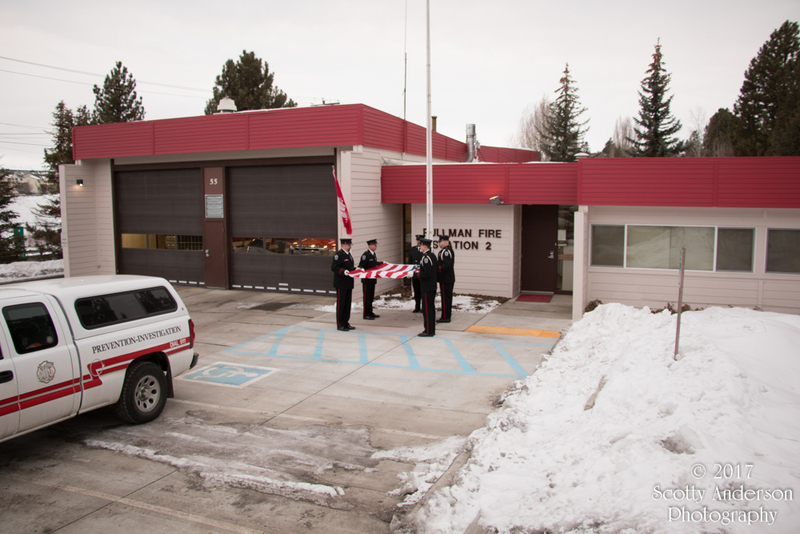 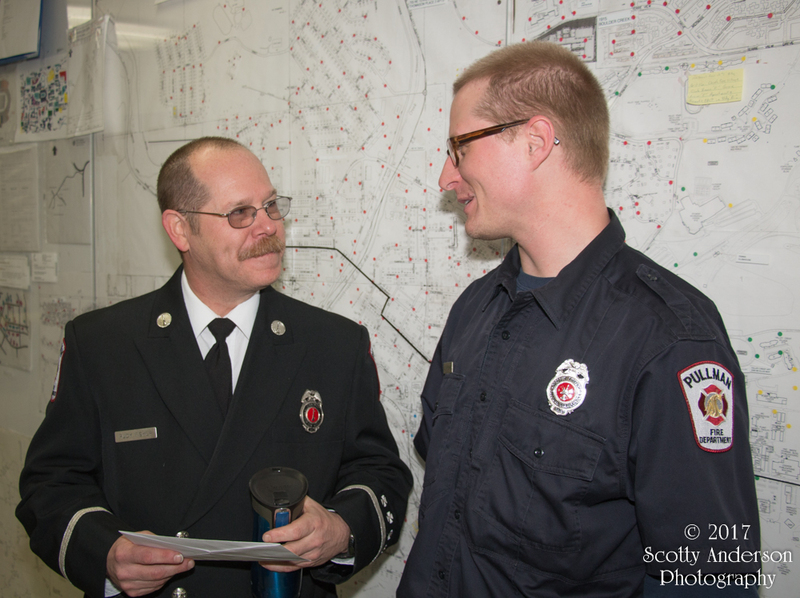 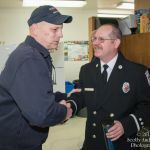 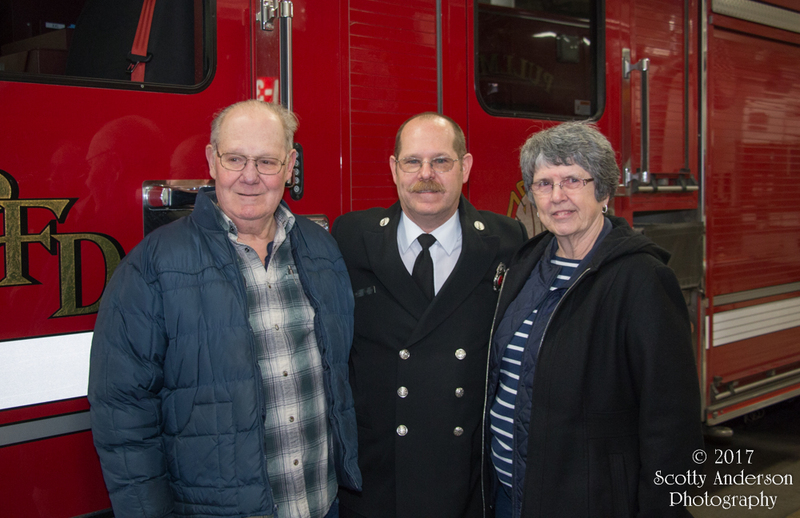 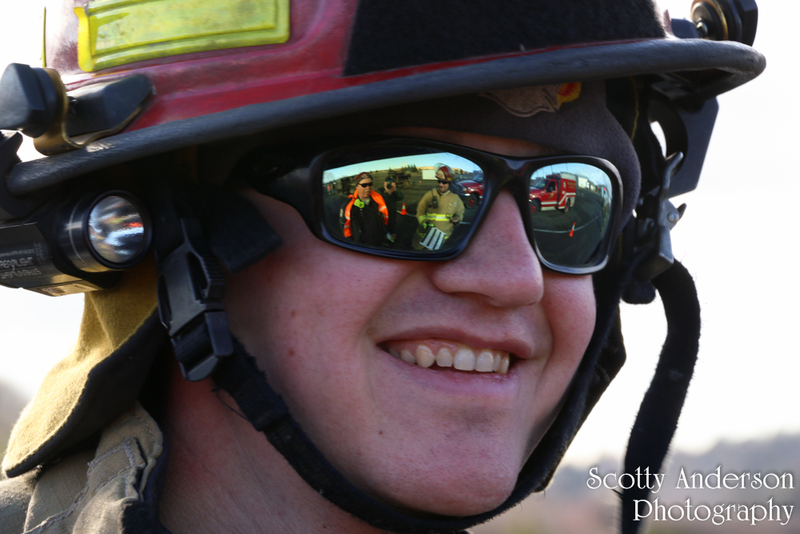 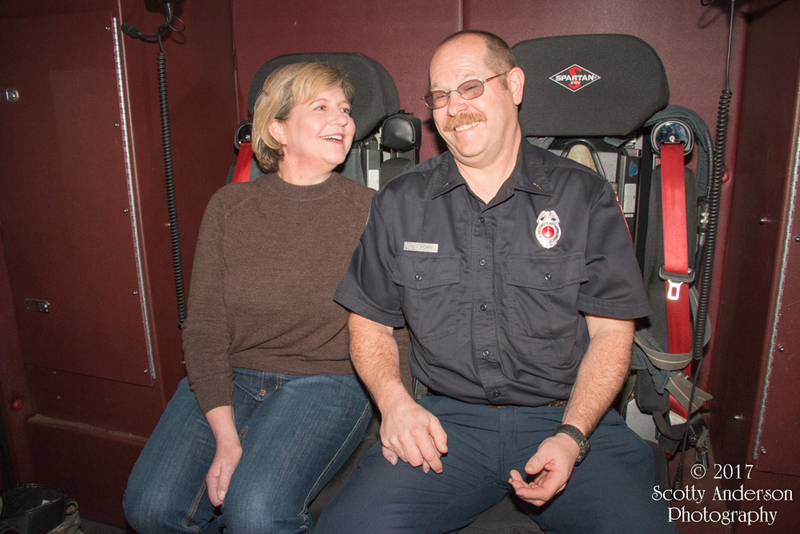 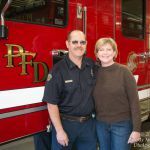 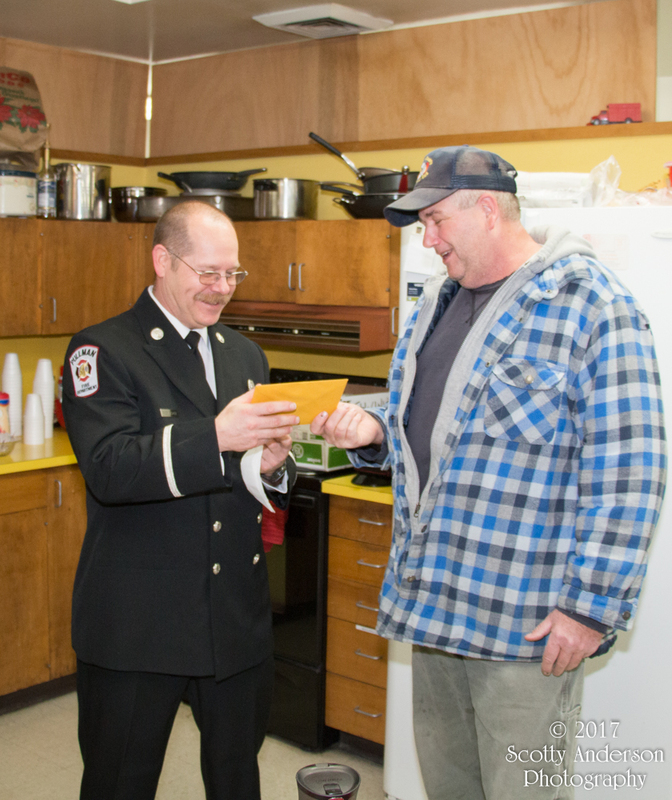 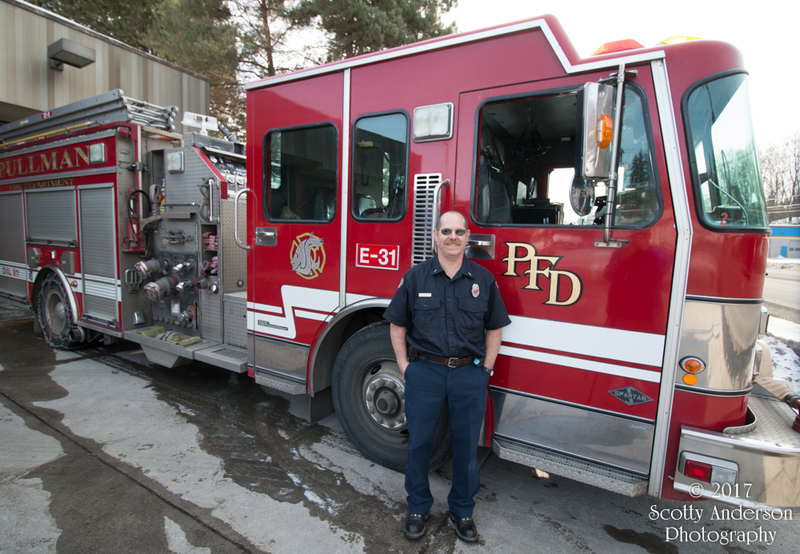 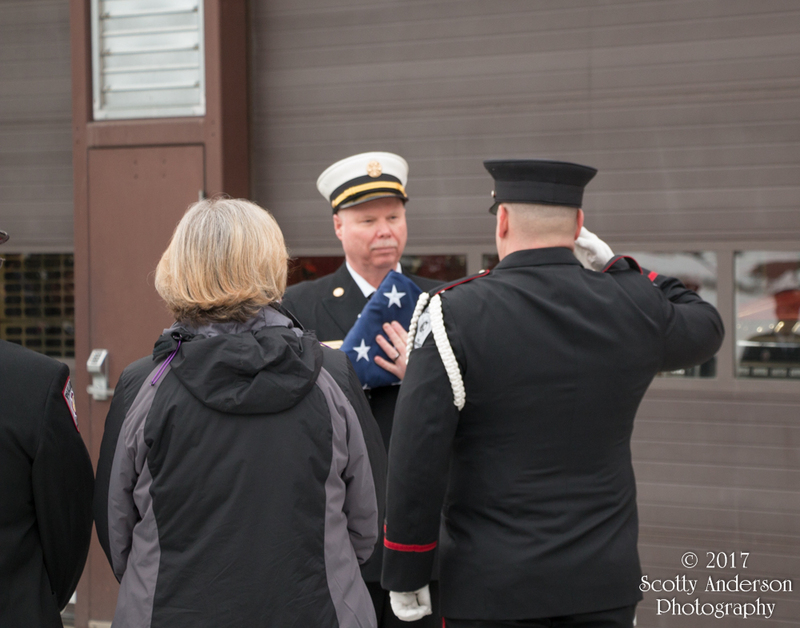 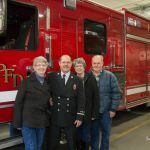 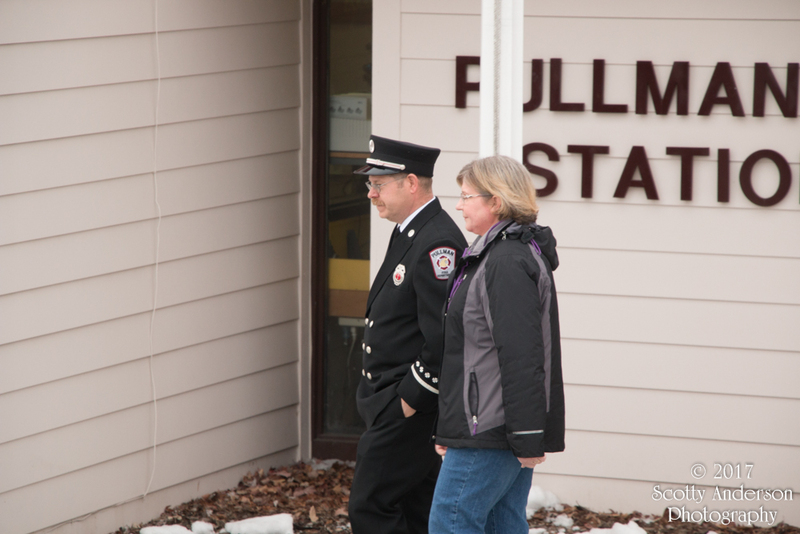 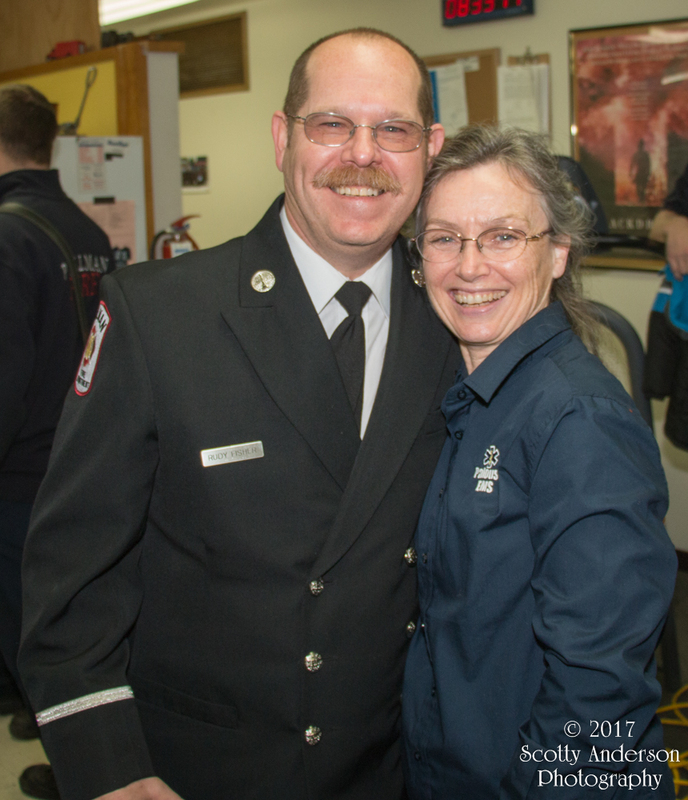 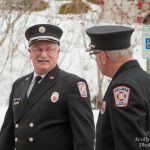 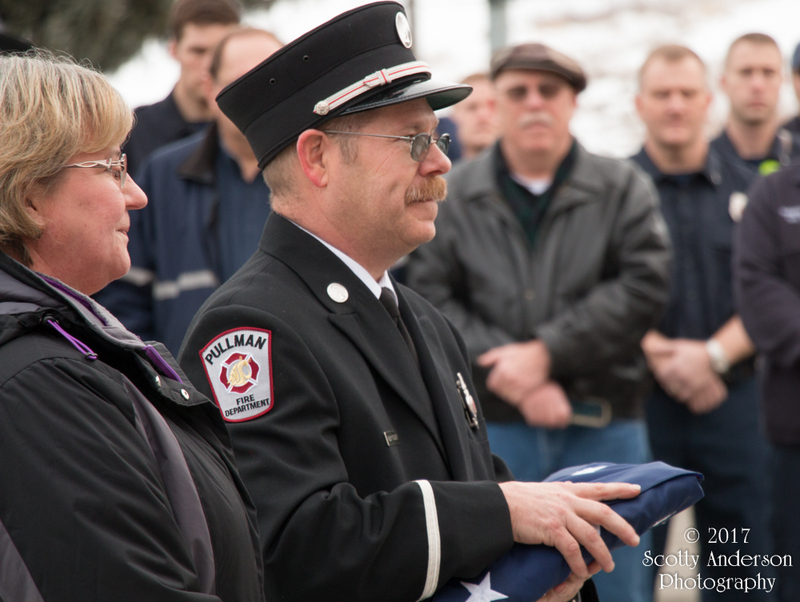 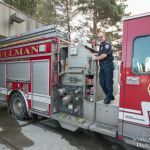 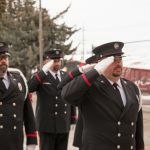 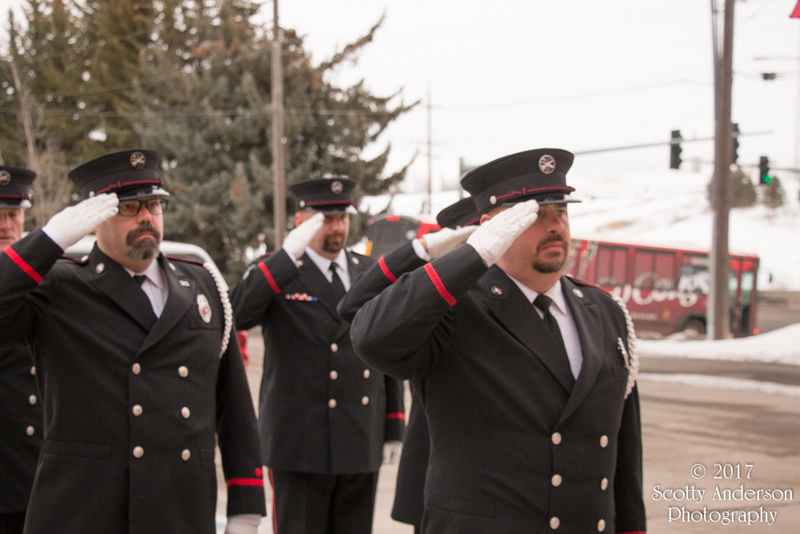 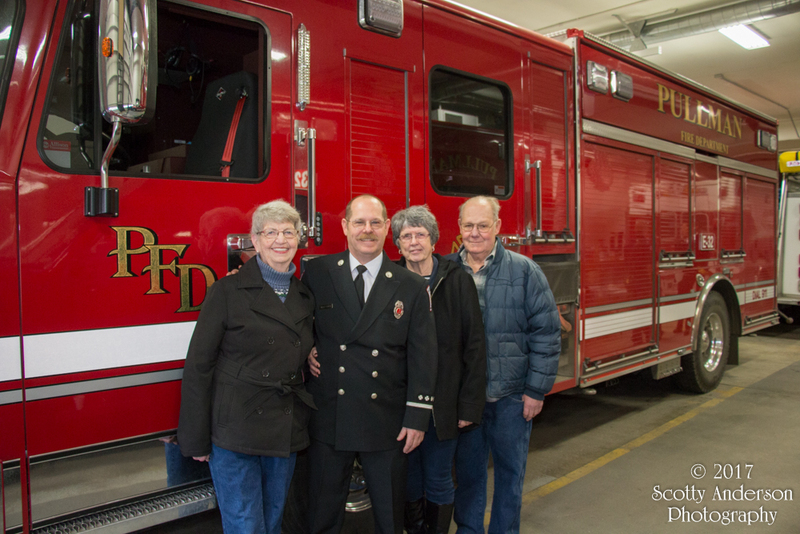 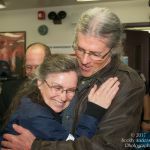 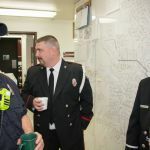 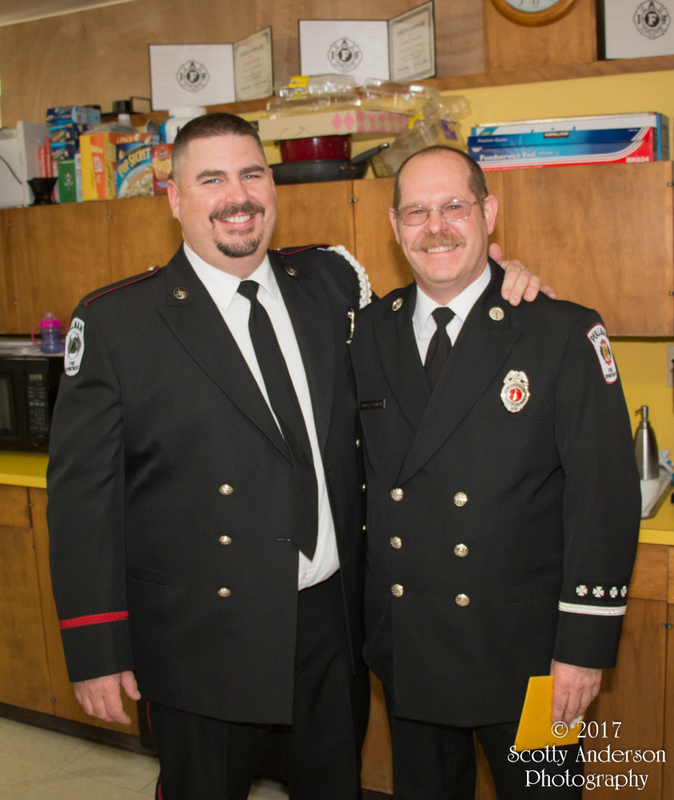 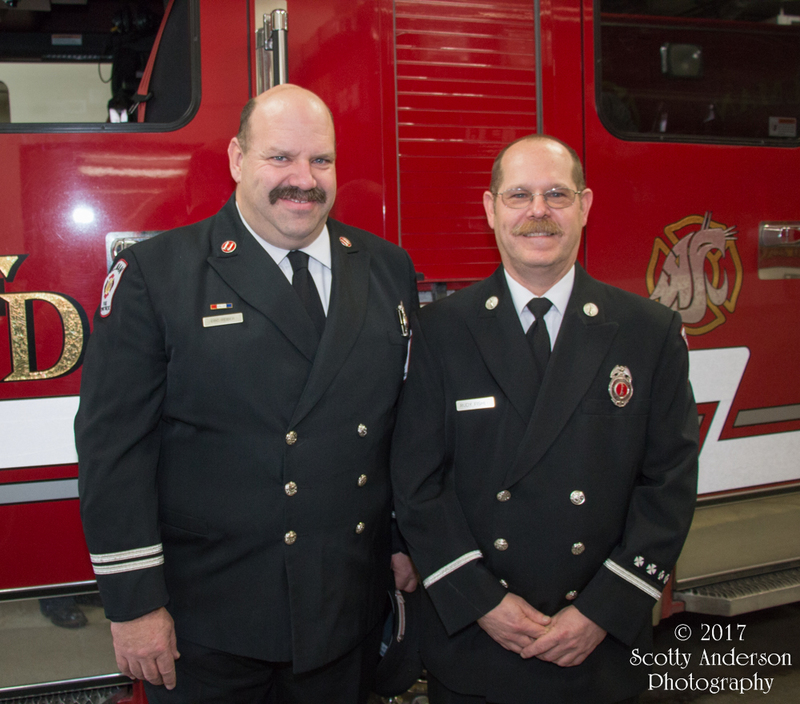 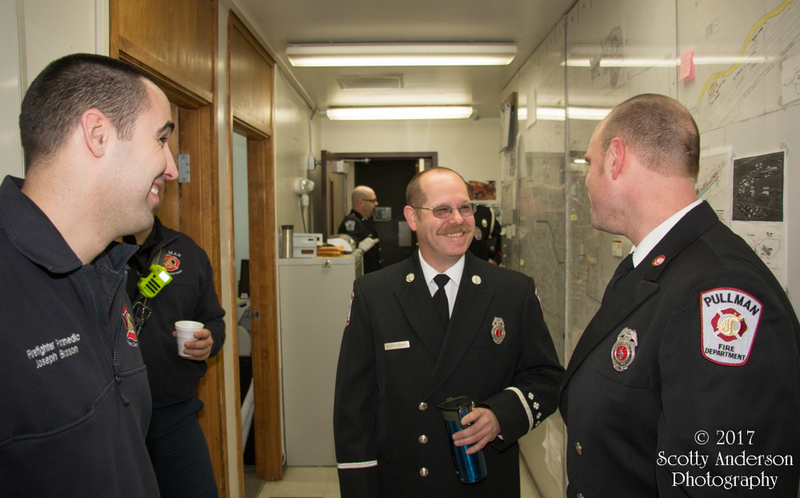 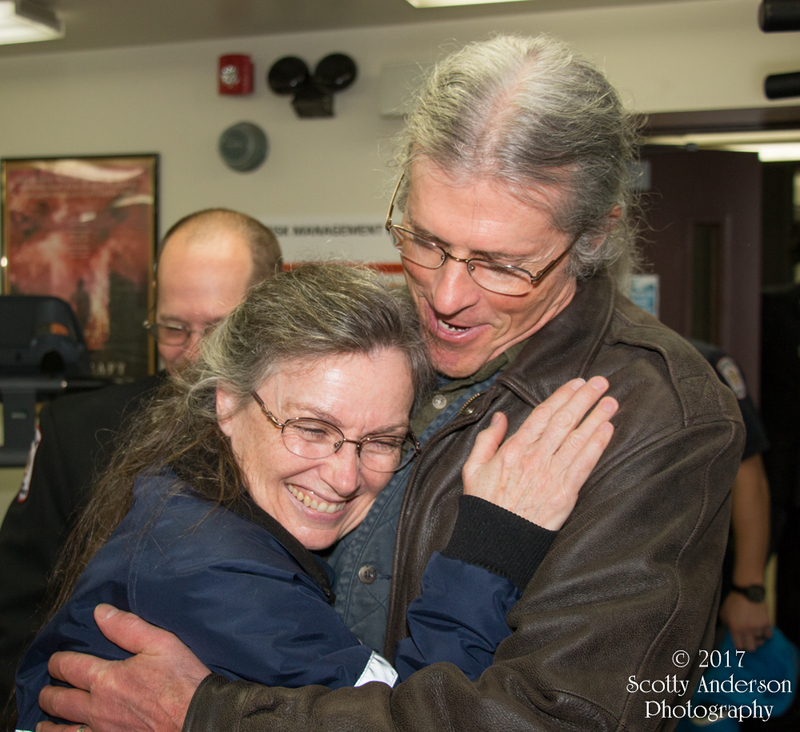 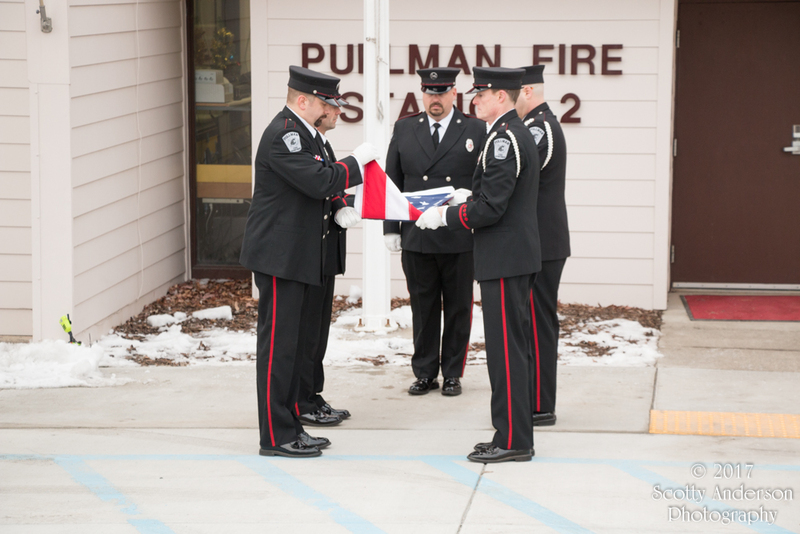 On January 29th, 2017 at 0800 Lieutenant Rudy Fisher walked into Pullman Fire Station 32 (the Deuce) for his final time as a member of the Pullman Fire Department. 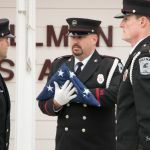 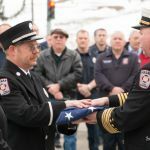 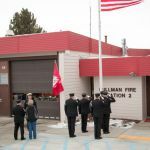 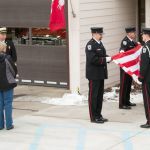 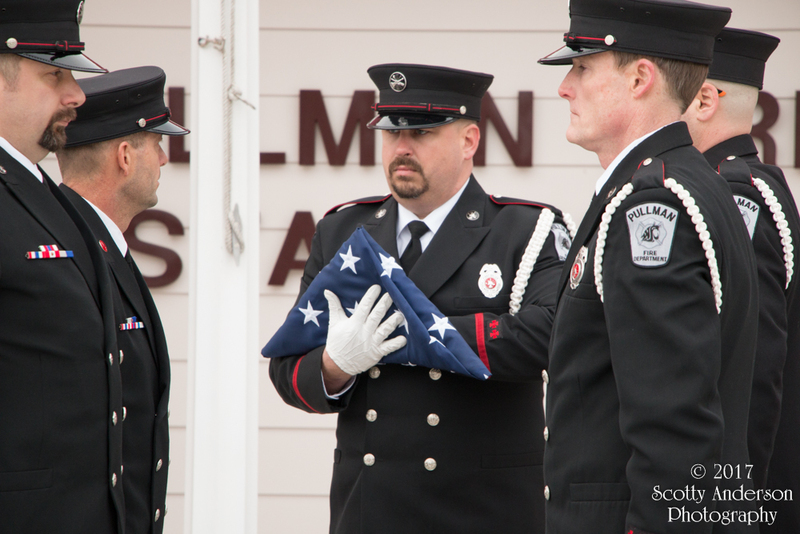 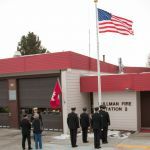 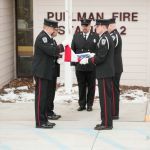 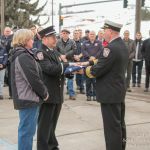 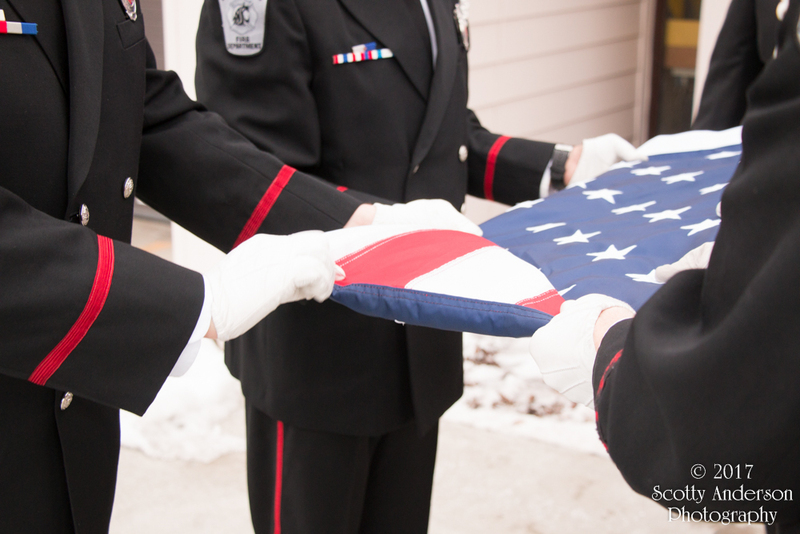 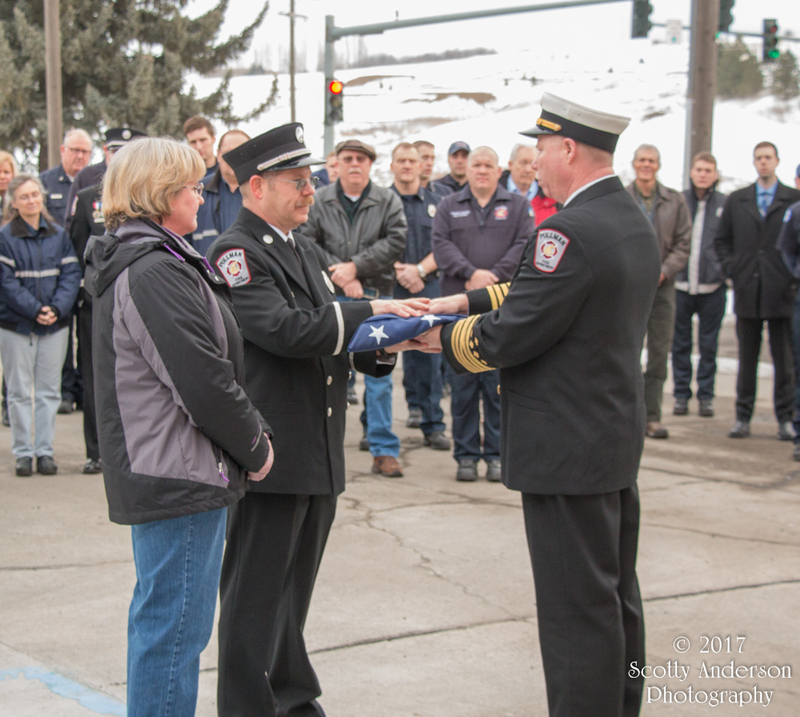 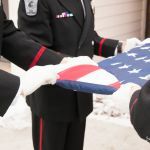 24-hours later Lt. Fisher would be given the flag that was flying over the station in a ceremony performed by the Pullman Fire Honor Guard. 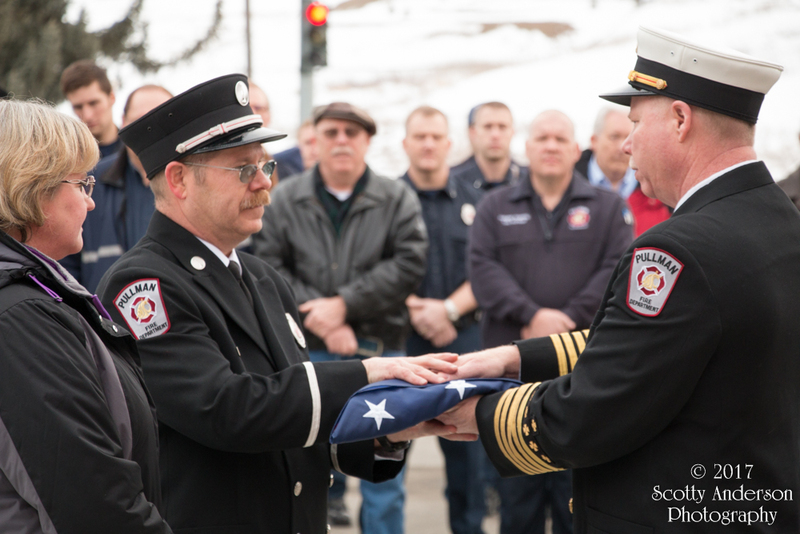 The flag was handed to Lt. Fisher by Chief Mike Heston. 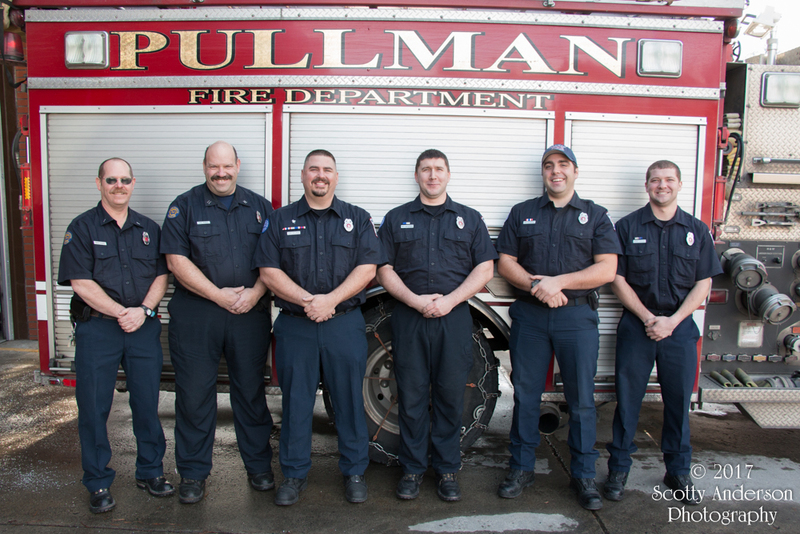 Lt. Fisher along with Firefighters McPherson, Gibbons, and Krieger worked his final shift on the north side of Pullman answering calls for service. 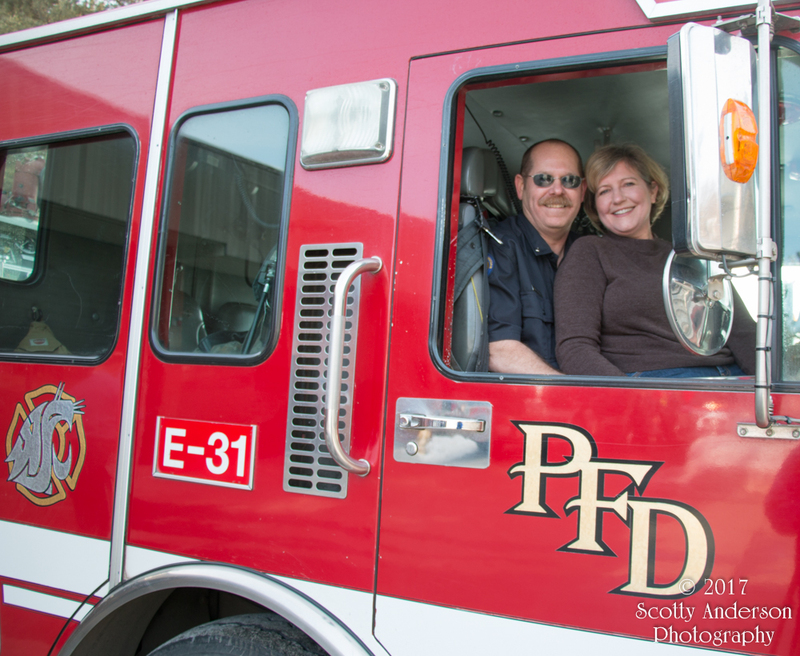 During the day I had the opportunity to shoot some photos with Lt. Fisher and his wife, Lisa. 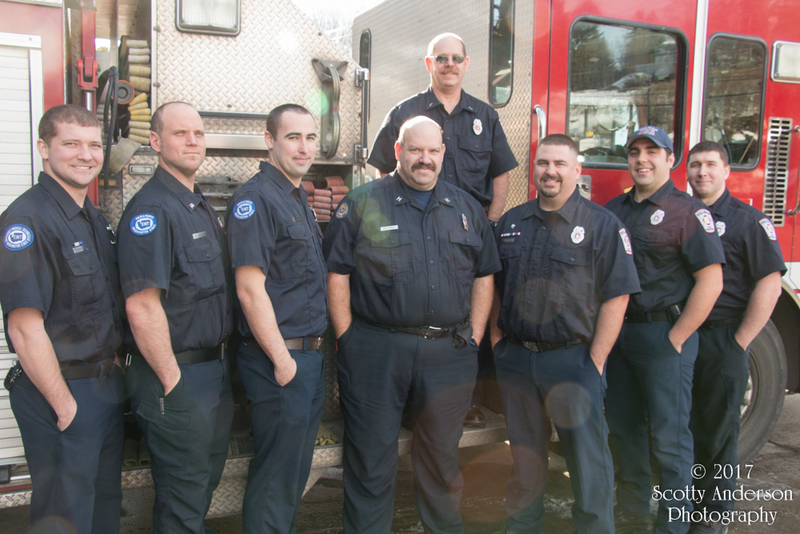 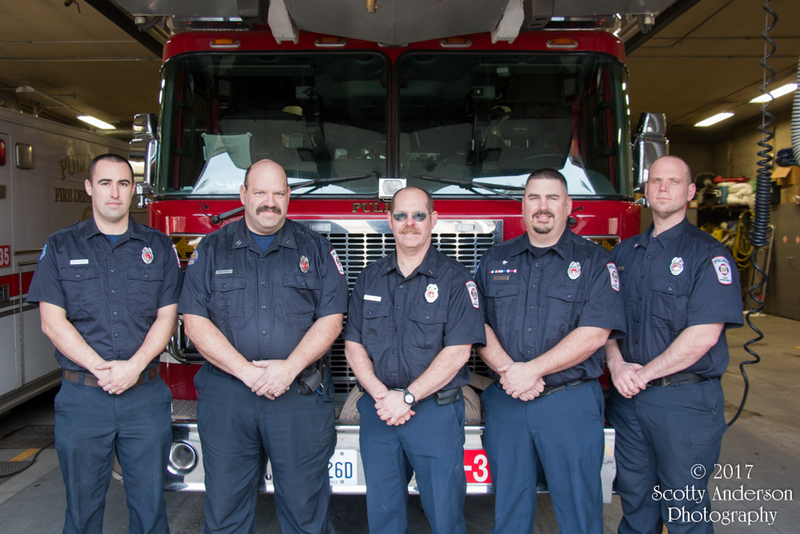 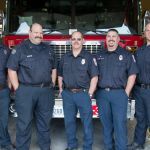 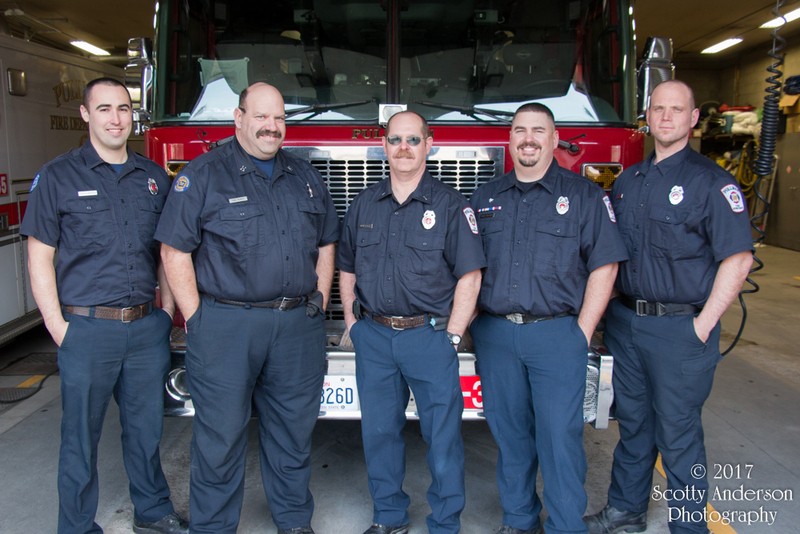 We took the photoshoot to Station 31 to include the men working there. 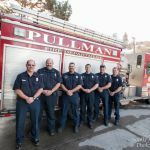 Captain Reiber, Firefighters Gollnick, Erickson, and Branson where covering the south part of Pullman. 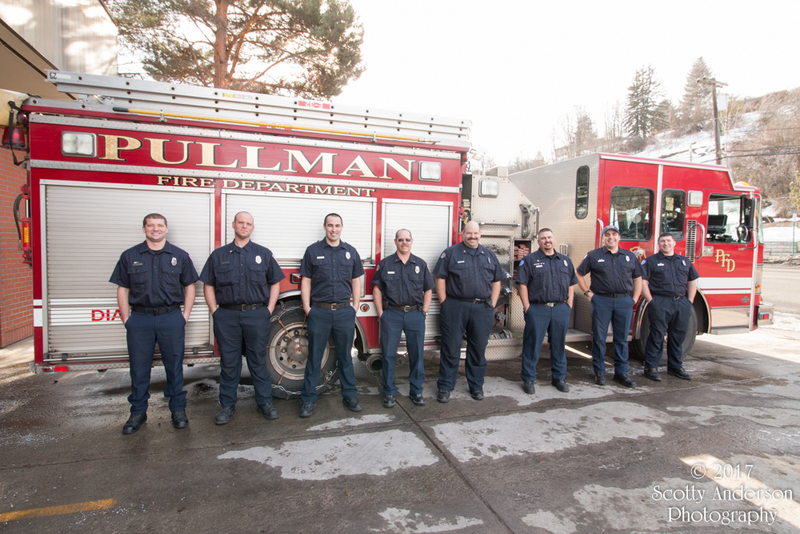 All the members of both stations took part in the photoshoot. 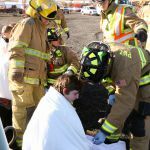 I have included a hand full of the photos. 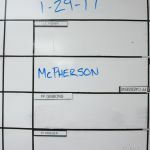 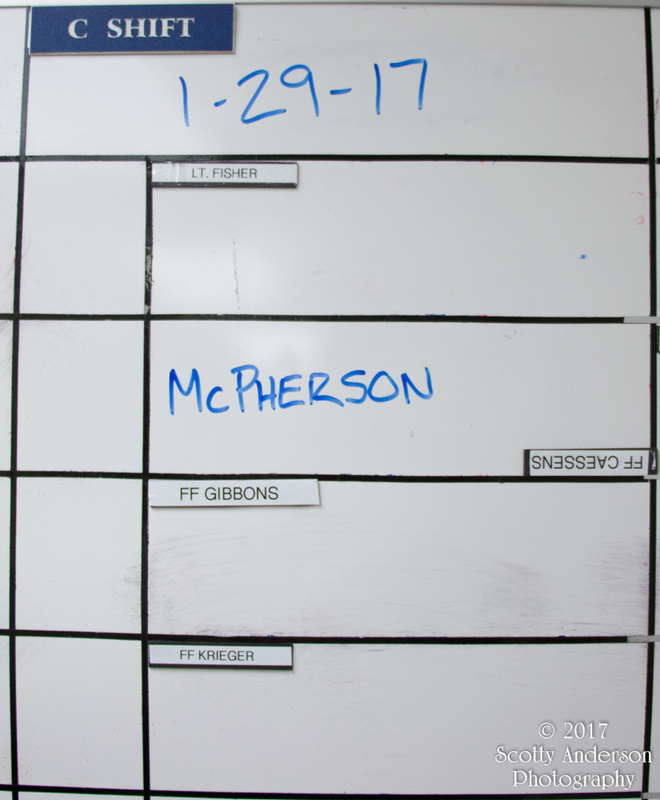 At 0800 on January 30th, 2017 Lt. Fisher’s final shift came to an end. 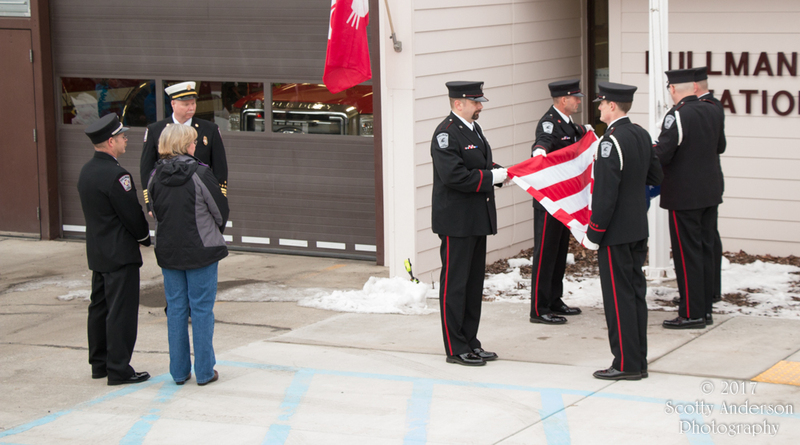 The Honor Guard marched to the flag pole, lowered the American Flag, folded it, and it was ultimately presented to Lt. Fisher. 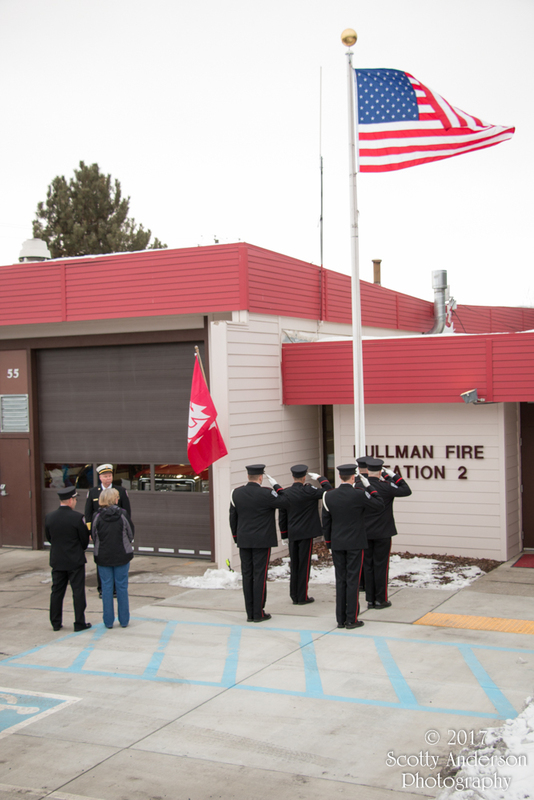 Again I was on hand to take photos of the Flag Ceremony and the celebration that took place afterwards in the Deuce. 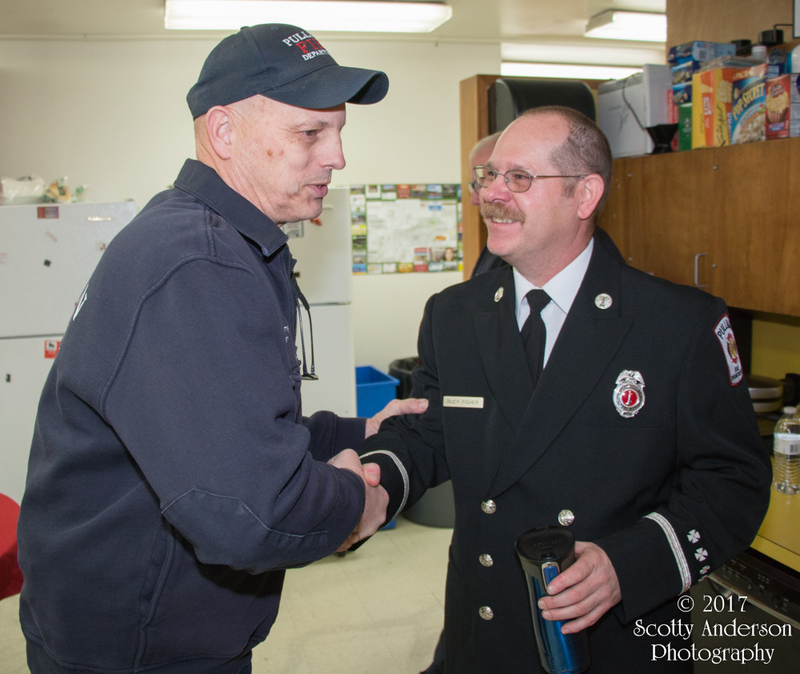 This was a great opportunity for people to congratulate Lt. Fisher on his retirement. 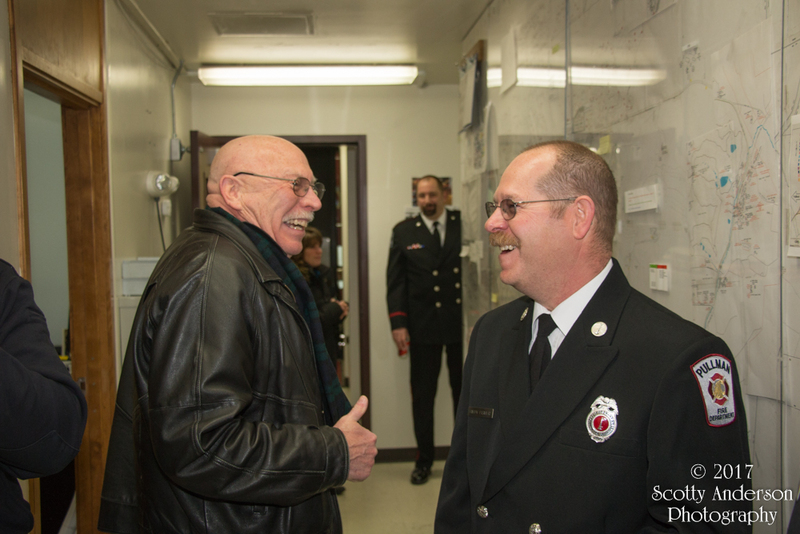 Several retired firefighters made their way to the celebration. 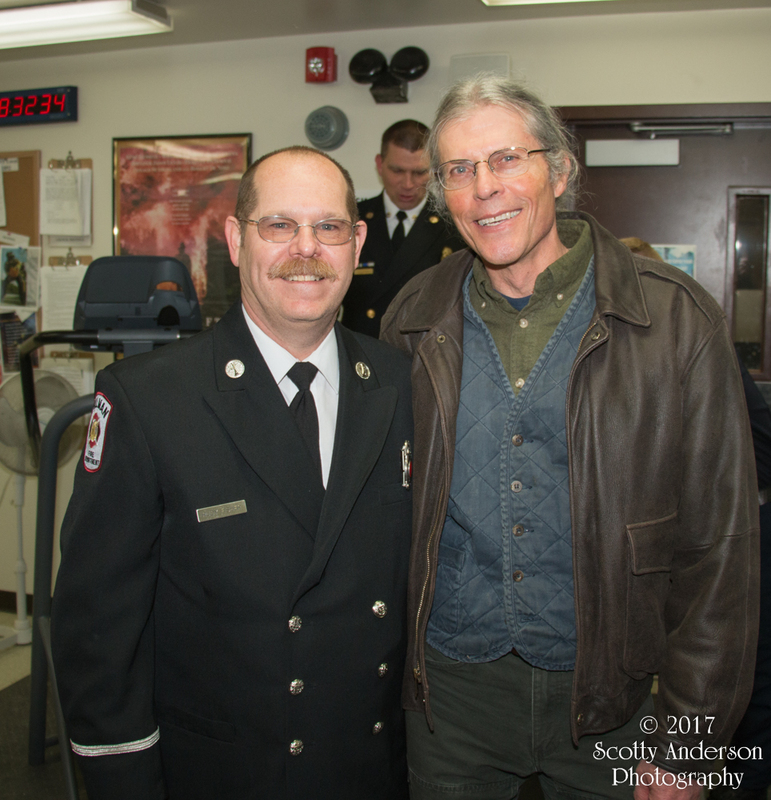 I tried to get as many photos as I could with newly-retired Lt. Fisher and the people in attendance. 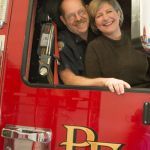 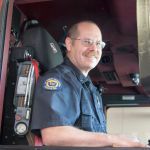 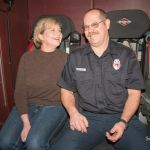 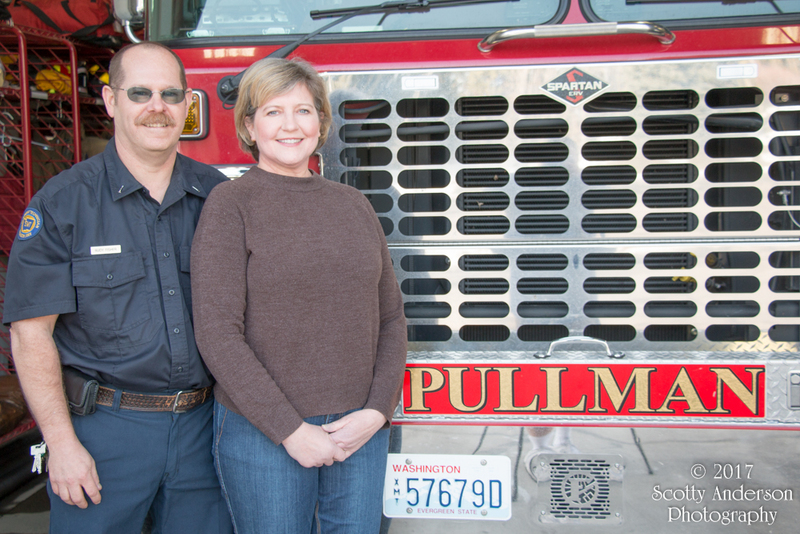 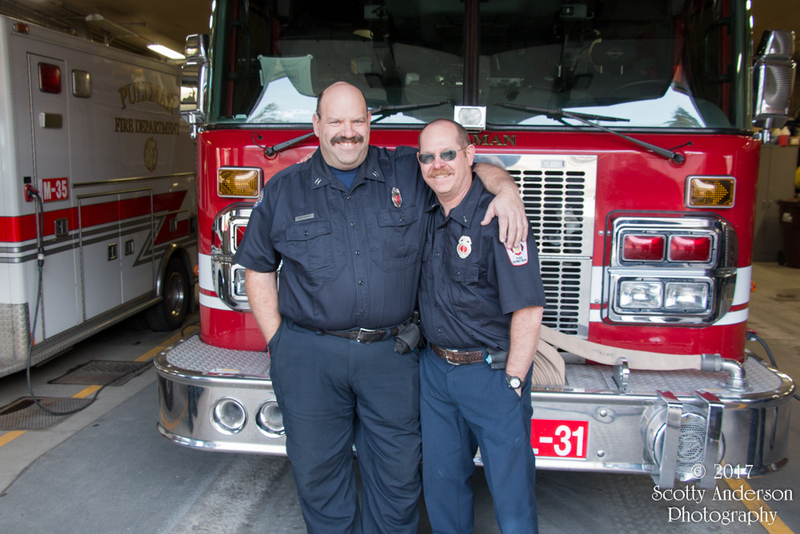 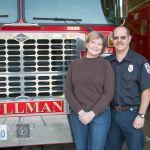 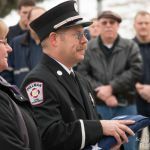 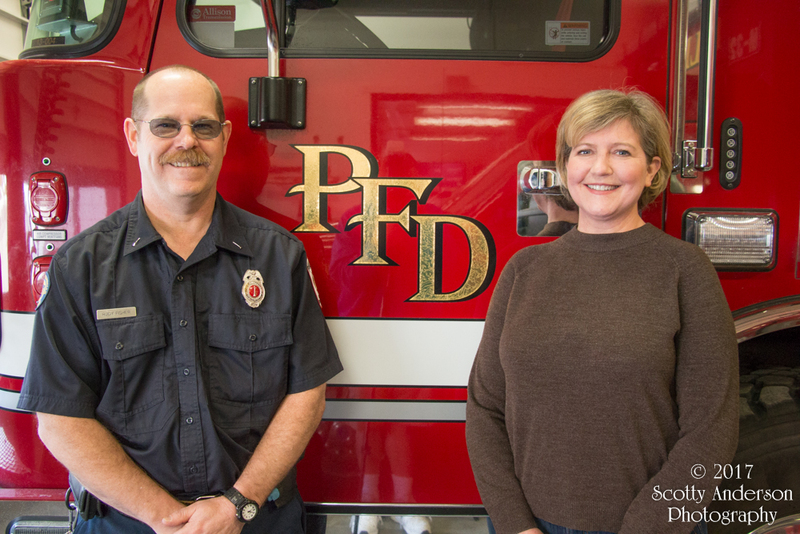 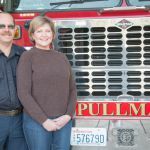 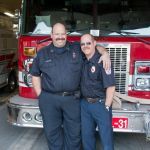 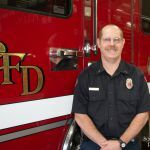 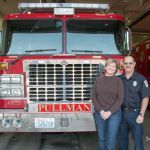 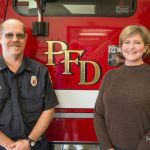 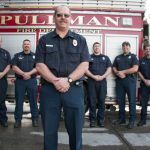 Nearly a quarter-century, on February 10, 1992, Rudy Fisher was hired as a city of Pullman Firefighter by the late Chief Pat Wilkins. 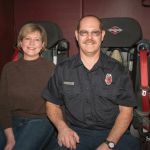 When Rudy was hired the main fire station on South Grand was the career station. 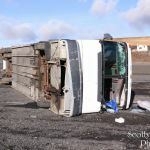 The Deuce was the reserve station. 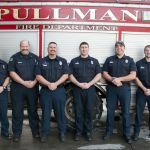 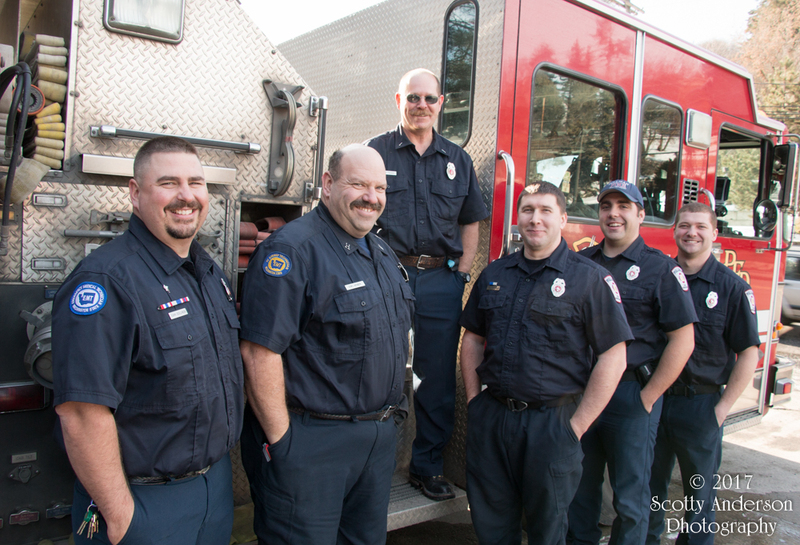 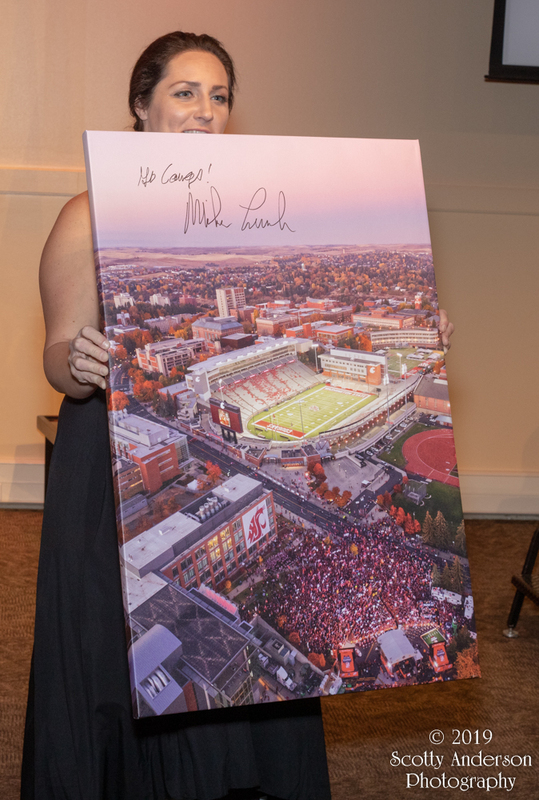 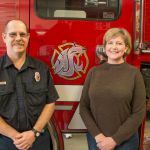 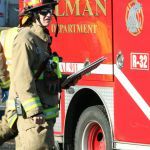 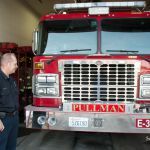 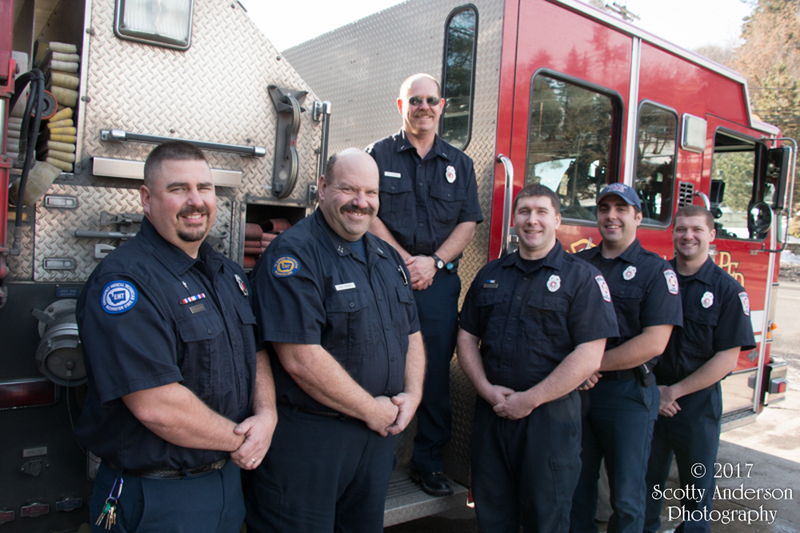 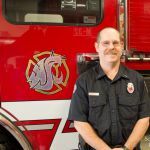 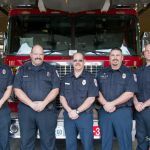 That all changed in 2005 when WSU stopped providing their own fire services and started to use the City of Pullman Fire Department. 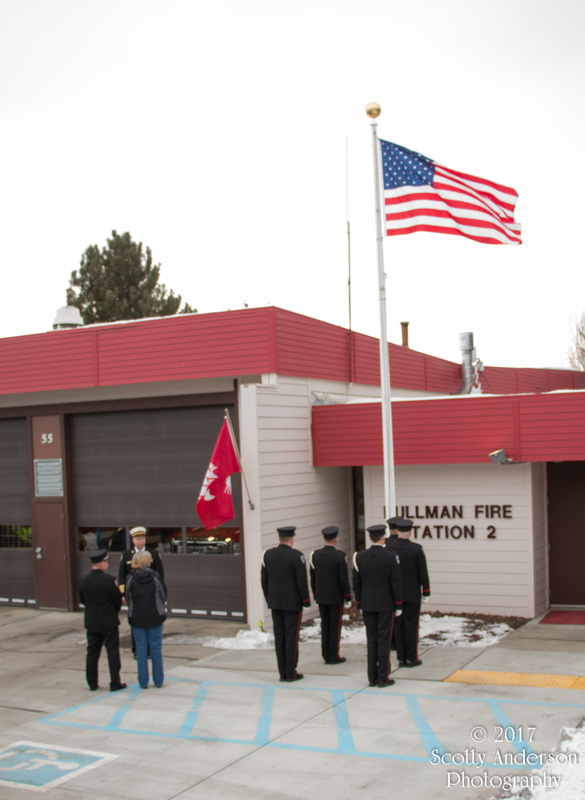 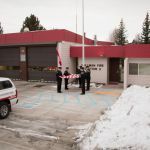 At that time the Deuce was made into a career and reserve fire station. 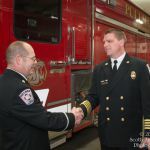 At the same time Lieutenants were added to the rank of firefighters. 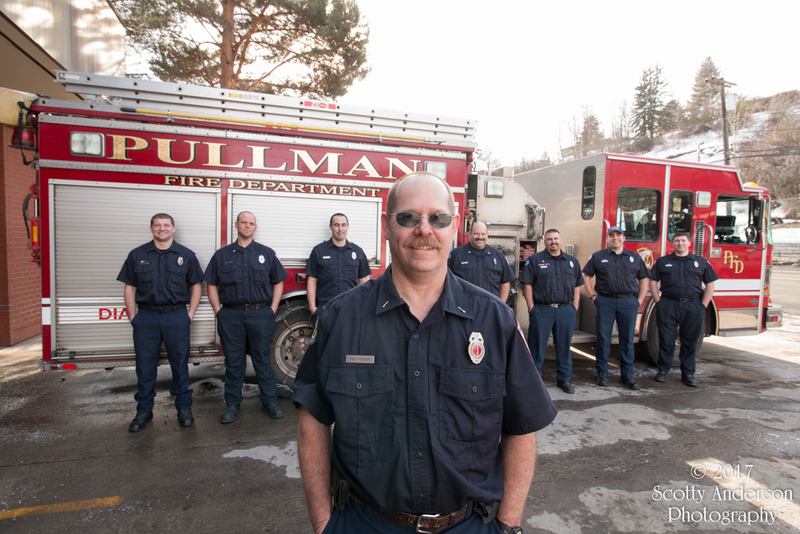 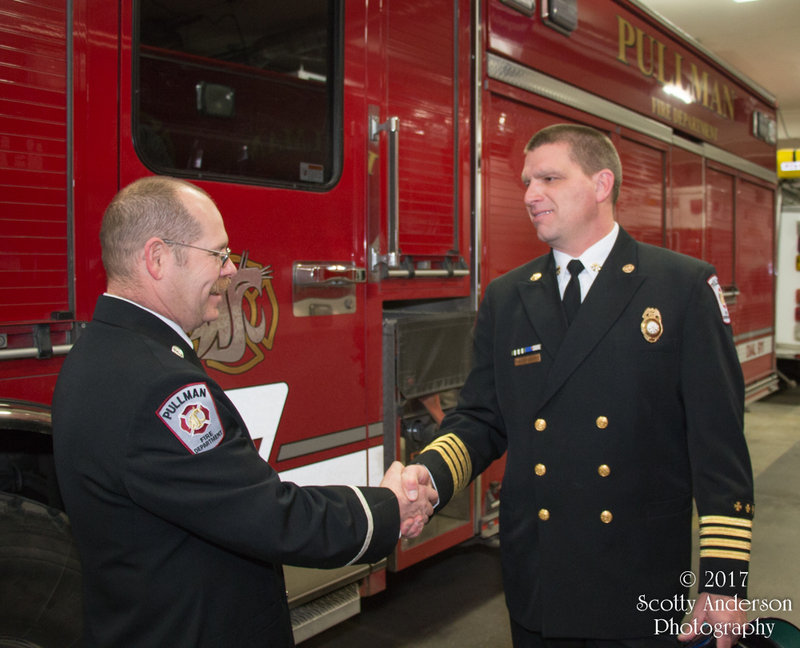 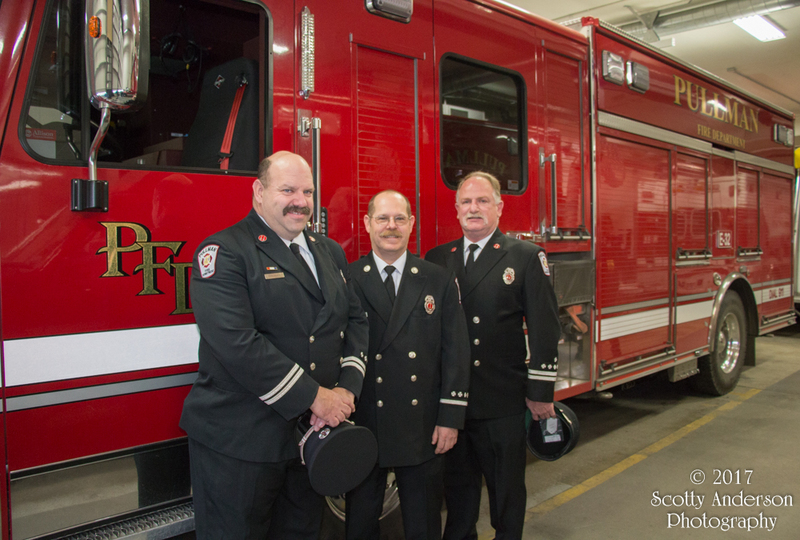 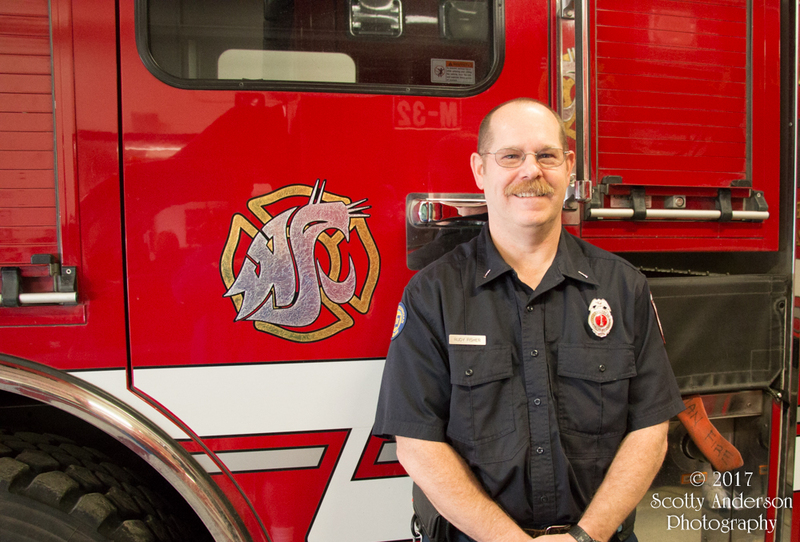 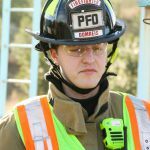 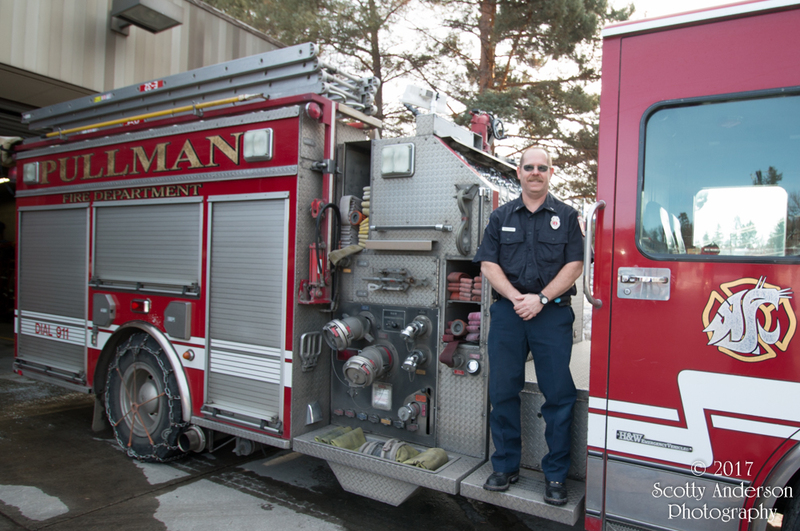 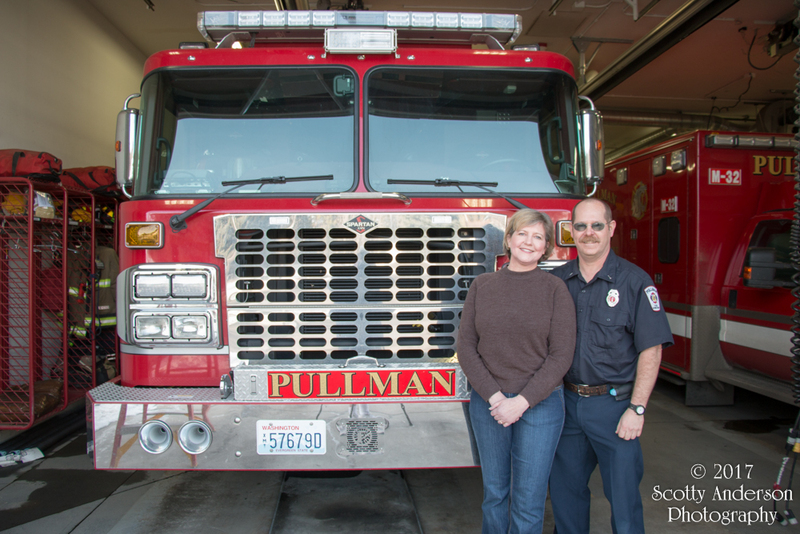 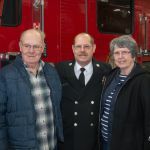 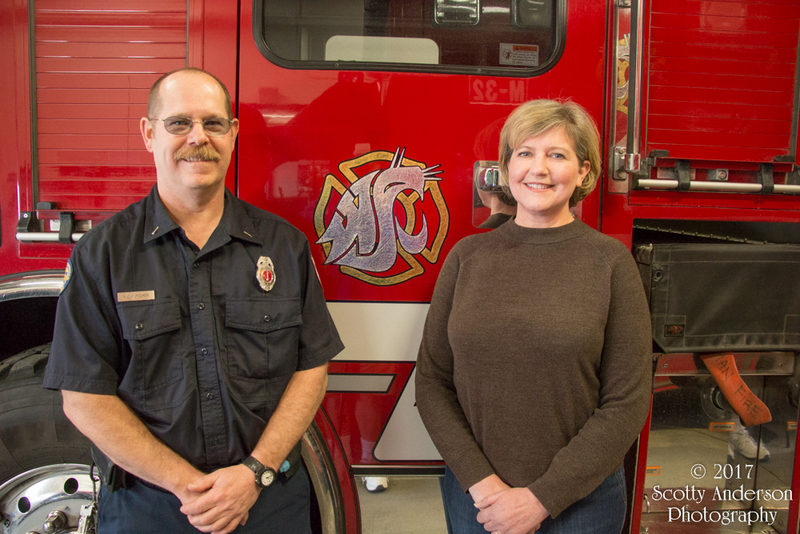 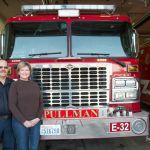 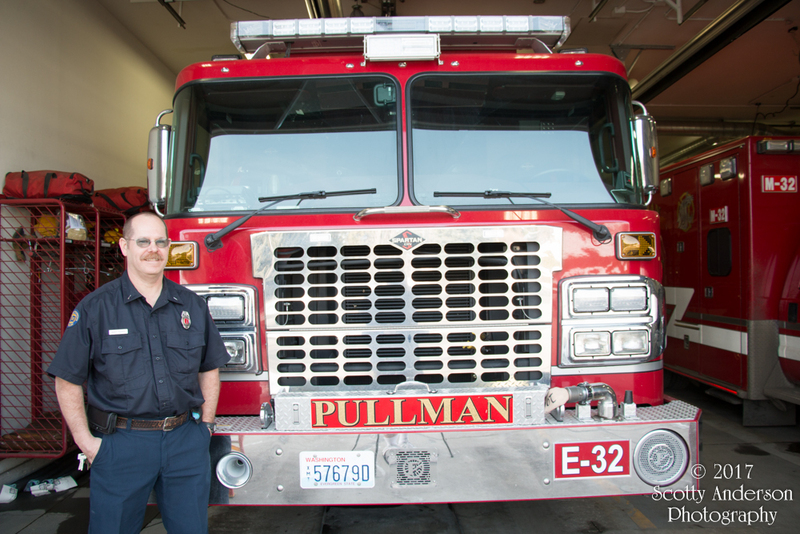 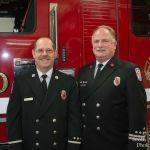 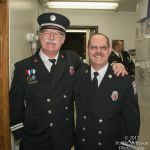 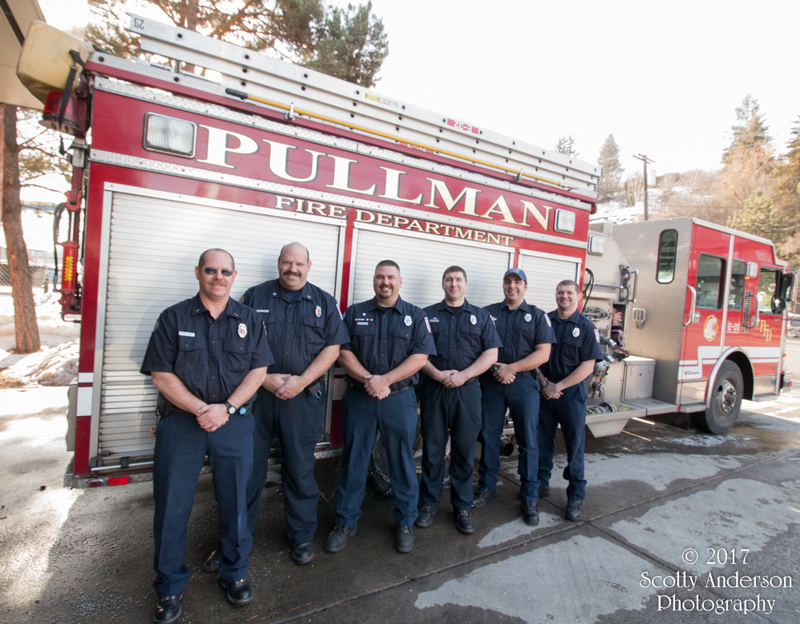 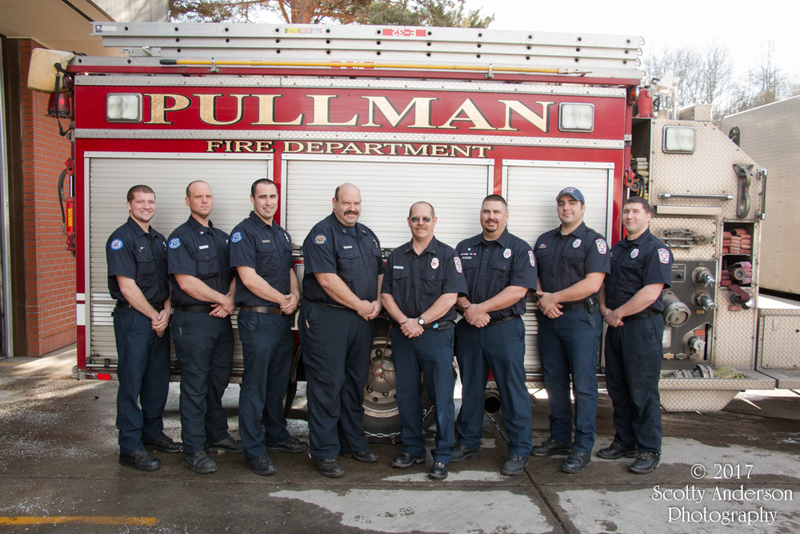 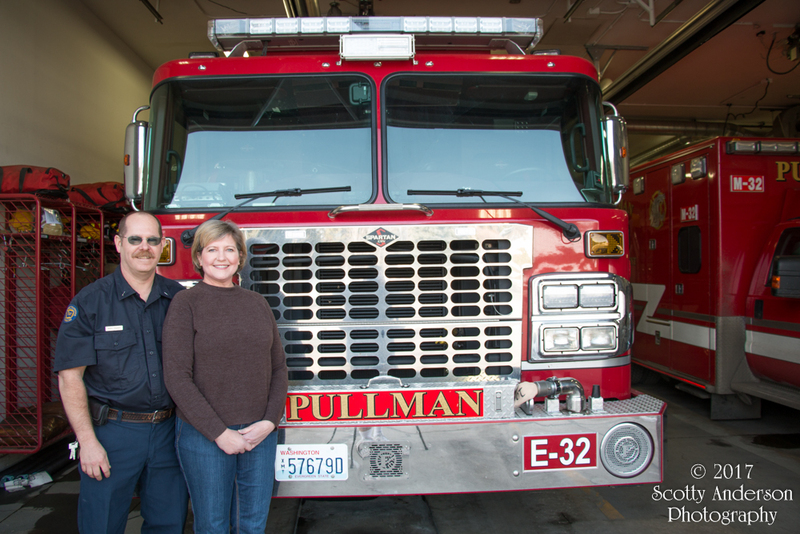 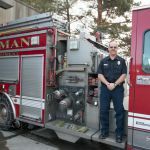 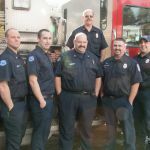 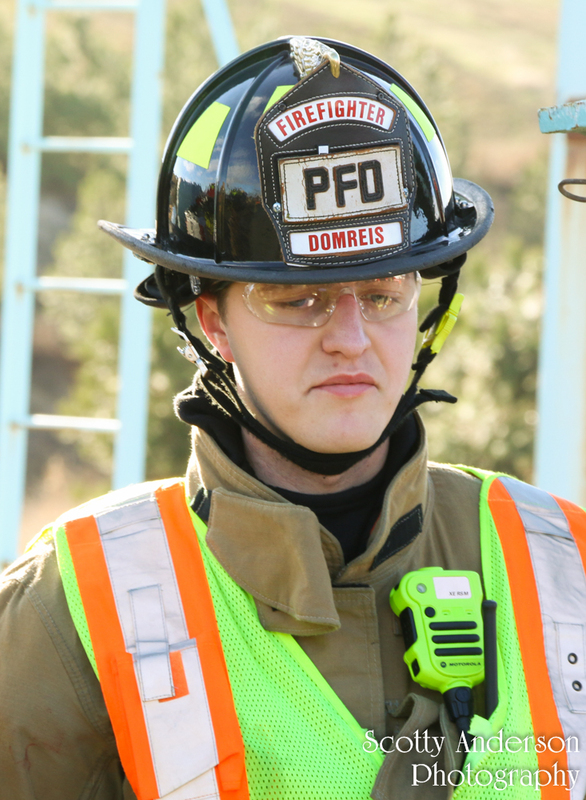 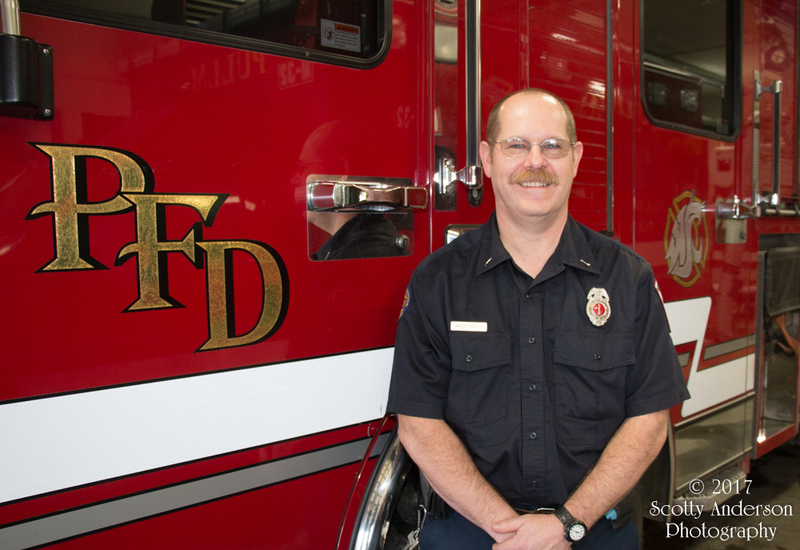 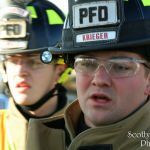 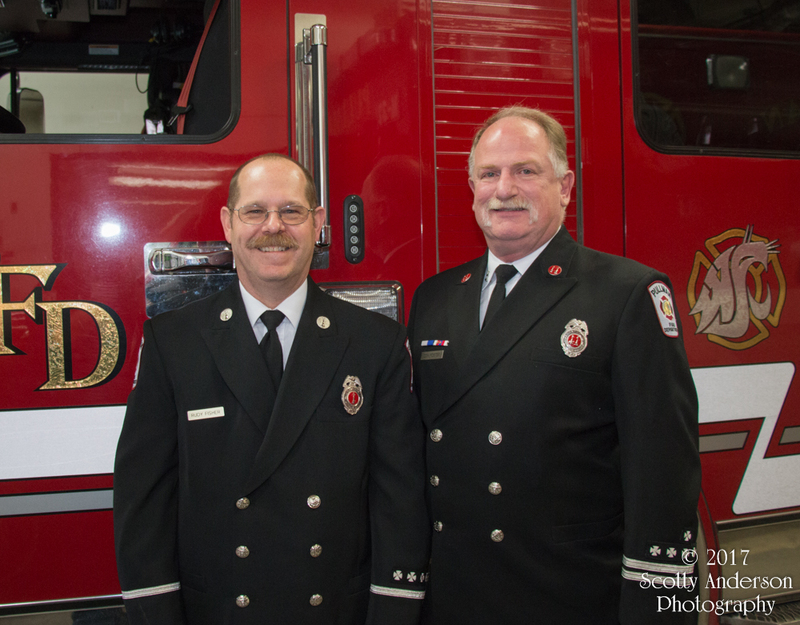 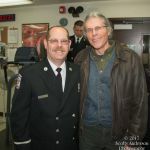 Rudy was selected as one of the first three Lieutenants of Pullman Fire. 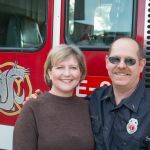 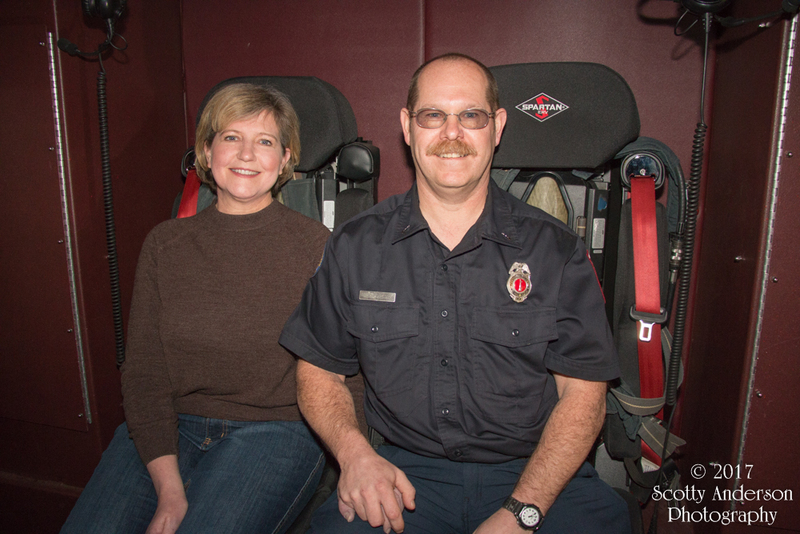 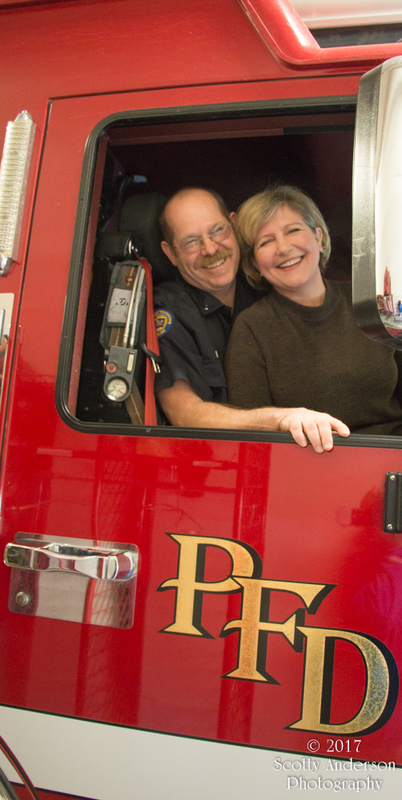 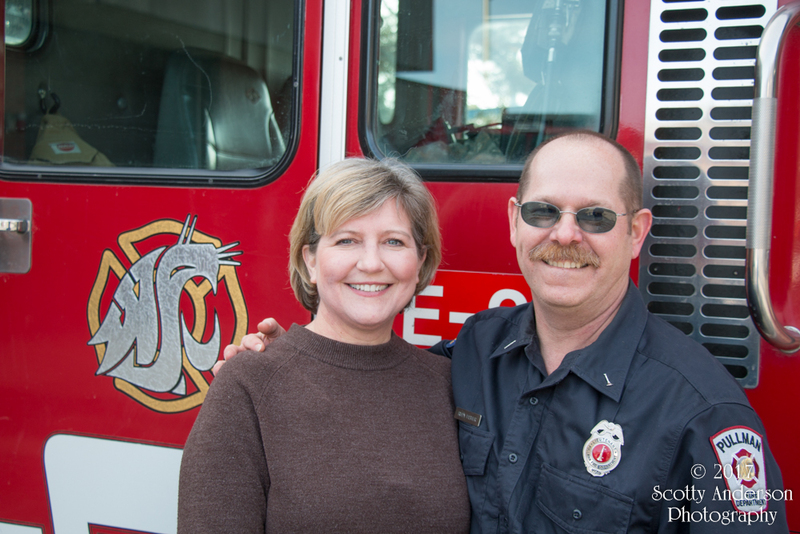 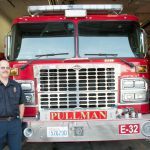 I had the opportunity ask Rudy some questions about his quarter-century run at being a city of Pullman Firefighter. 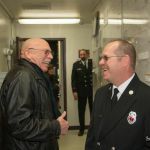 Firefighters seem to have a favorite apparatus and Rudy was no different. 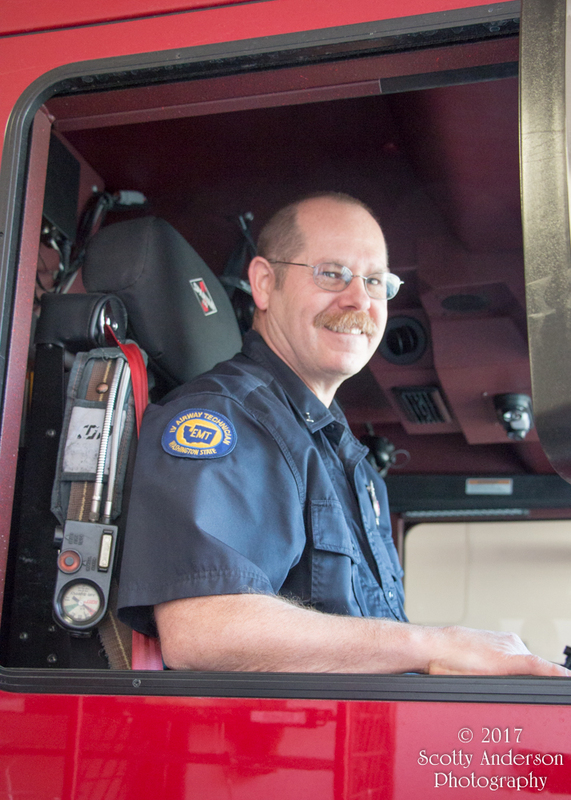 I had a feeling that I already knew the answer before I asked, but I wanted to know what his favorite apparatus was. 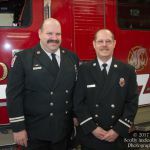 He said “The H & W (E32) was the first Red Engine in the fleet. 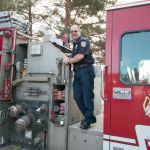 It looked great and was very user friendly.” That was the engine we used to base the crew photos during the photoshoot. 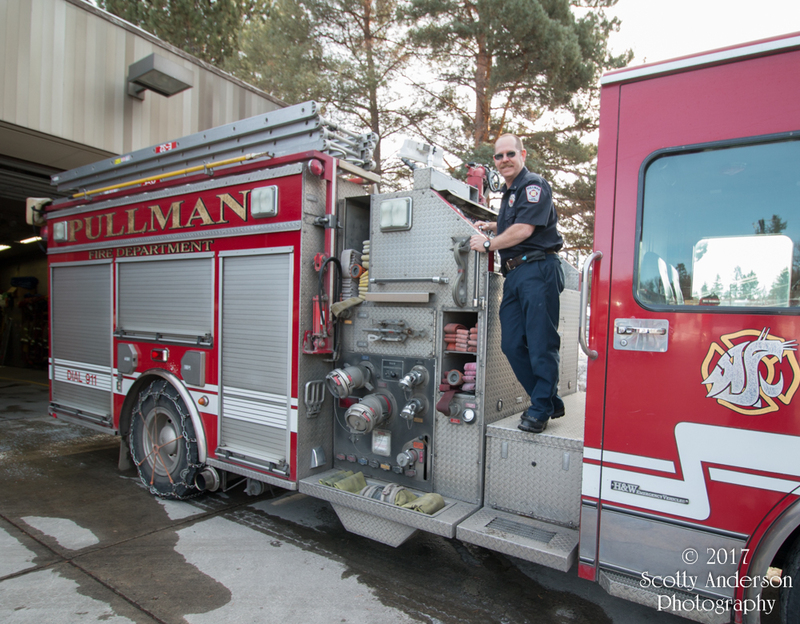 It also happens to be the engine Rudy requested for that purpose. 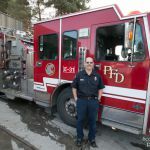 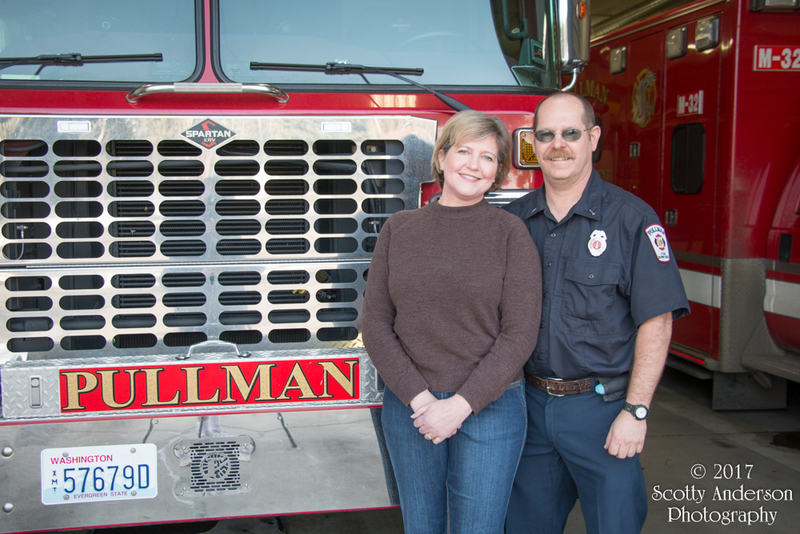 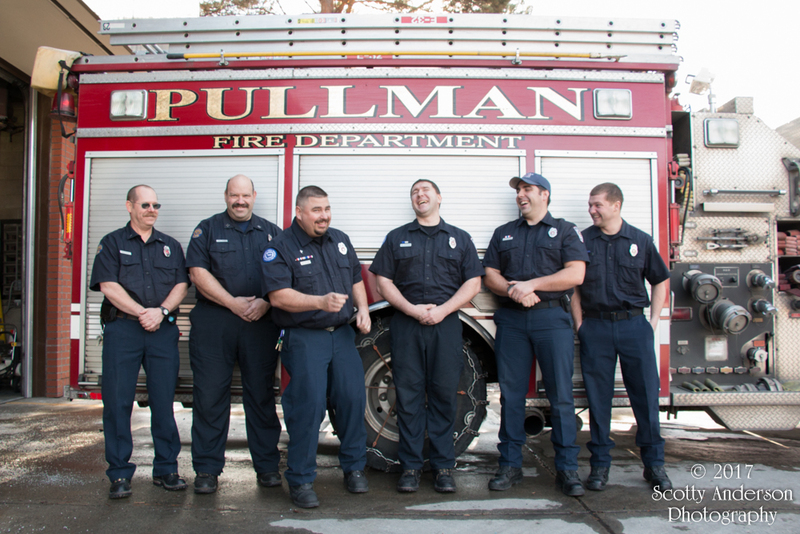 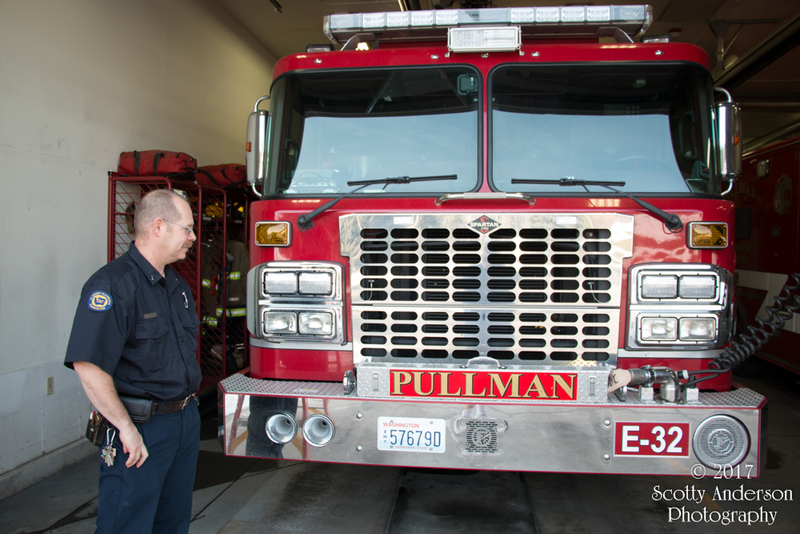 I asked Rudy to look back at the Pullman Fire Department he joined 25 years ago compared to today. 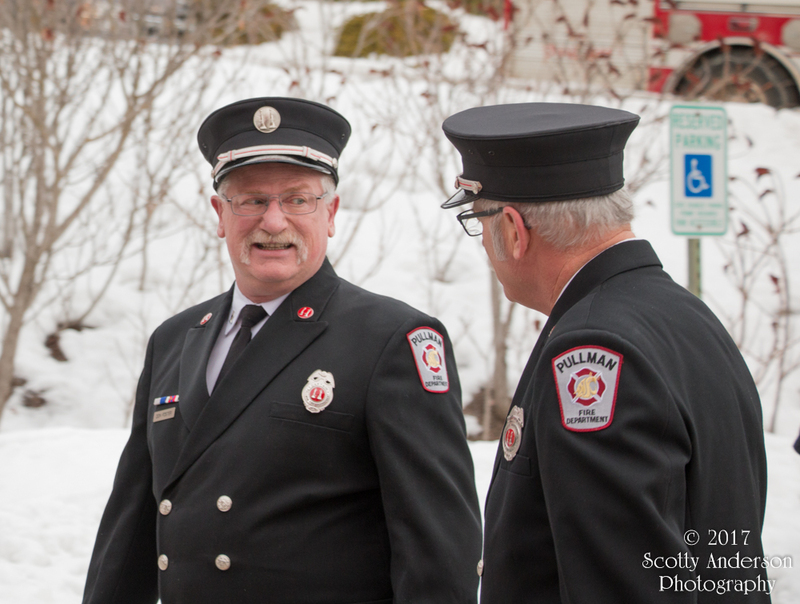 I then asked what he thought was the most important/best change that had taken place. 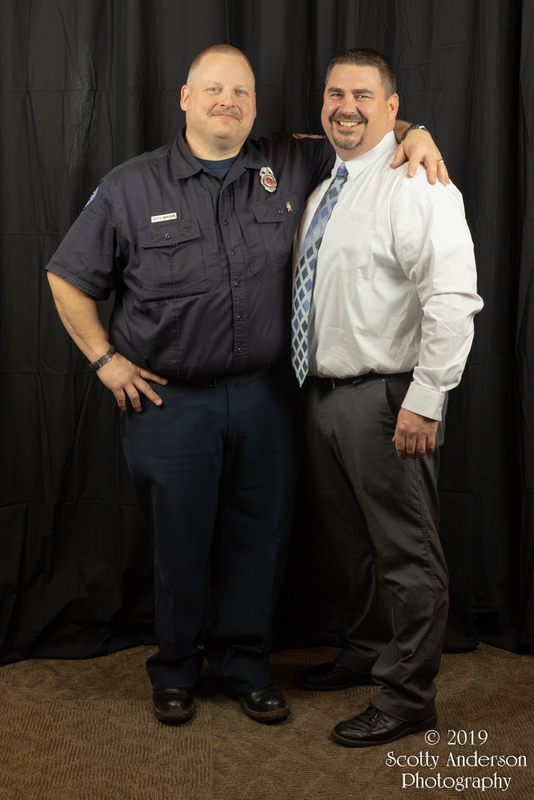 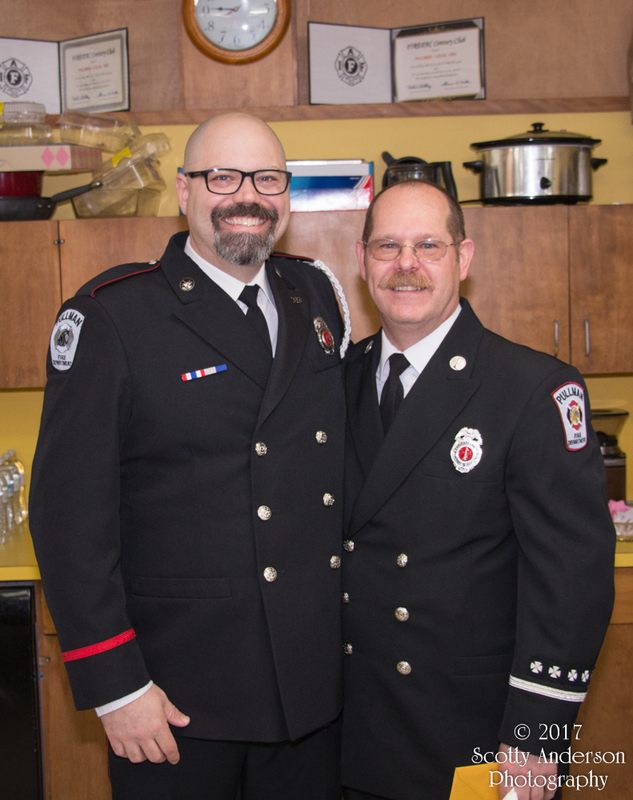 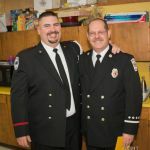 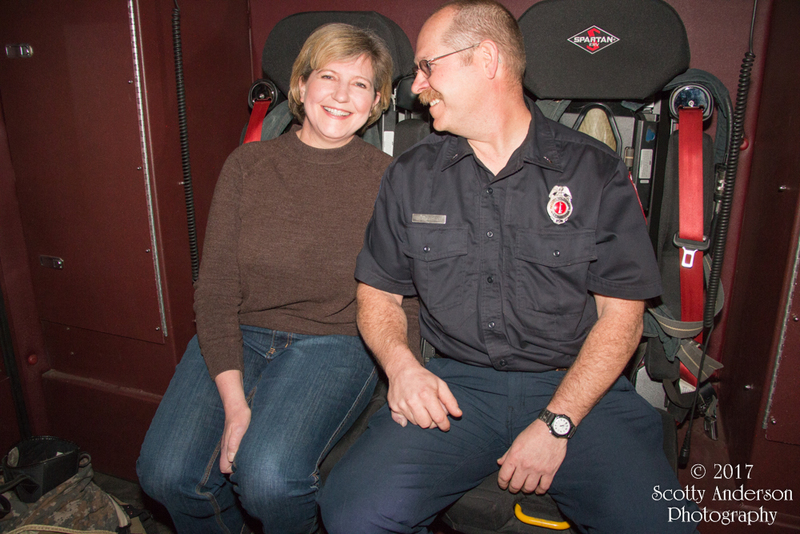 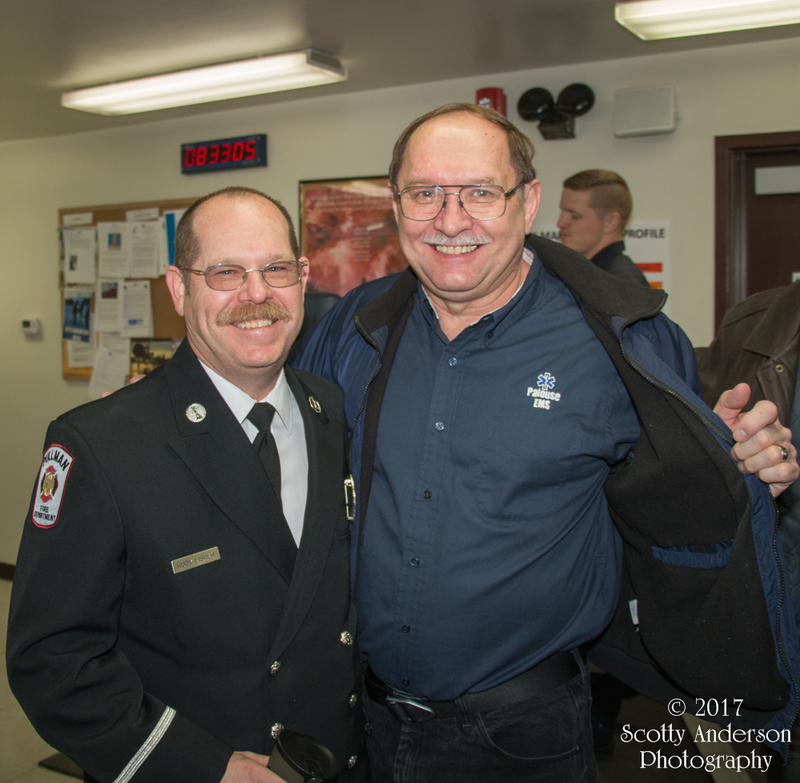 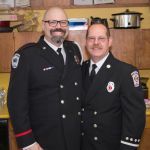 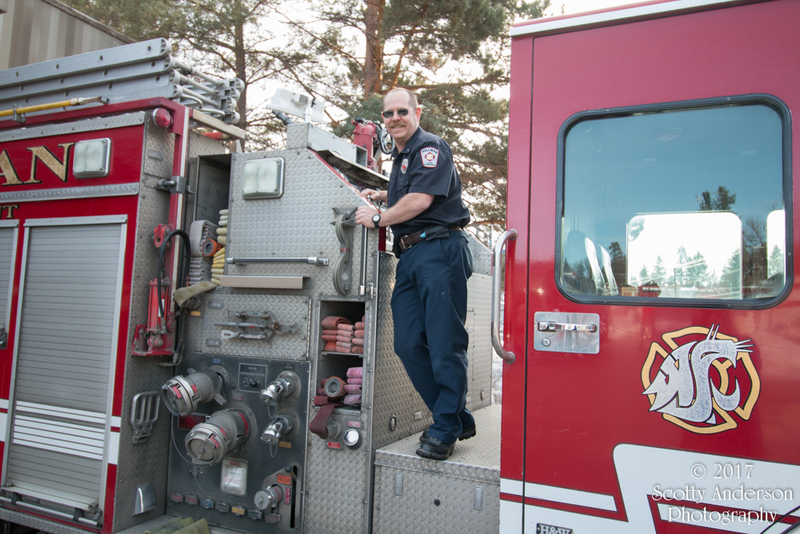 Rudy said “Transitioning from a BLS (Basic Life Support) service to ALS (Advanced Life Support) [emergency medical] service.” Rudy was there for the transition and saw the difference that a paramedic can make in the positive outcome when someone is in dire straits. 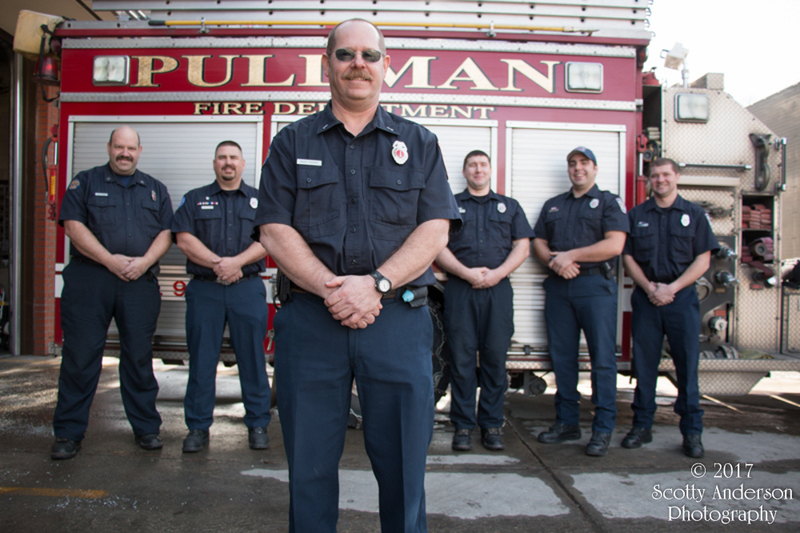 Thank you Lt. Rudy Fisher for your service to the City of Pullman and surrounding communities. 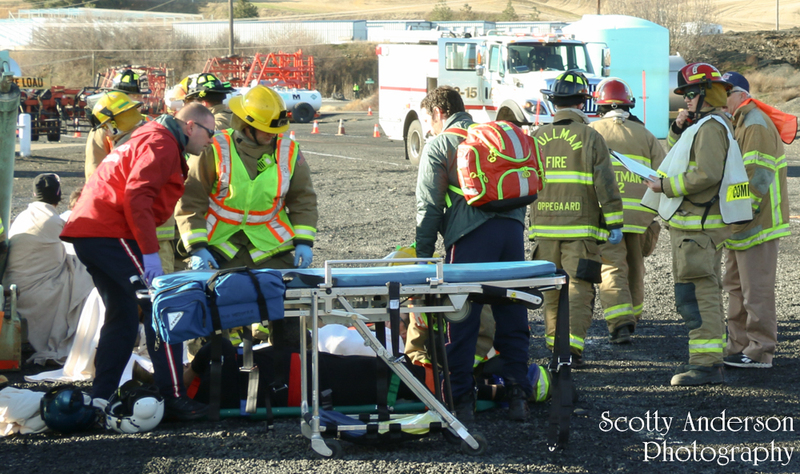 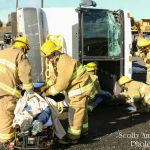 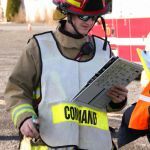 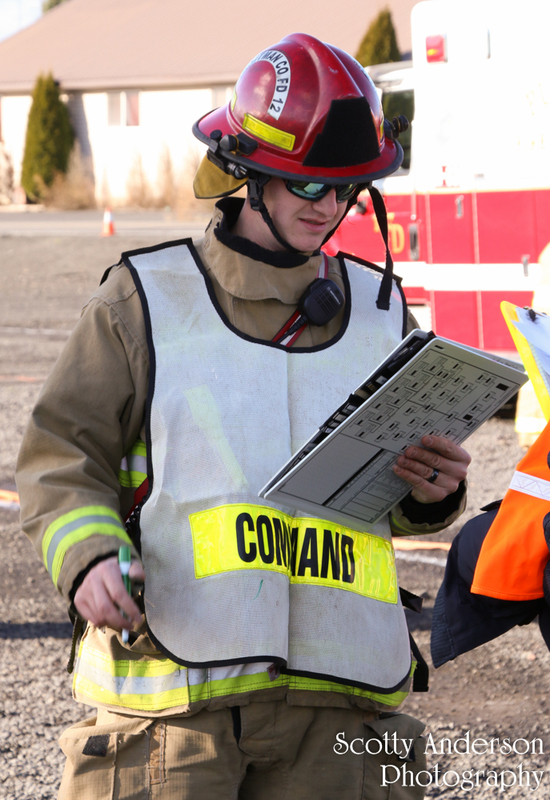 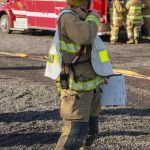 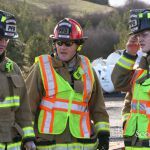 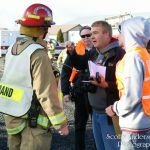 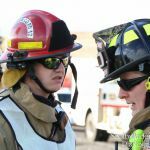 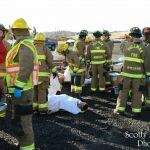 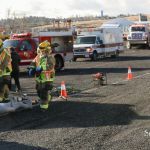 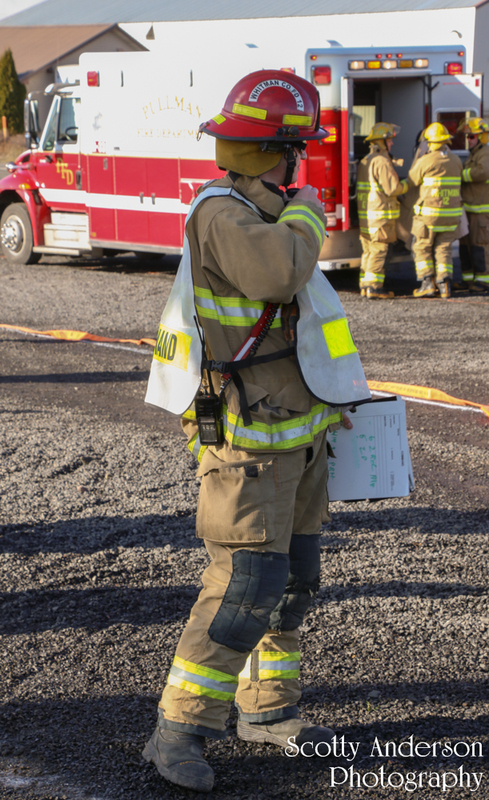 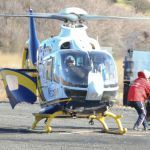 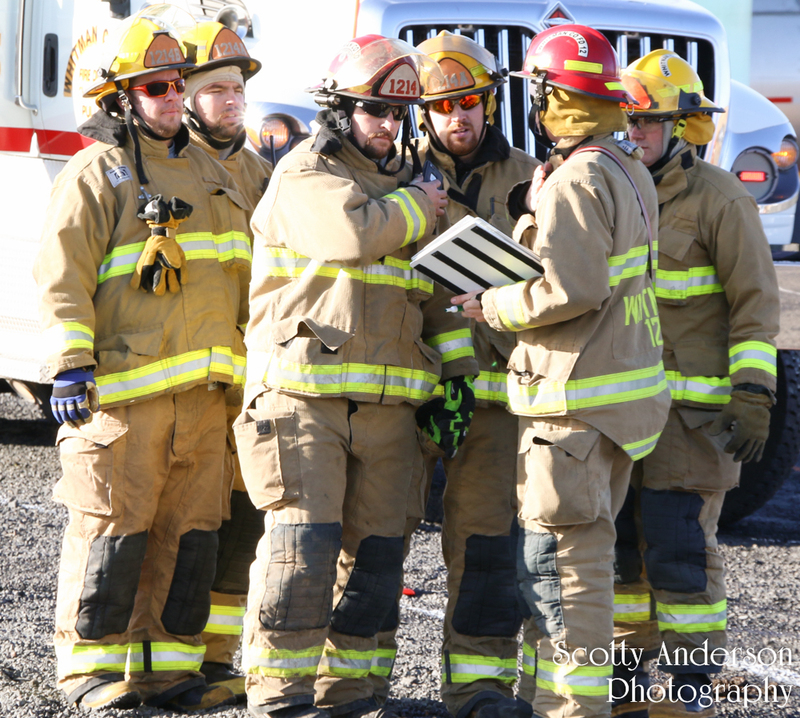 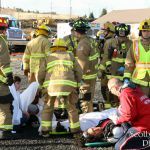 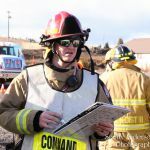 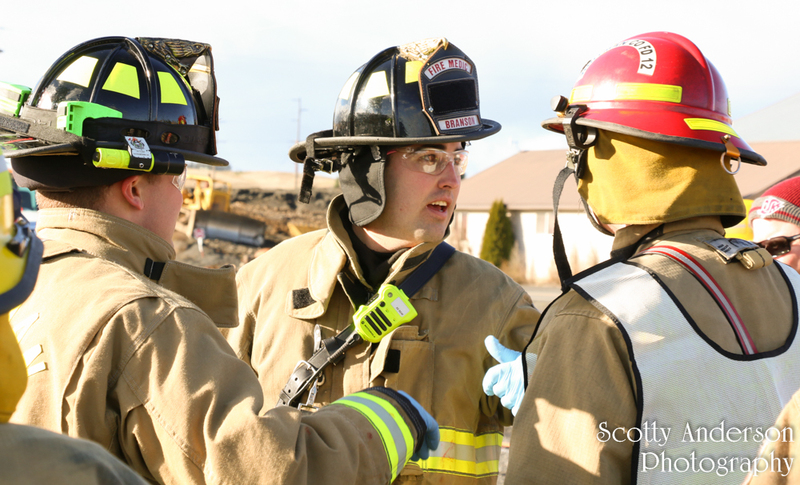 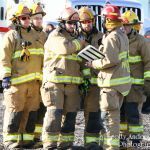 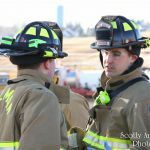 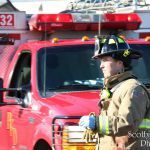 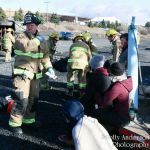 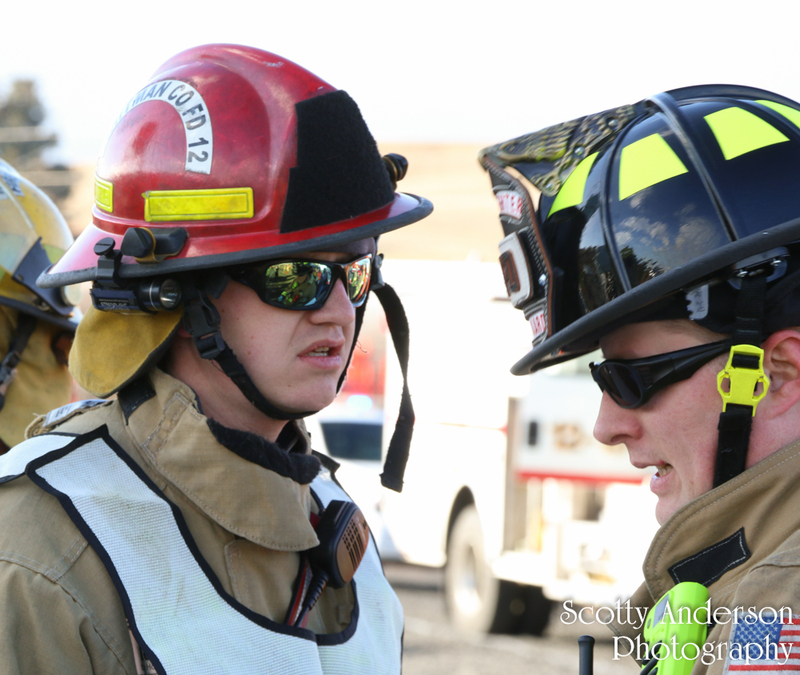 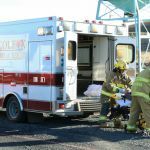 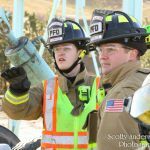 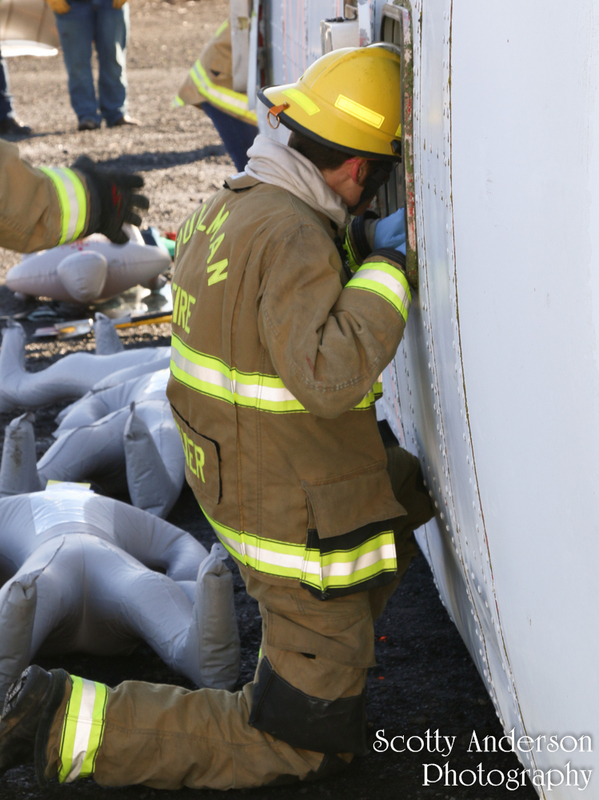 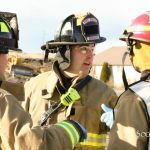 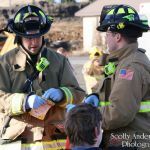 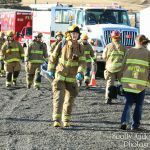 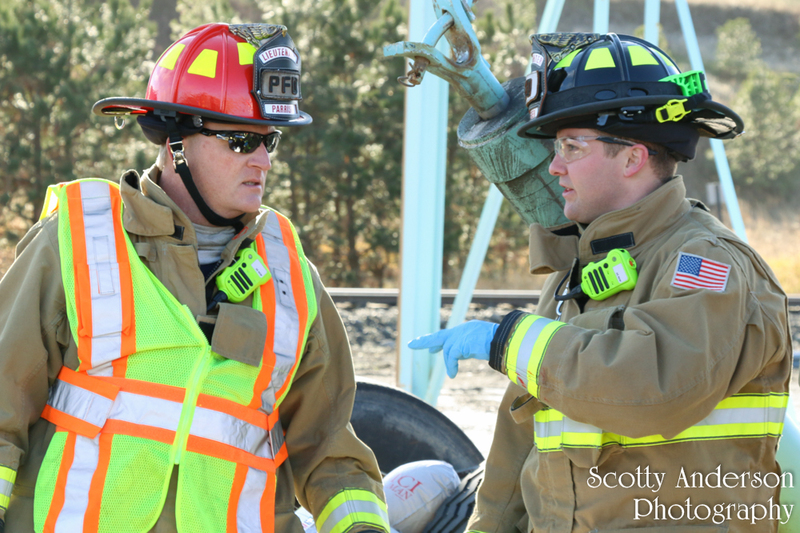 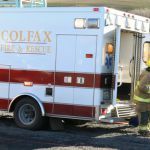 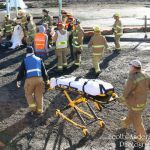 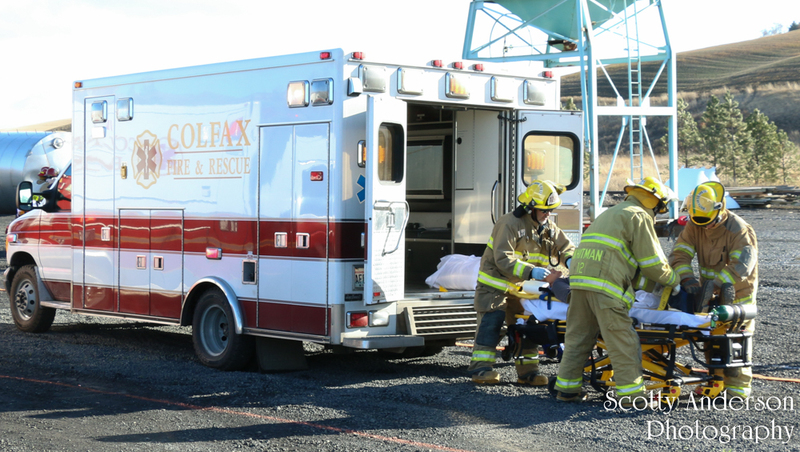 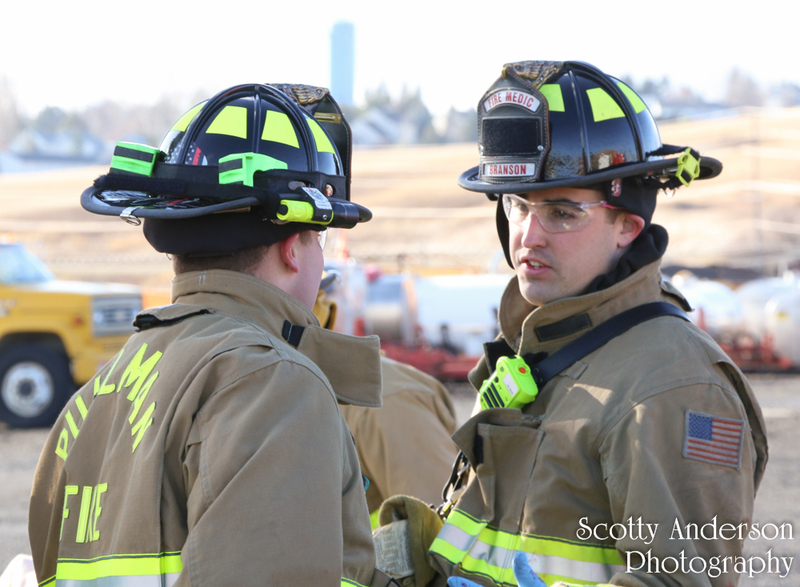 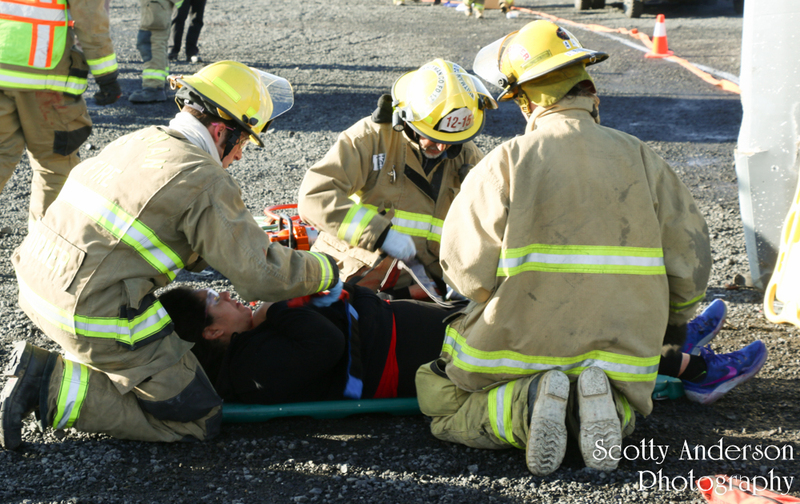 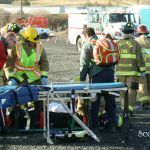 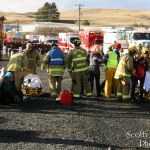 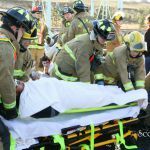 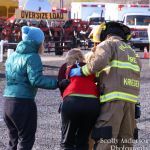 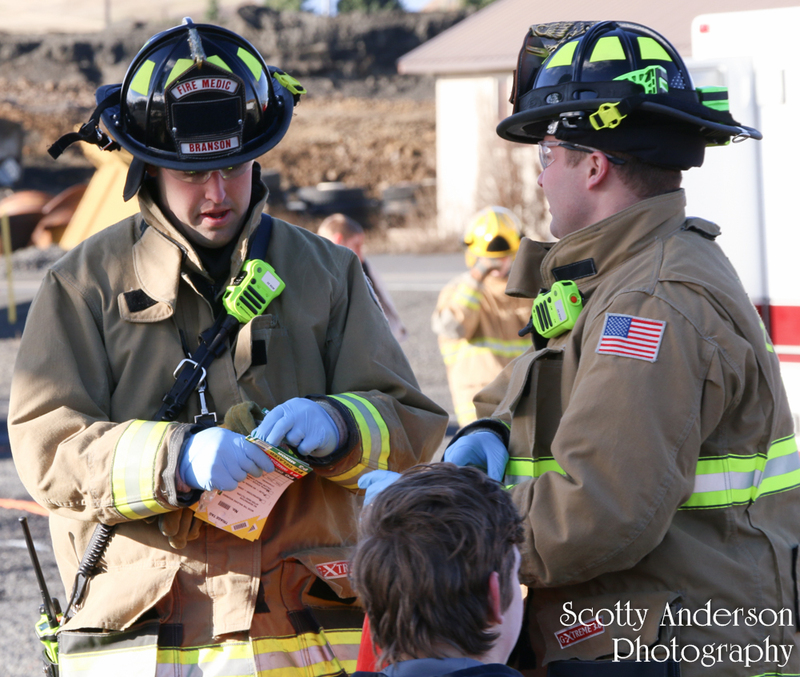 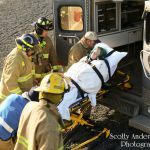 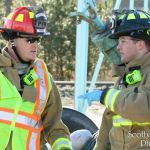 This afternoon there was a mass causality incident drill in which multiple fire and EMS agencies along with the three area hospitals took part. 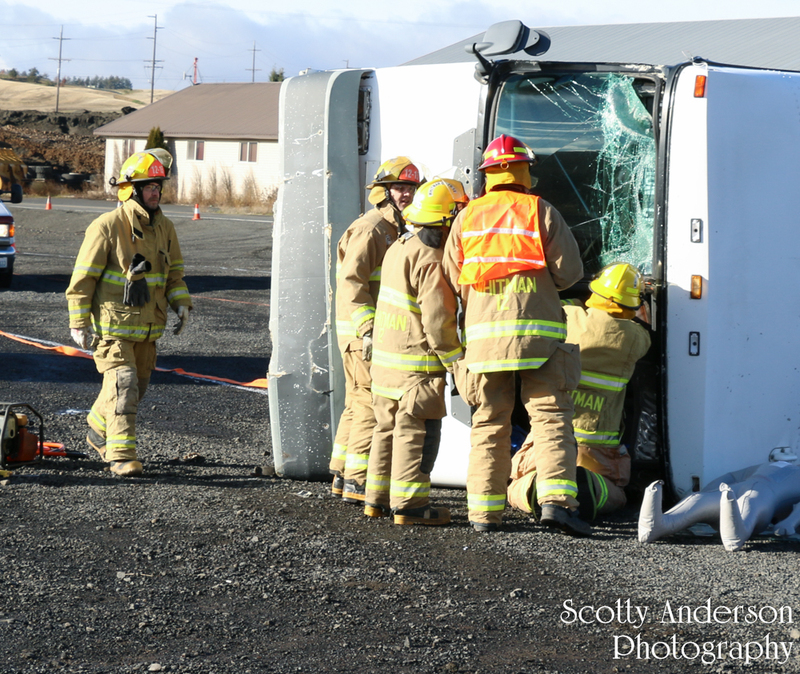 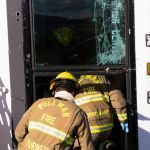 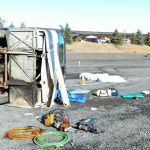 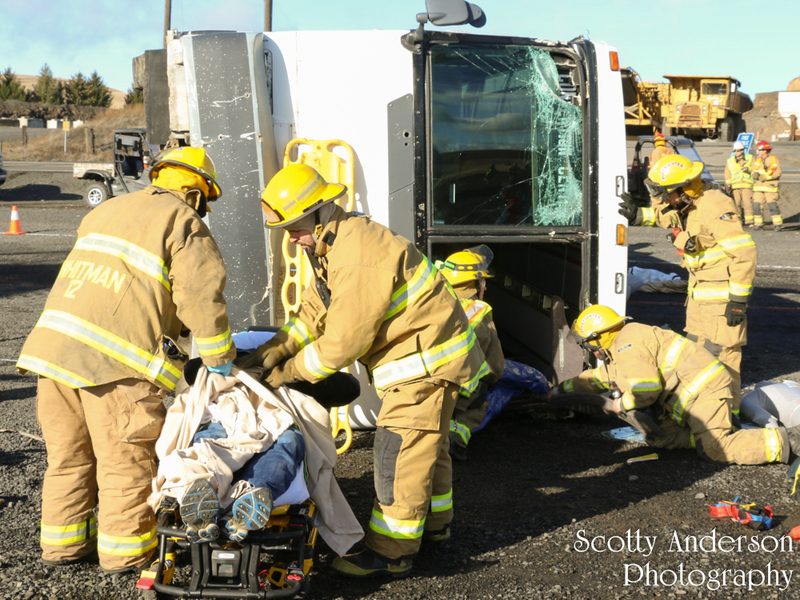 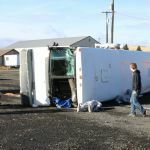 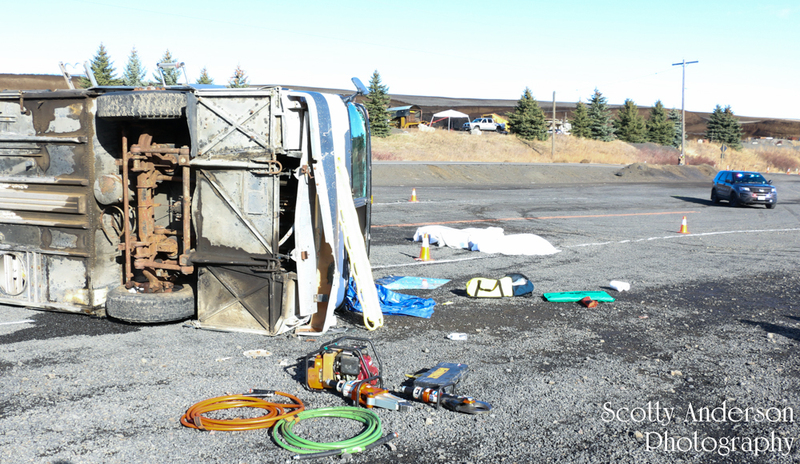 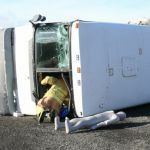 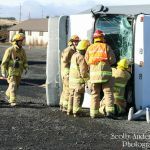 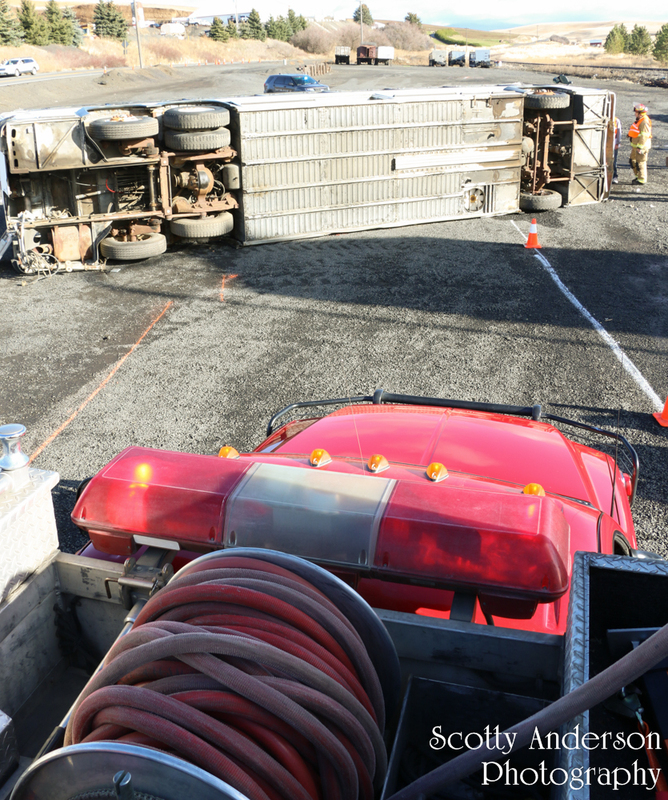 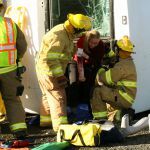 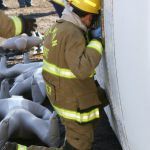 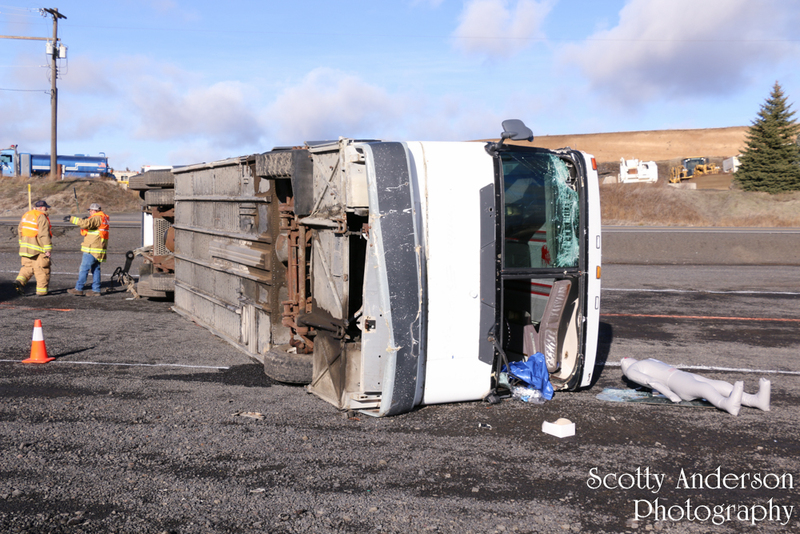 The scene was an overturned tour bus with approximately 25 patients. 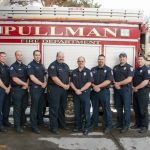 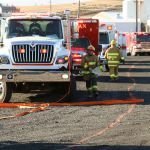 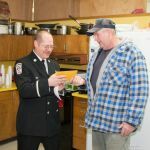 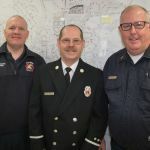 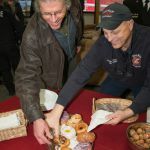 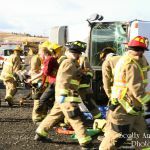 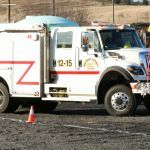 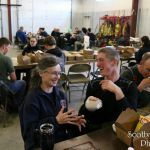 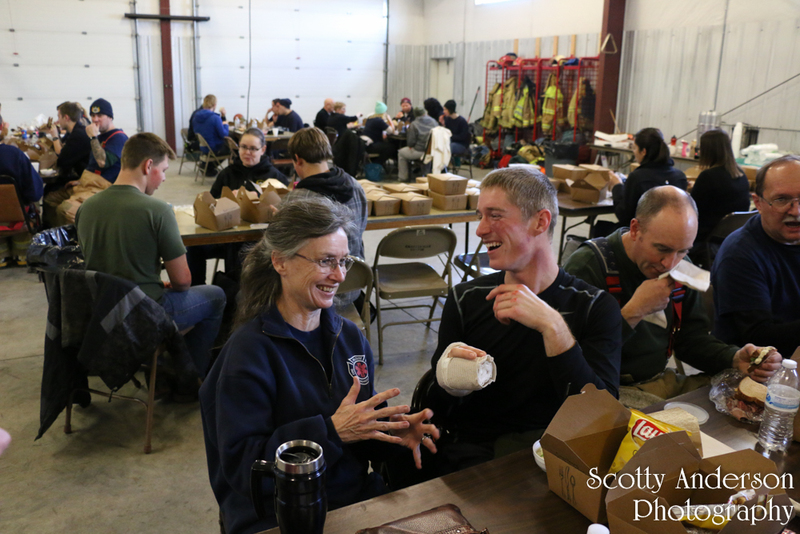 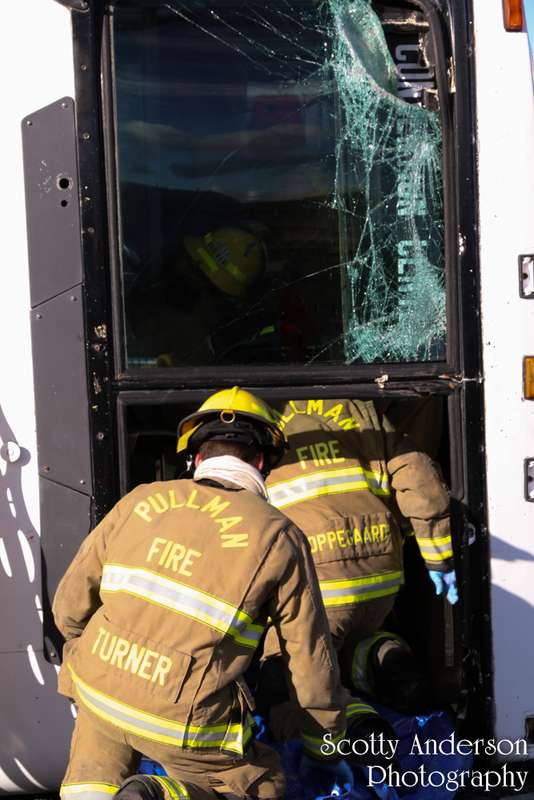 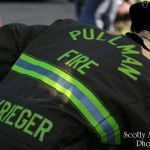 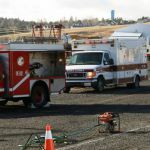 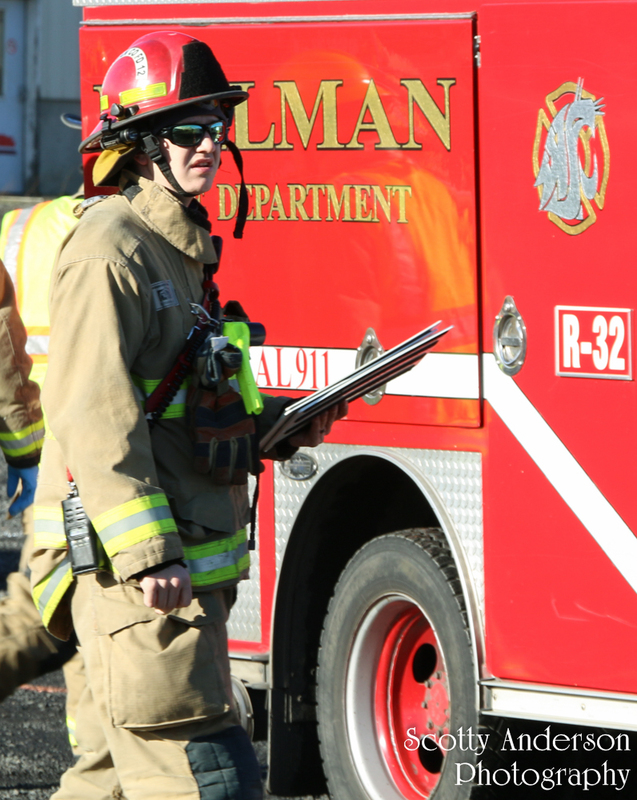 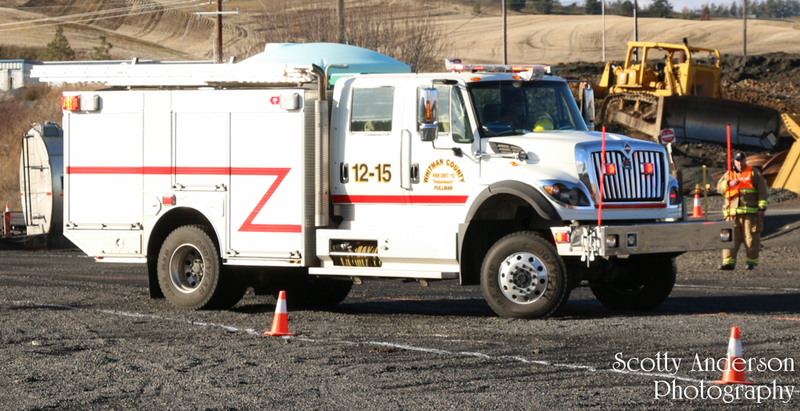 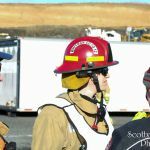 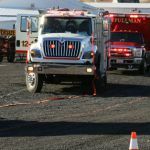 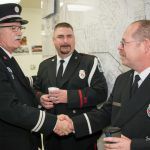 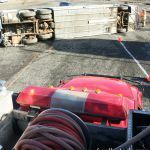 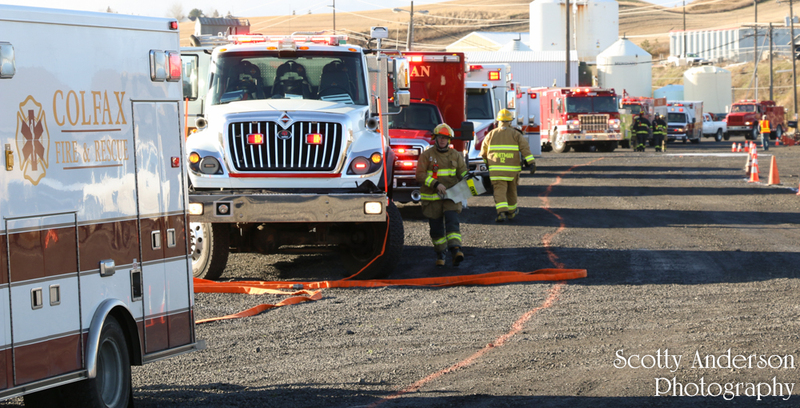 Responders came from Fire District 12, Fire District 11, Fire District 4, Albion Fire Department, Pullman Fire Department, and Pullman-Moscow Regional Airport Fire Department. 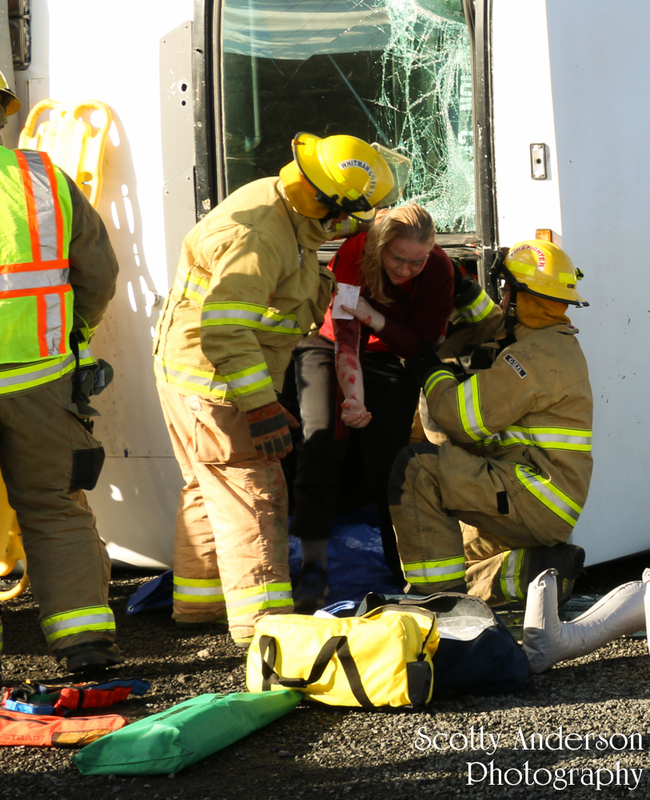 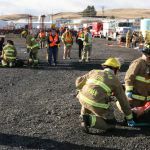 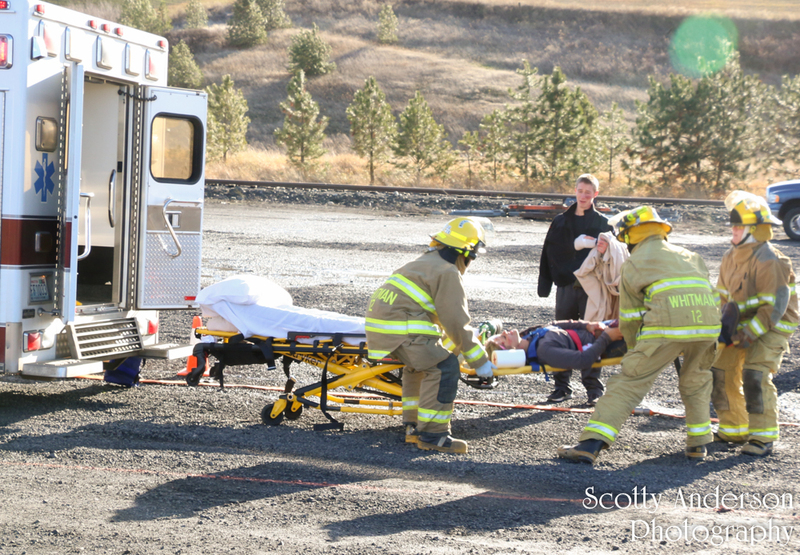 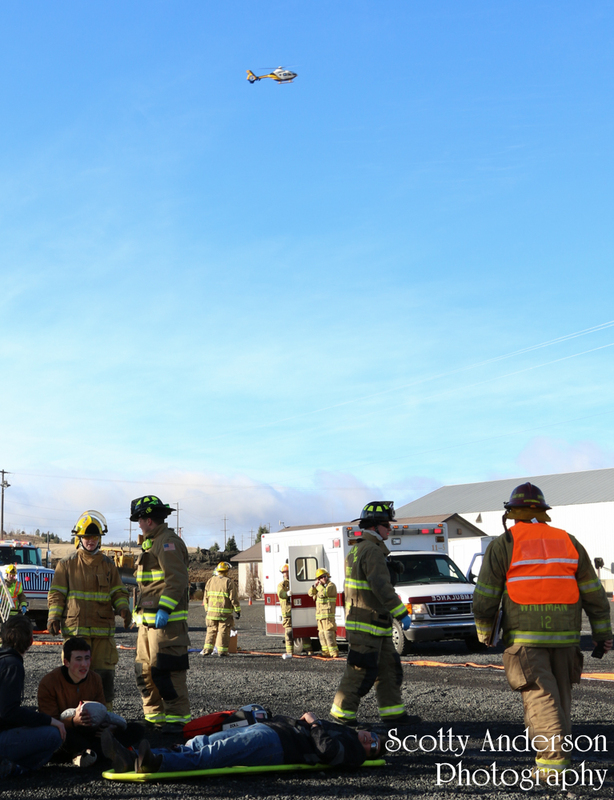 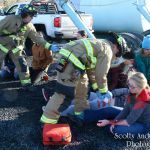 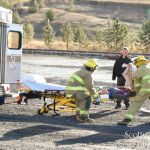 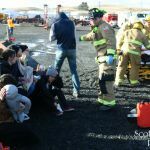 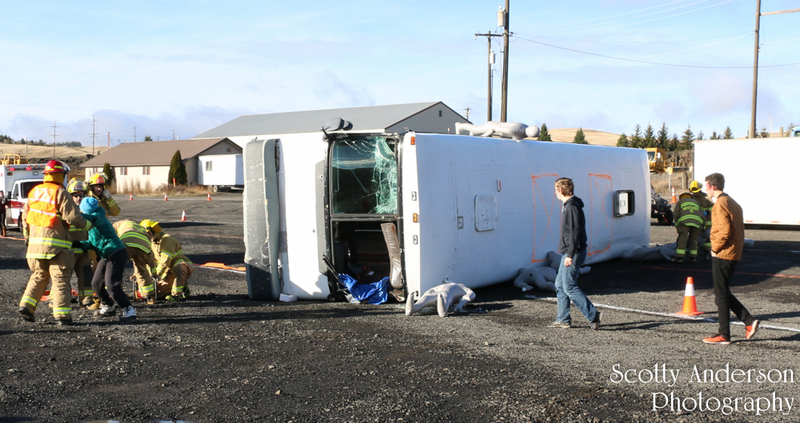 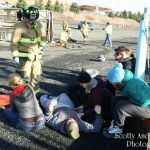 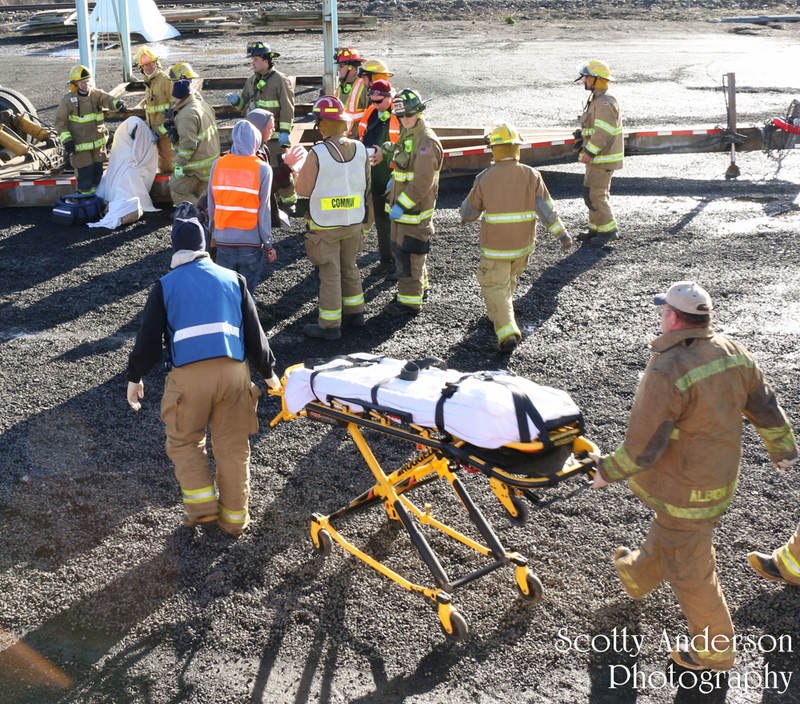 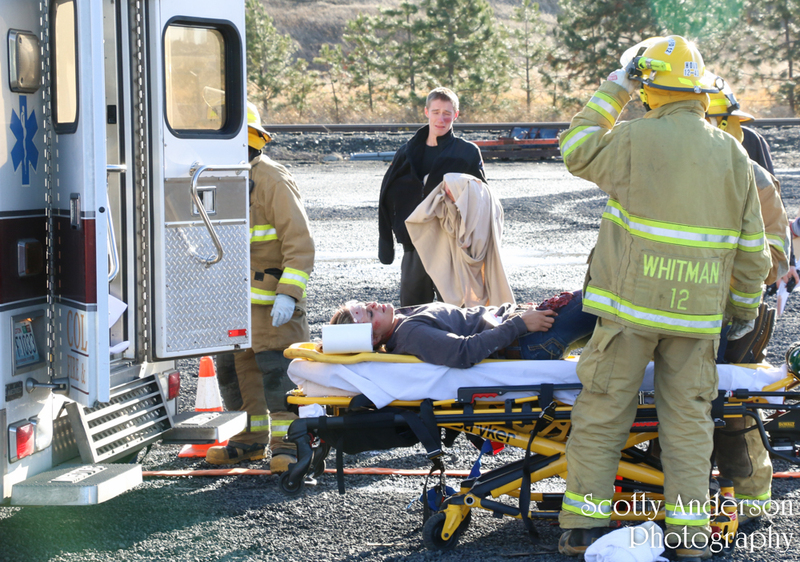 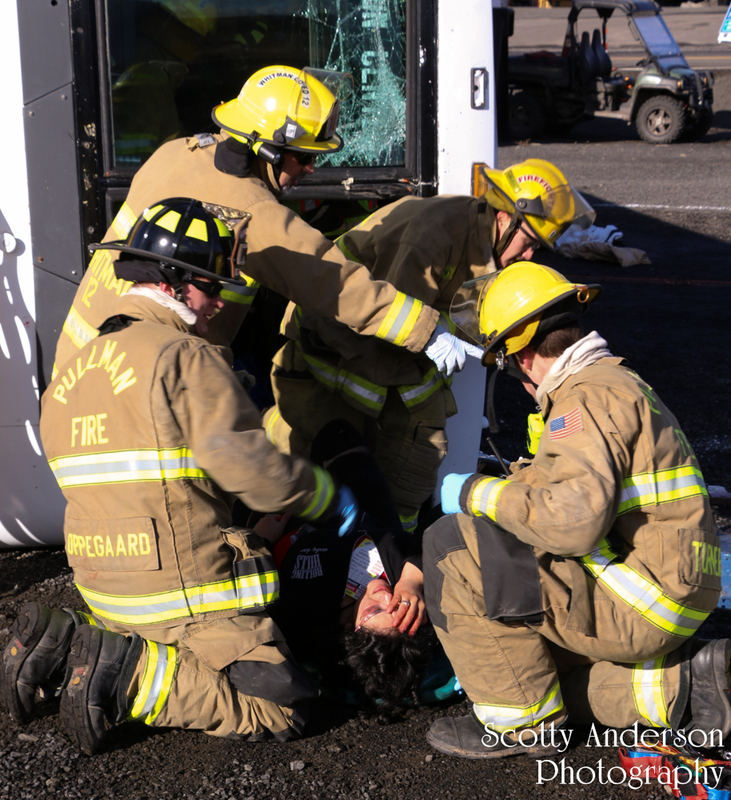 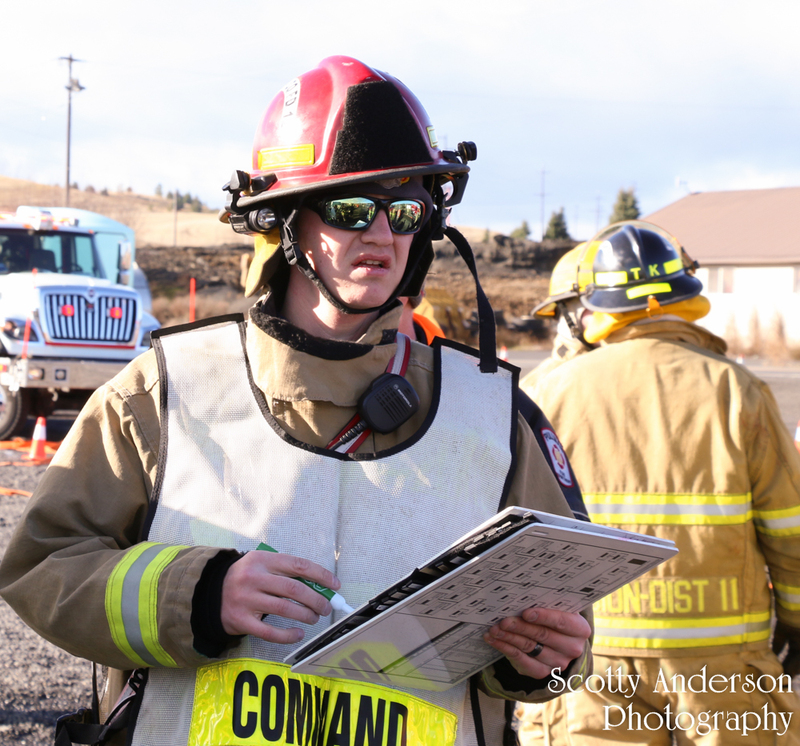 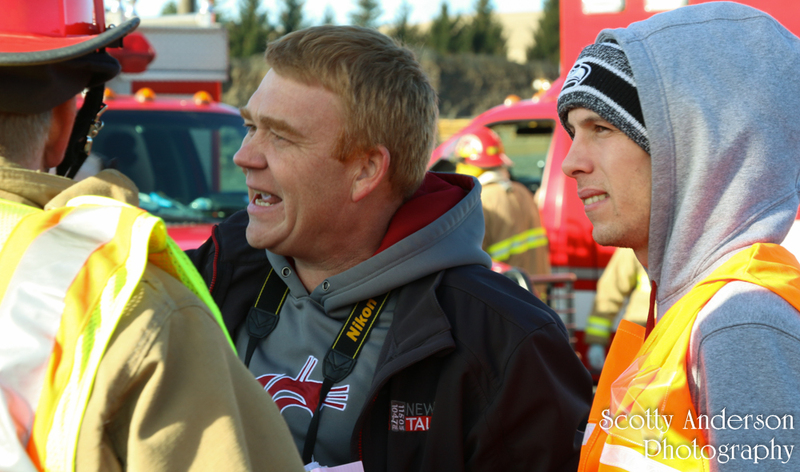 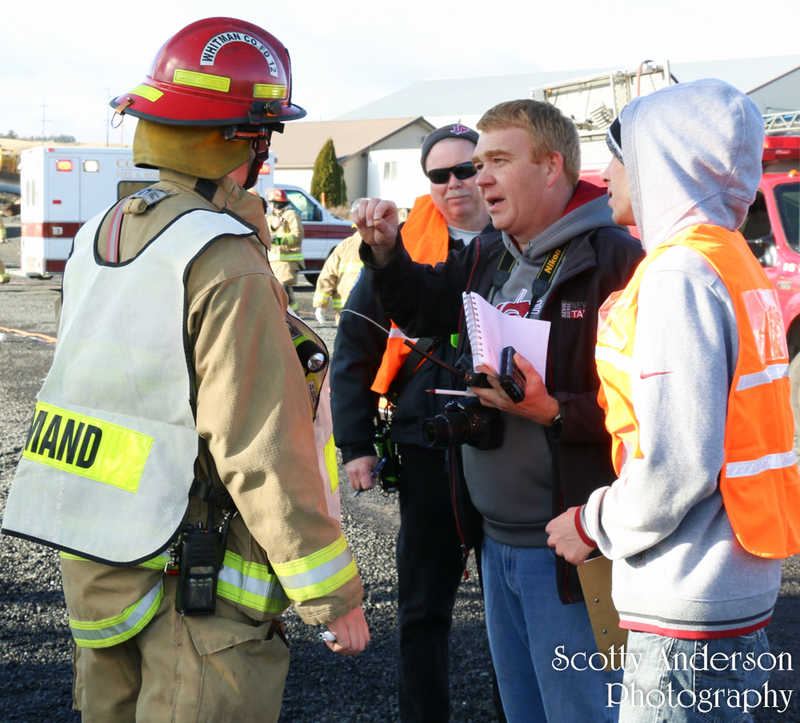 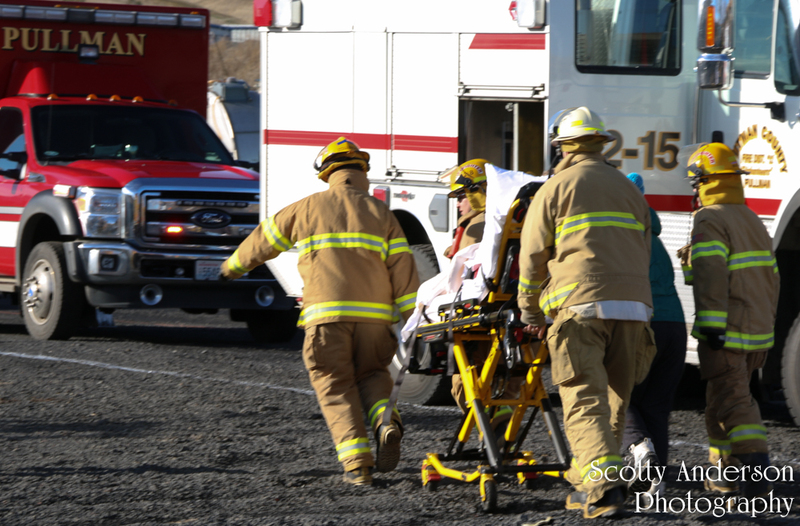 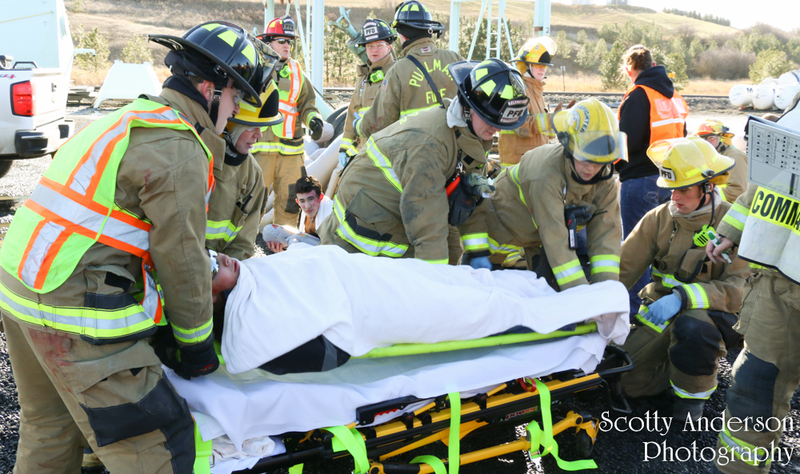 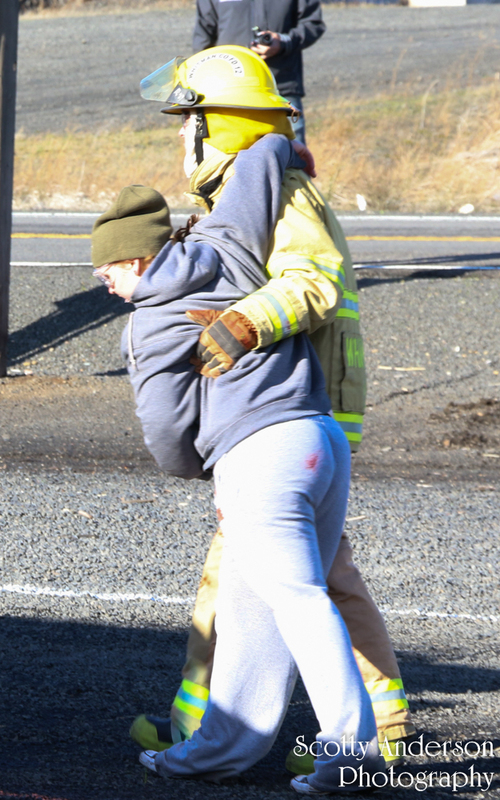 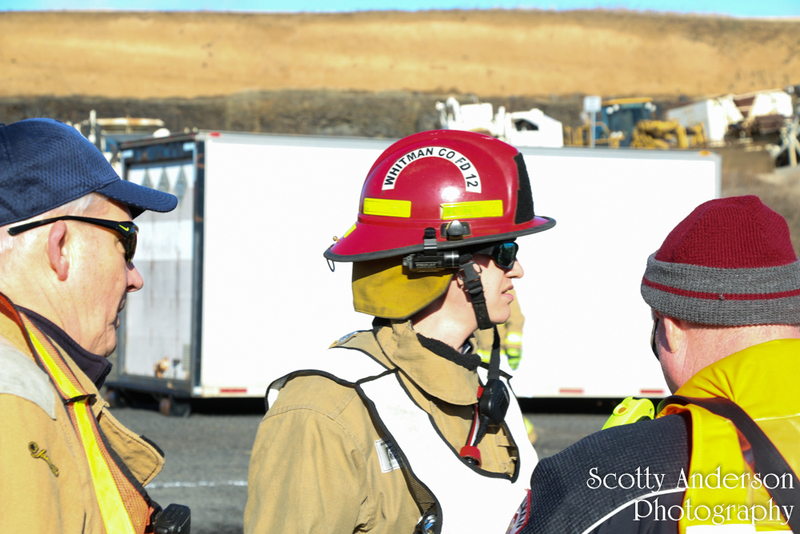 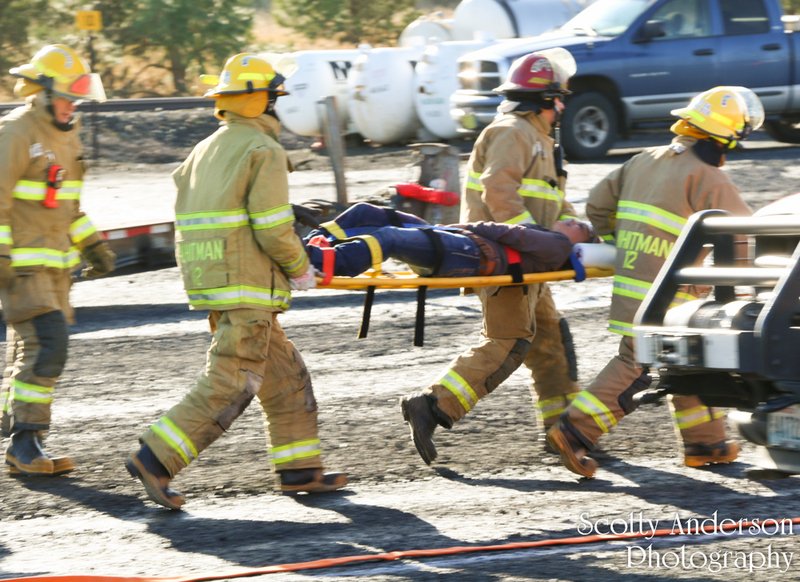 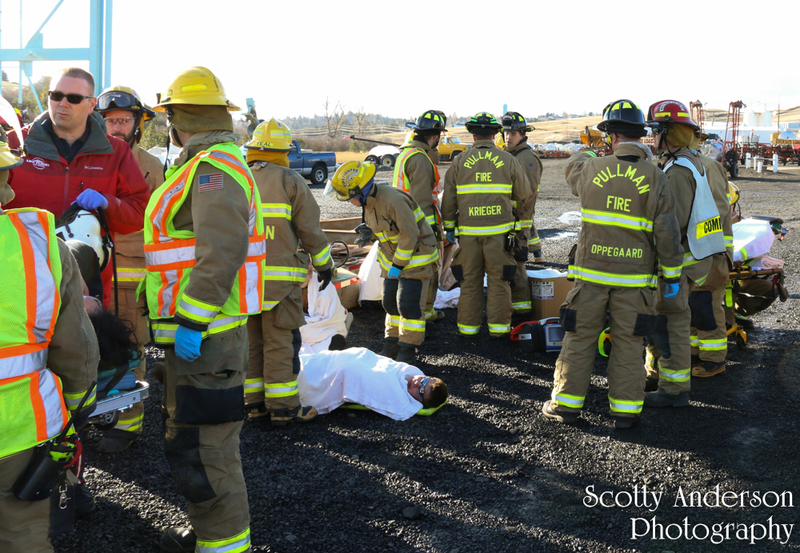 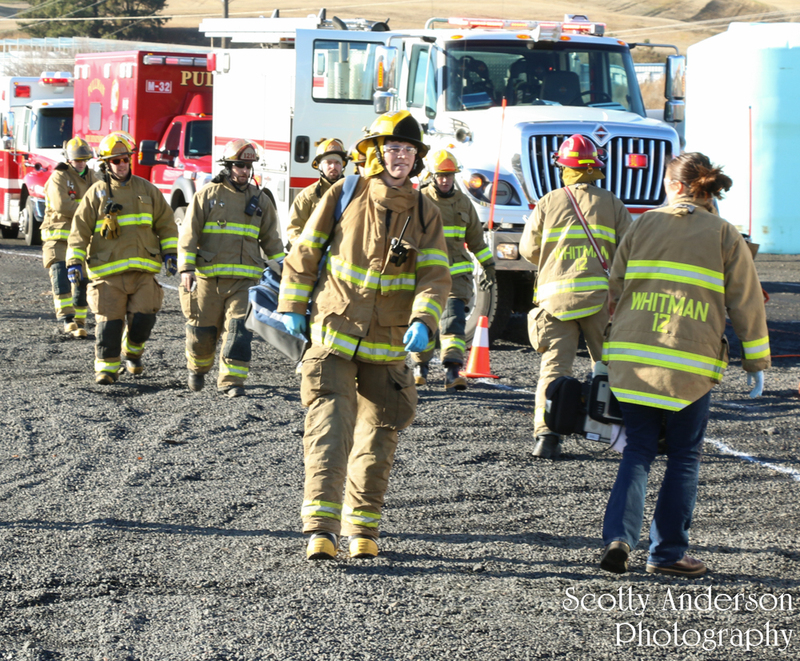 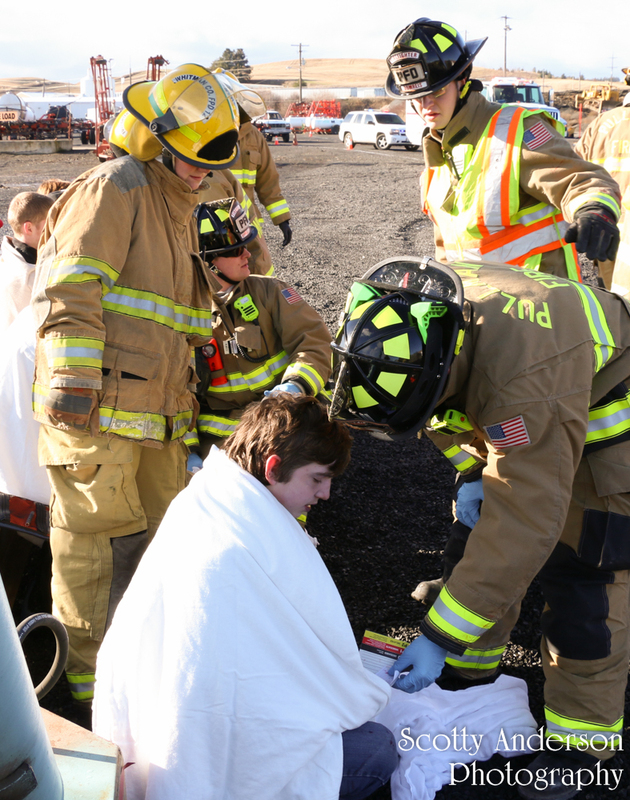 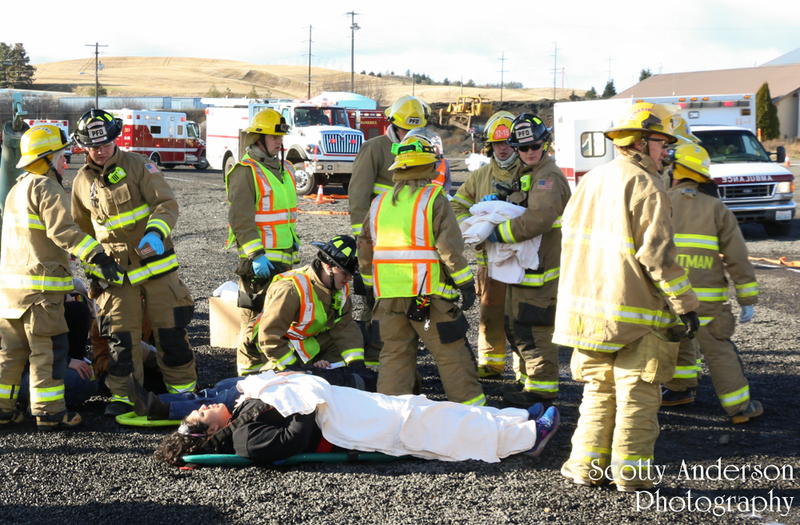 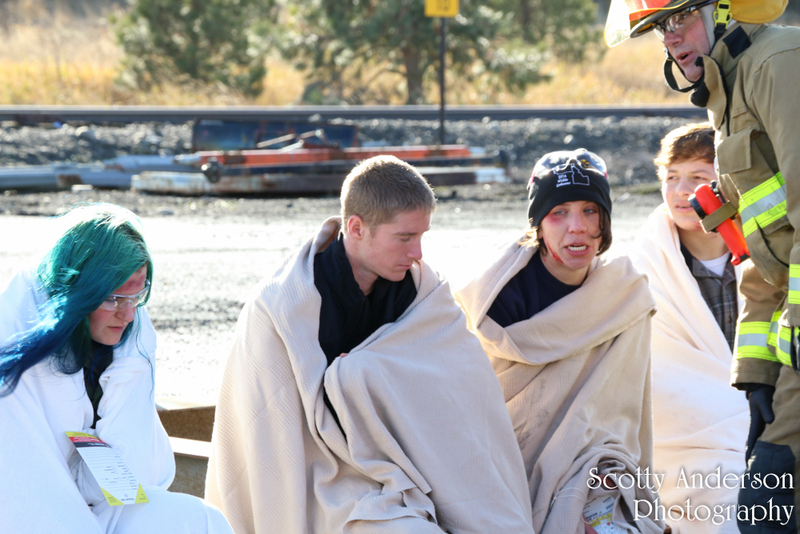 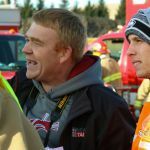 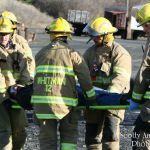 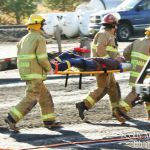 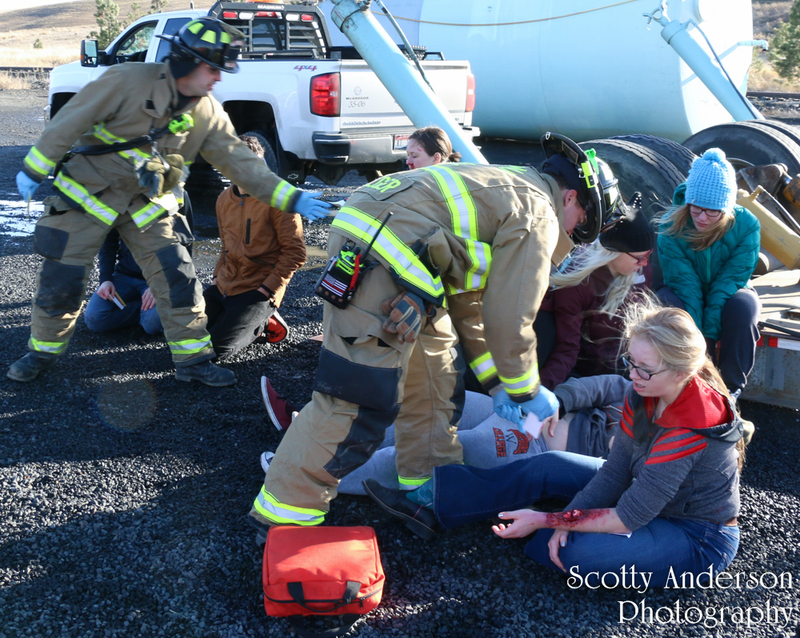 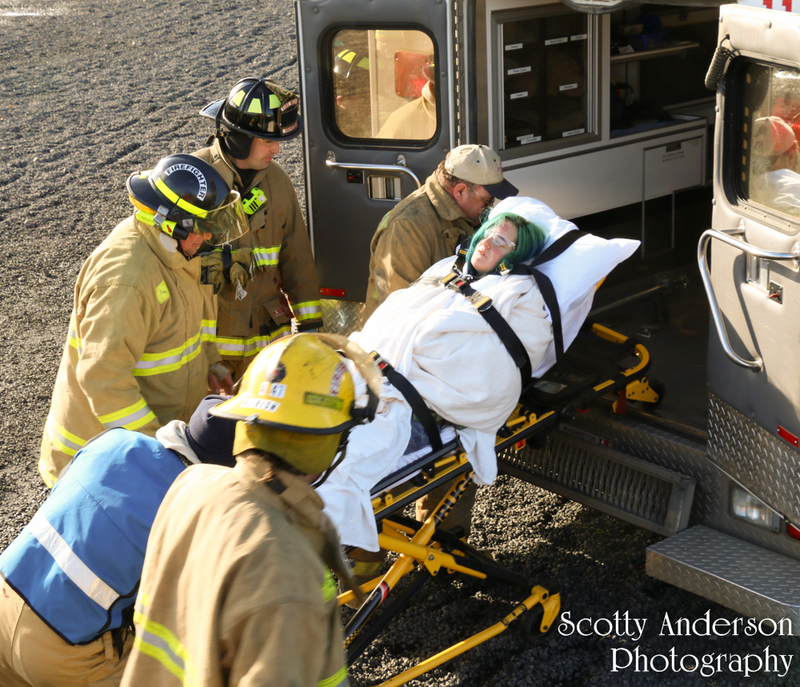 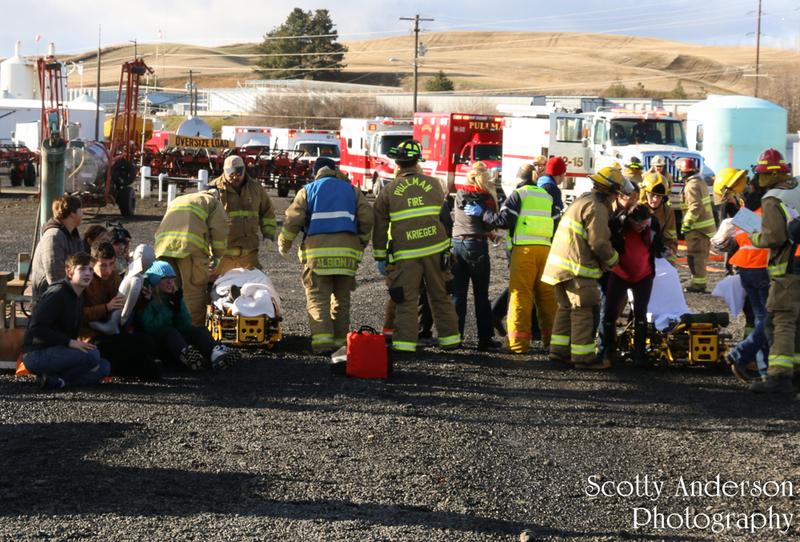 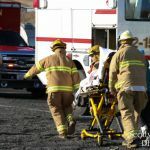 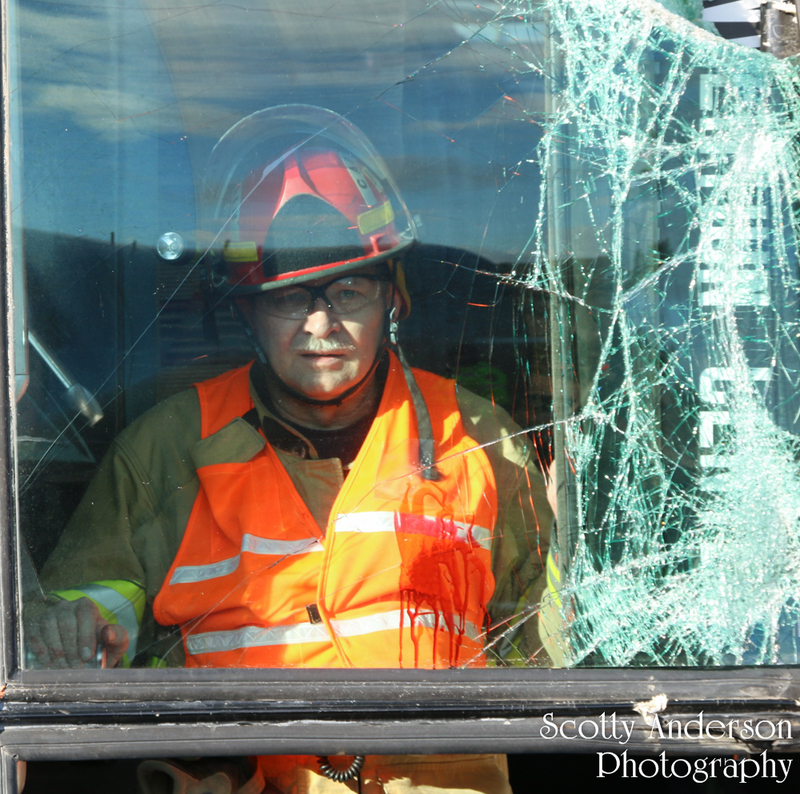 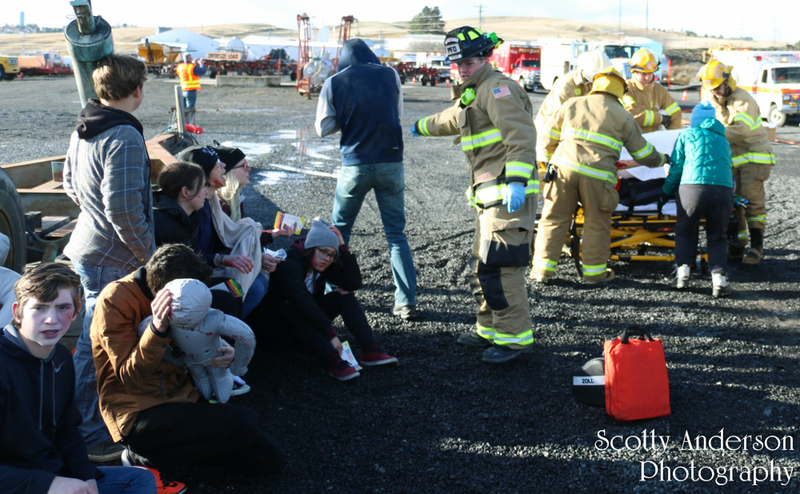 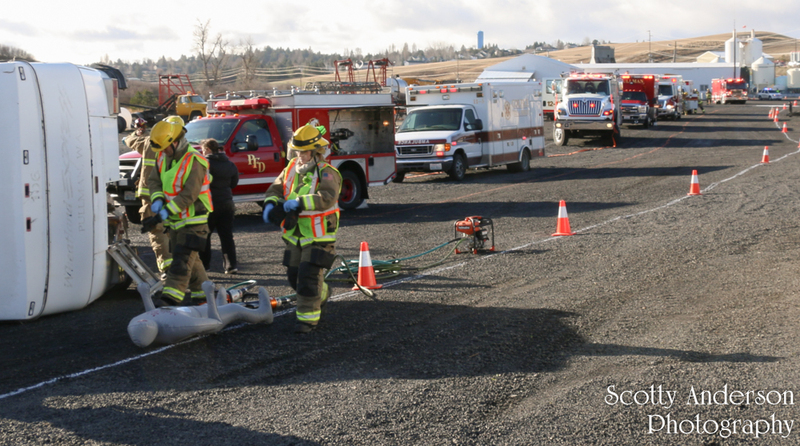 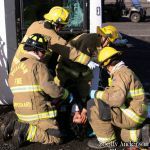 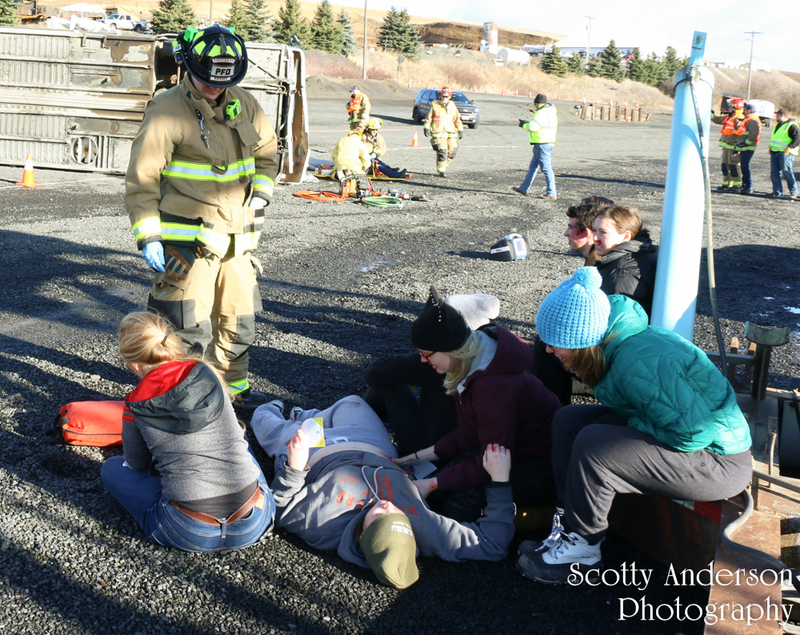 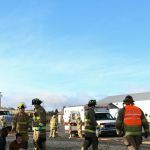 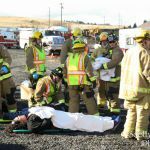 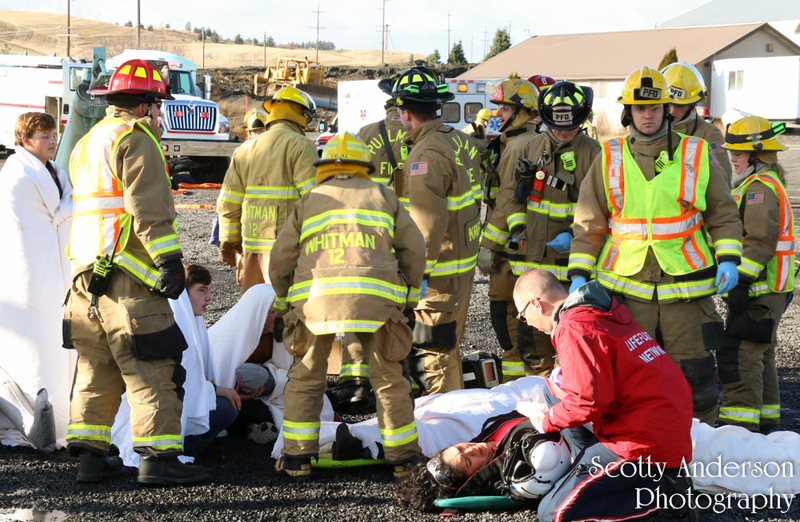 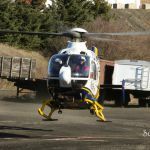 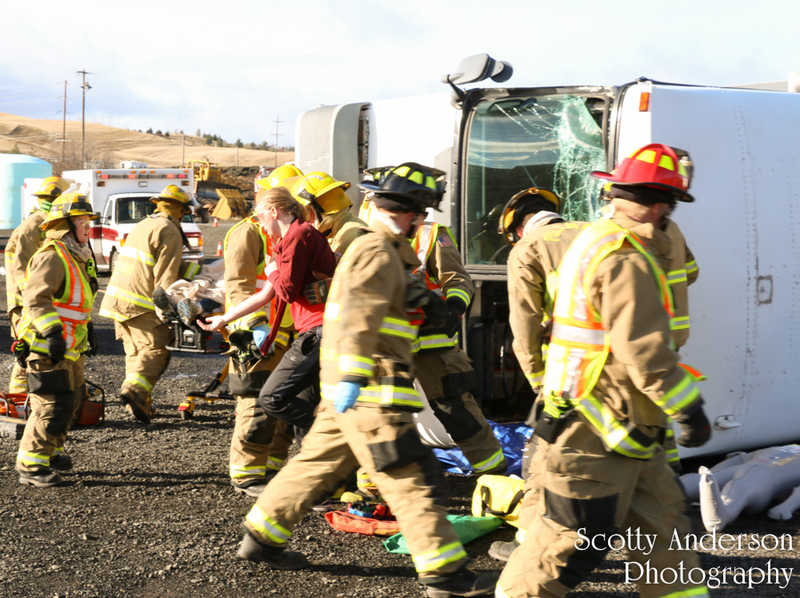 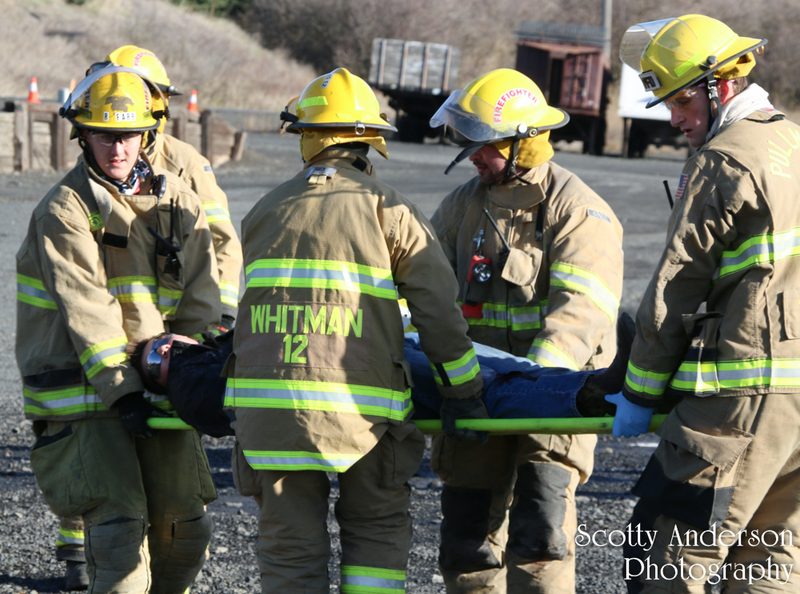 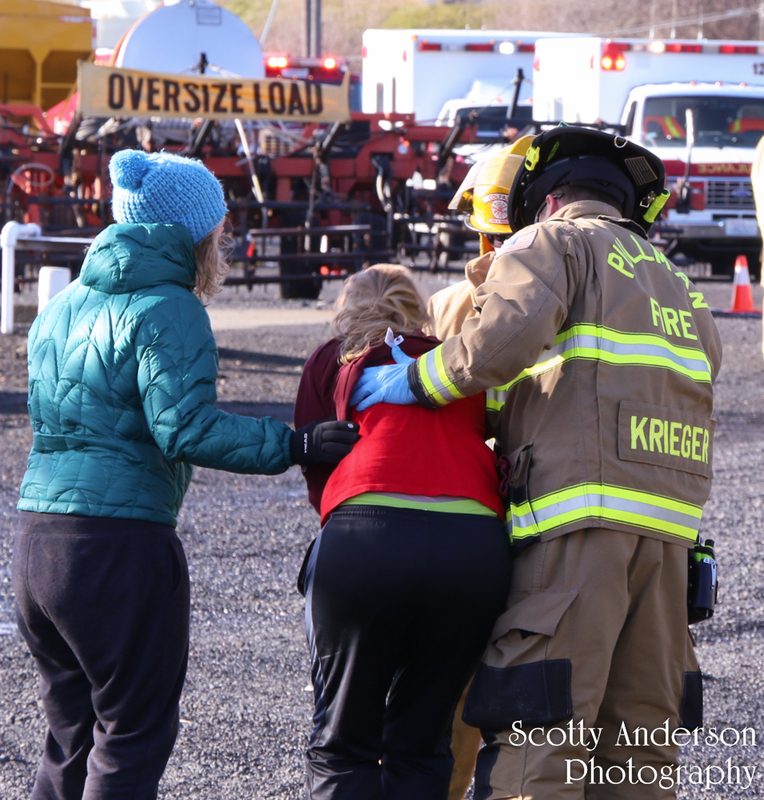 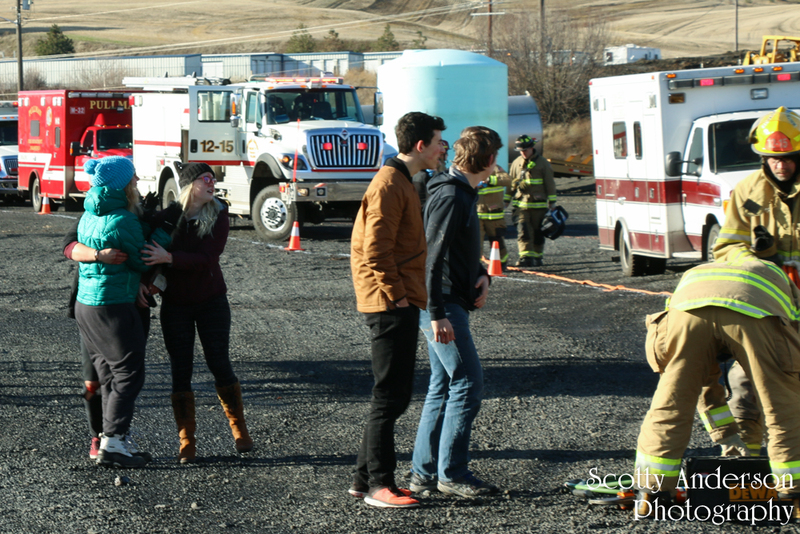 The Whitman County Sheriff’s Office and Lifeflight also participated in this drill. 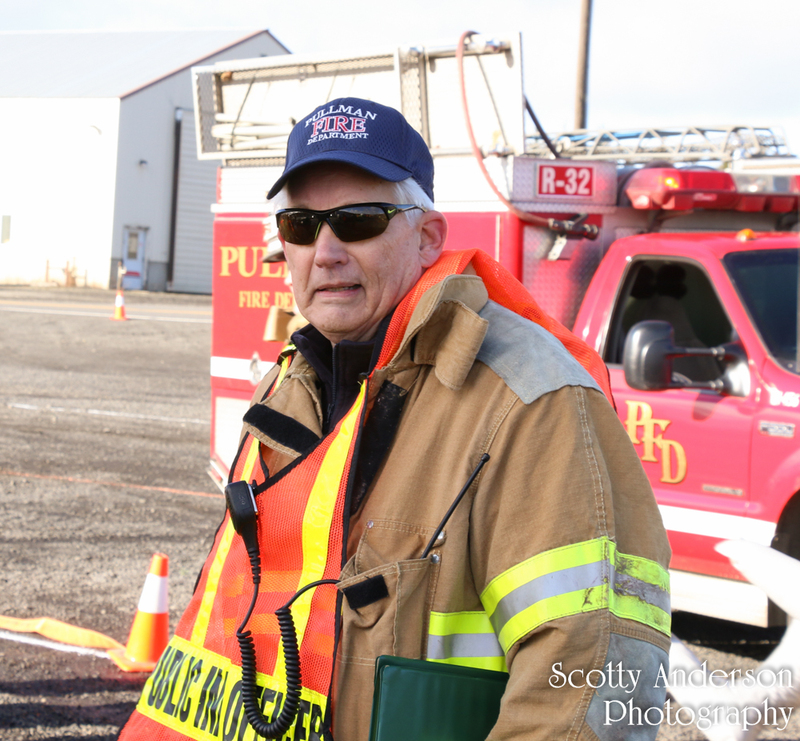 The Incident Commander was FD12 Captain Eric Gibson. 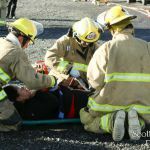 I had the opportunity to shoot the photographs during the drill.